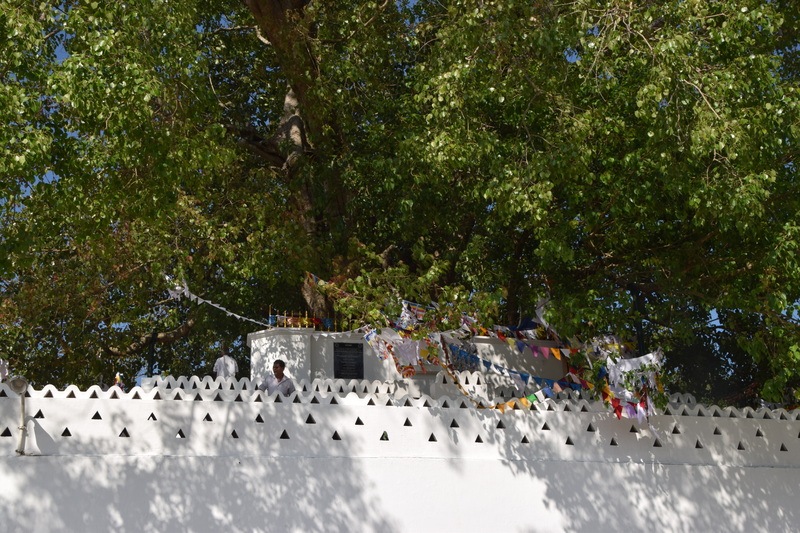 It was again great to wake up to the chirping of birds and somewhere far away, we could hear some singing going on – we could not guess whether it was Buddhist, Hindoe or Christian but it was very pleasant to hear. 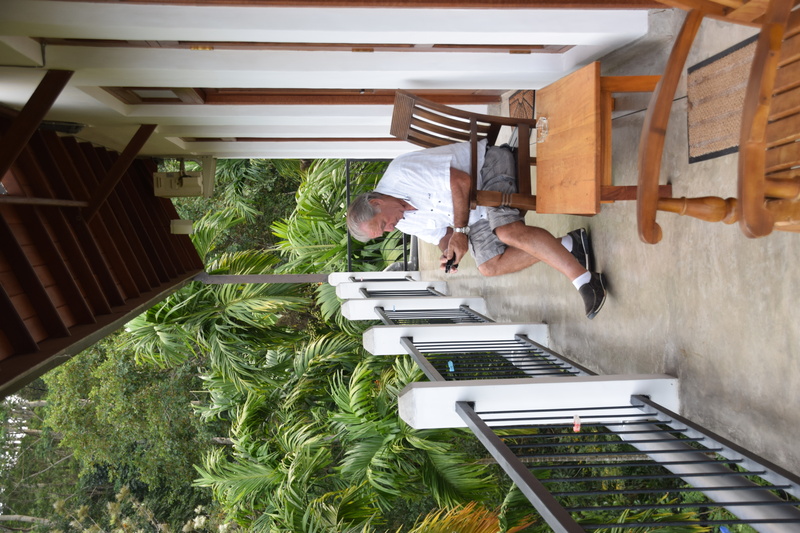 From our verandah I could sense that it was a Sunday – there was a peaceful and relaxed atmosphere. Before going down for breakfast, we had rearranged our luggage so as not to have any loose bags and we managed to get everything packed. 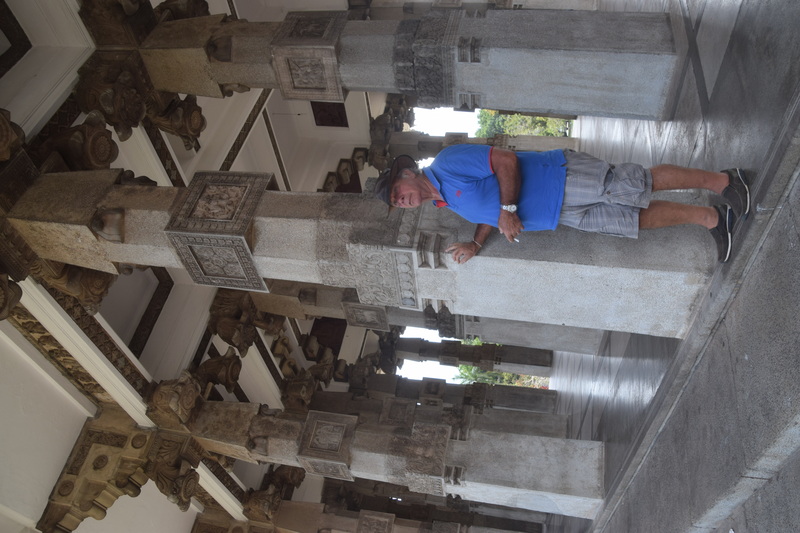 It’s a wonder how it seems our luggage got heavier on the way while we have not exactly bought anything bulky – only some spices and some small wooden carvings……. Indika was already waiting for us when we were ready – polished and clean. Indika, ready to take us to Colombo inhis polished and clean car. 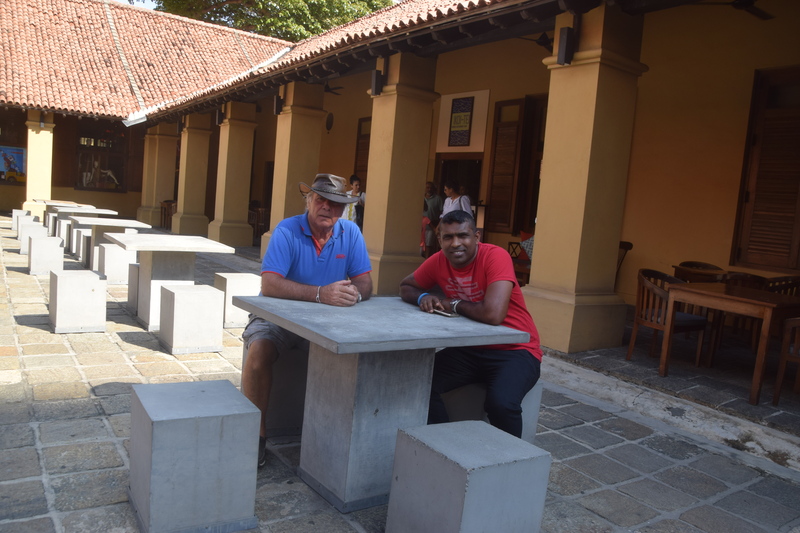 When all our luggage was packed into the car and we were on the way out of Bentota along the sea front, Indika told us that we would be stopping just outside Colombo to meet with Randima, my travel consultant at Olanka Travel. 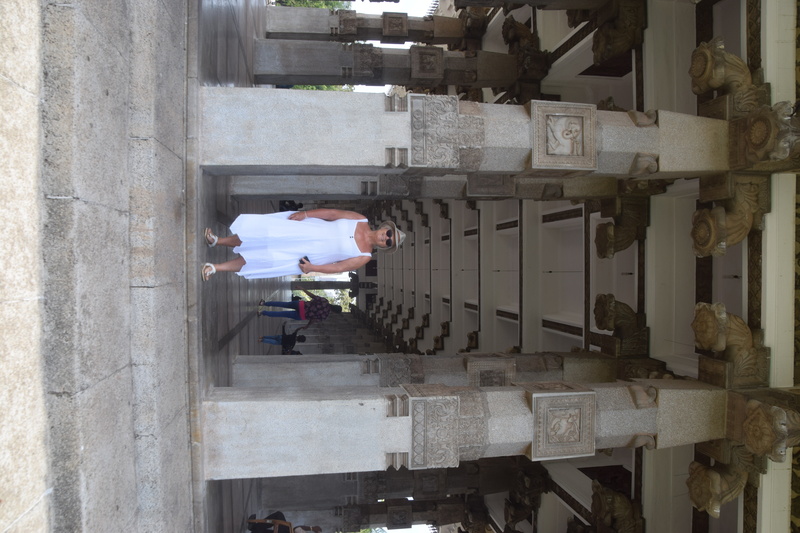 She was the one who assisted me in putting this trip together and for that I am really thankful as we were given the company’s prize chauffeur – Indika. 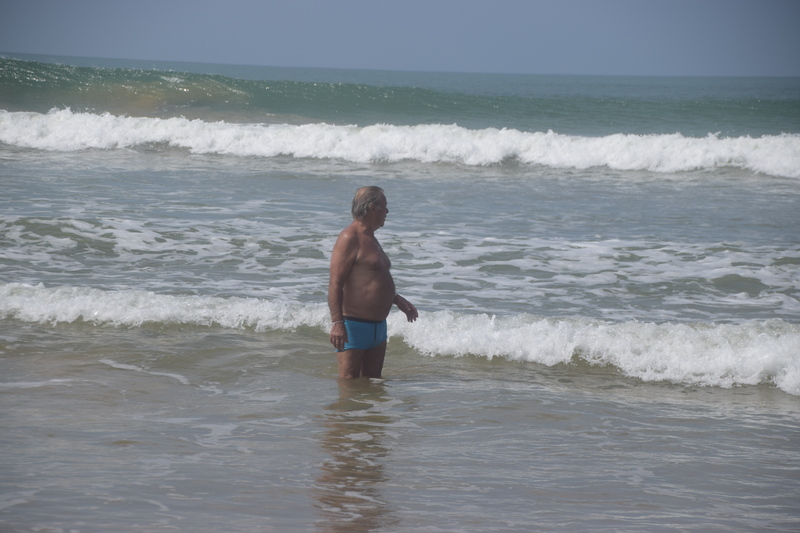 On the way, it was getting hotter and I dozed off for a while – outside temperatures had soared up to 34C………. When I was awake again, I remarked that it was about time we stopped for a drink and Indika drove into the parking lot of a coffee bar. Apparently this was where we were meeting Randima! Besides meeting Randima and her little boy, we chatted a while about our trip – she told me that she enjoyed following my posts on Facebook and she shared some of the pictures with the company. 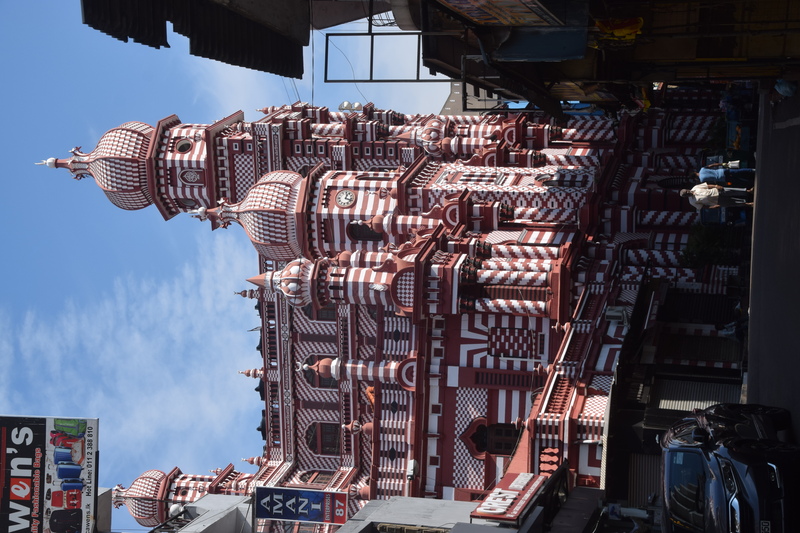 Of course I had only excellent feedback about Indika…… what was really sweet is that Randima had a gift for us – a photo collage of our trip – pictures that Indika had made on his iPhone were sent back to Randima and hence the result. Also another gift was a mask of the Blue Buddha representing prosperity and good health! 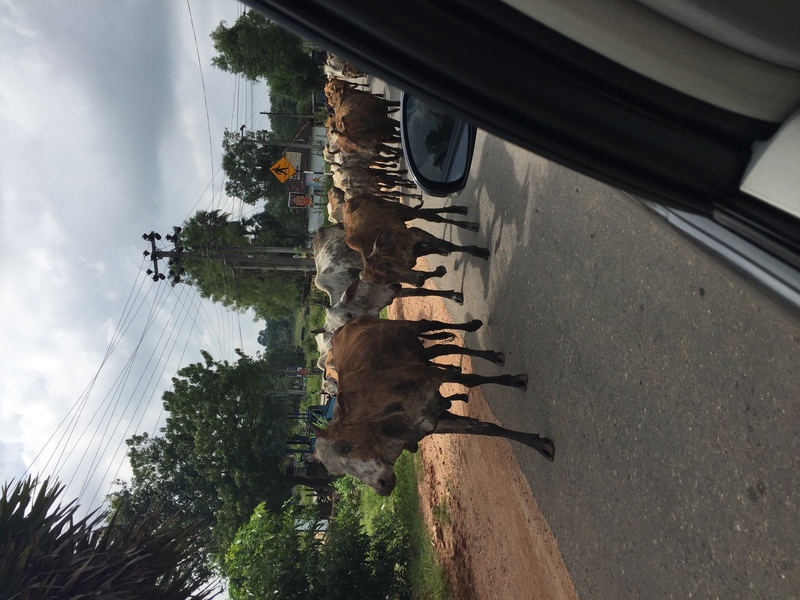 I felt somewhat embarrassed as I had brought gifts for Indika as he was driving us all round but didn’t think I would be meeting Randima…….. perhaps I should send her something when I am back in Holland?????? 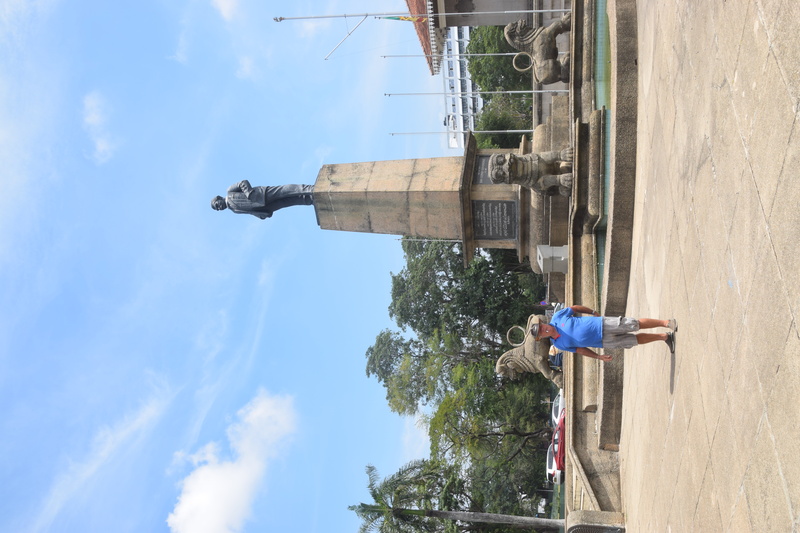 Having said our goodbyes and Randima asking us to come back and visit (well I don’t think we should wait too long as Gerry has been to Sri Lanka, Colombo some 25 years ago but did not recognize the city as there are so many high rises everywhere. 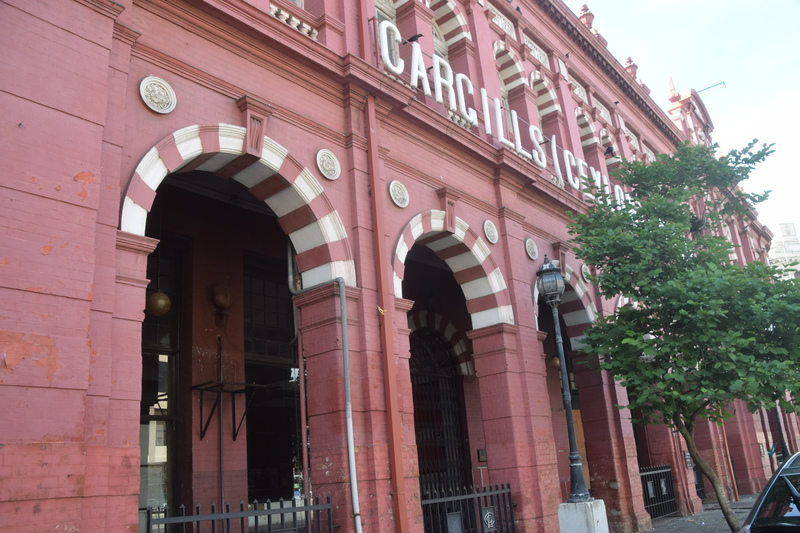 ), we made our way to the city centre. Indeed we were treated to many new high rises and wide avenues. 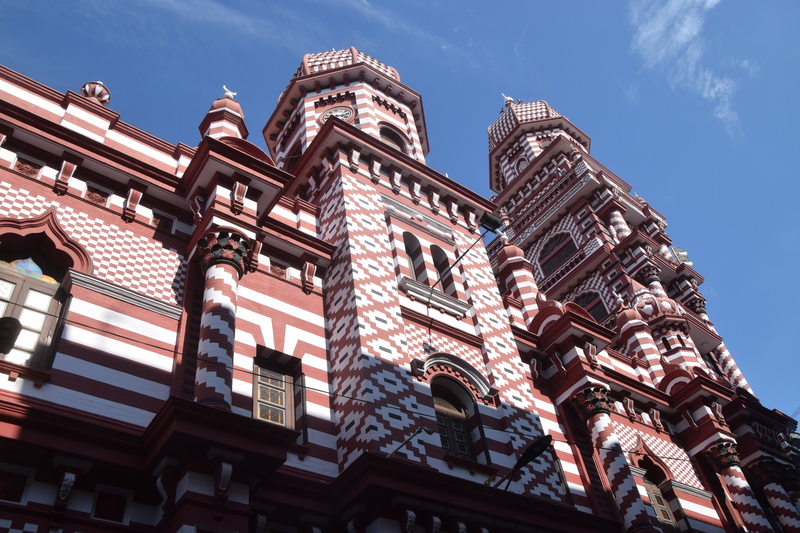 Indika took us on a whirlwind city tour starting off with the great Buddhist temple, Gangaramaya Temple – a centre of the most extravagant Vesak celebrations ( celebration of Buddha’s birthday or Buddha day to be celebrated this year on May 19) in Colombo, then onto the Independence Hall, Old colonial buildings, the Red Mosque and the Old Town Hall. 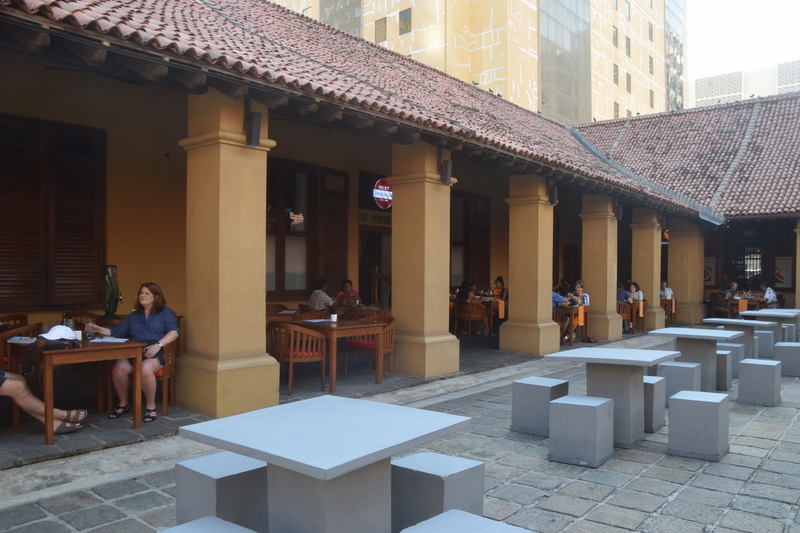 It was really too hot to wander around and were very glad to get to our hotel – Fairview Hotel with its beautiful rooftop terrace facing the ocean. 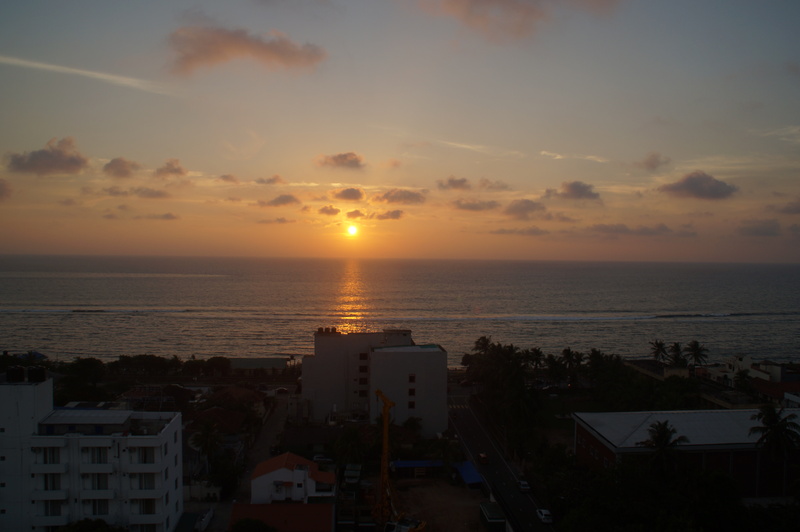 Finally we will get to see the sun set this evening……..
And finally back to the hotel – while it is not in the centre of Colombo, it really is a good hotel which is slowly transitioning us into the western way of life, however with the typical Sri Lankan hospitality with a smile. Indika dropped us here and made sure check in went smoothly. Our room was on the 7th floor and facing the ocean – great after relaxing and catching up with our social media, we went up two flights of stairs to the roof top terrace to watch the sunset – which although not perfect was fantastic to witness this great orange ball disappearing behind the clouds and down into the Indian Ocean. 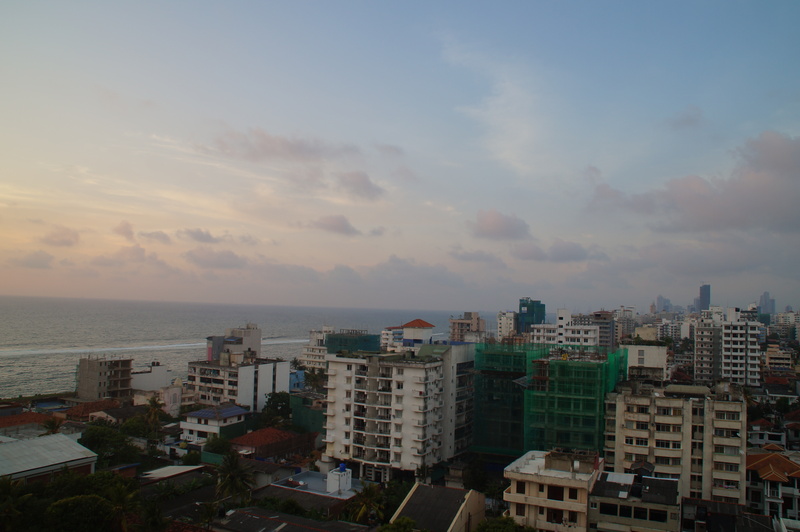 The views from the rooftop terrace were magnificent – also watching trains hooting their way along the coastline…… then it was time for us to go out and find somewhere to have a bite to eat – we ended up on the beach where the locals come and had a black pot seafood curry with roti. 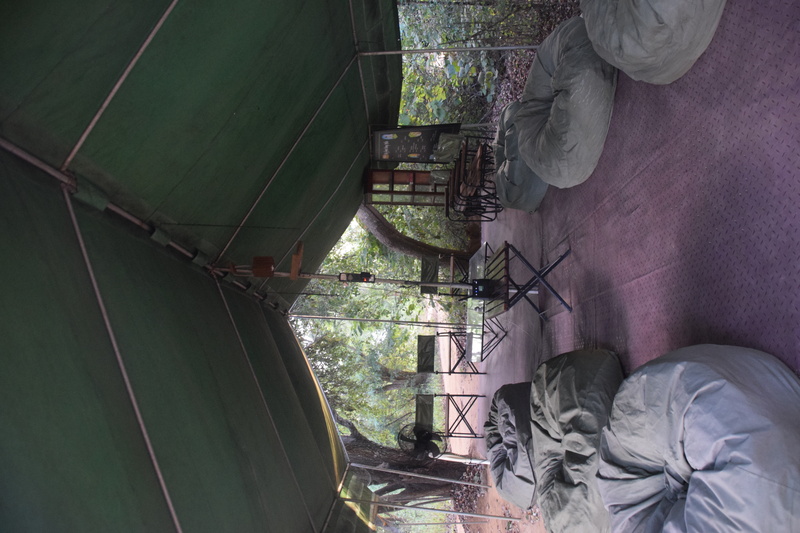 A different ambiance and am wondering how it looks in the day time…. 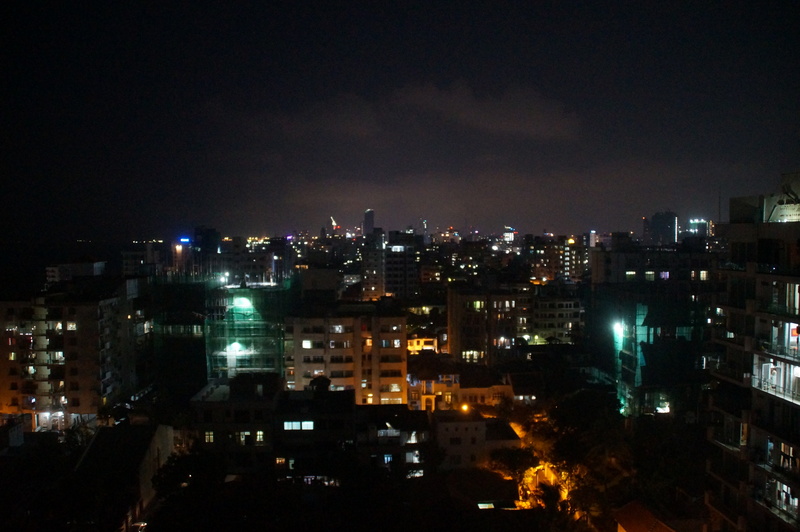 Back at the hotel, it was fantastic to get a really good night’s rest – tomorrow we will be flying back to the Netherlands in the evening so I checked us in on the Jet Airway flight via Mumbai. Today we were going to spend a leisure day on the beach and hence were in no hurry to have breakfast. We had first tea on our verandah where we had a side view of the river. Last night we did not see much so it was good to explore a bit this morning before breakfast. 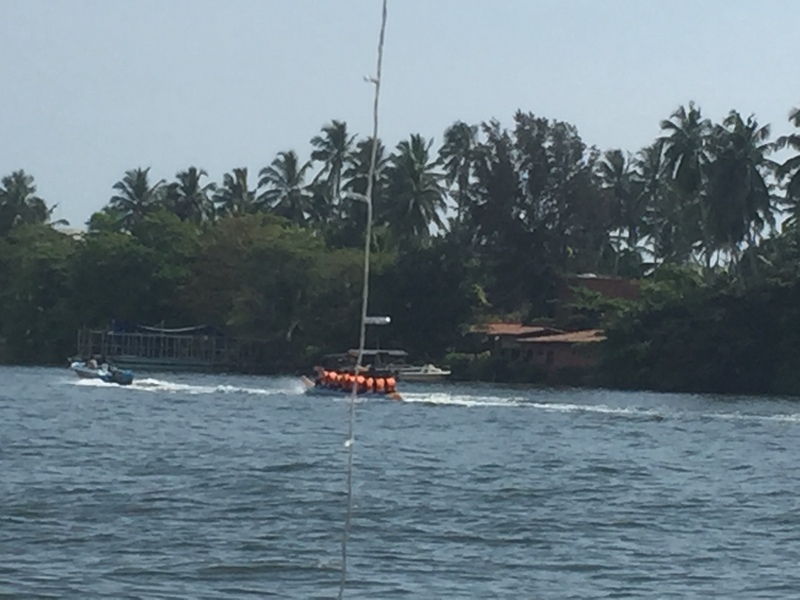 The restaurant was overlooking the jetty where all sorts of boats were moored. On the other side of the river was jungle island with a few luxurious private homes and when we informed how we could get to the beach we were told that they had boats to ferry us across to the is.and where a pathway was cut through the jungle and within two minutes we would be on the beach! This sounded great so we had breakfast and took our time while watching all the goings on at the waterside. 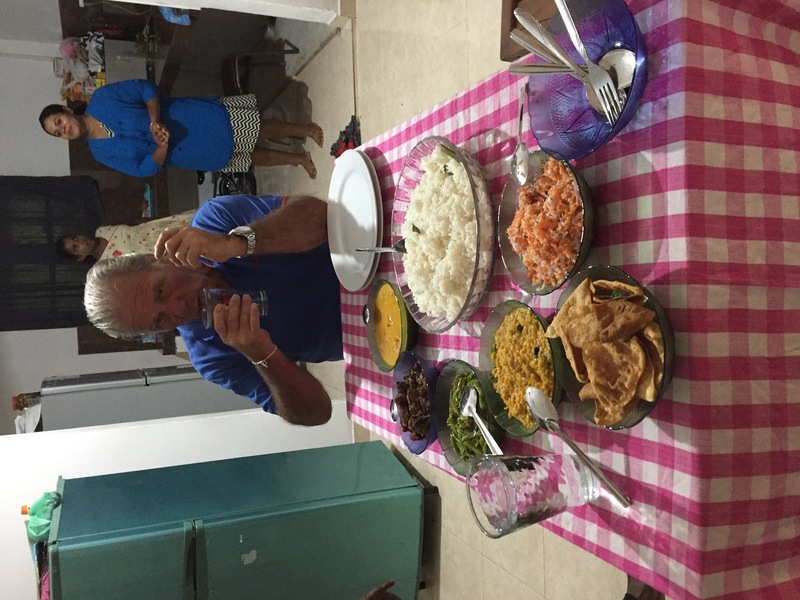 Most of the guests here are Indian, Russian and German – we are the only Dutch-Maltese couple! I had already packed my rucksack so we were ready to go after breakfast! 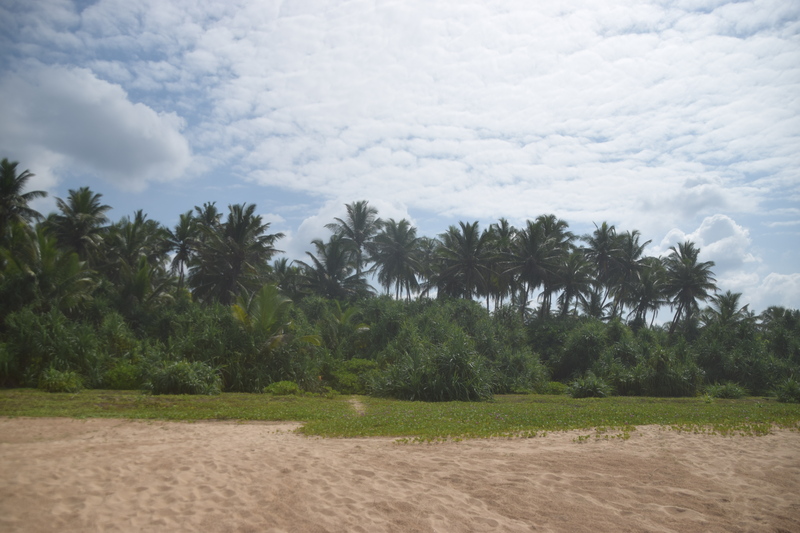 It only took us a couple of minutes to cross the river and then walk through the jungle path to get to the ocean with its empty beach. It was heavenly just listening to the ocean and basking in the sun. 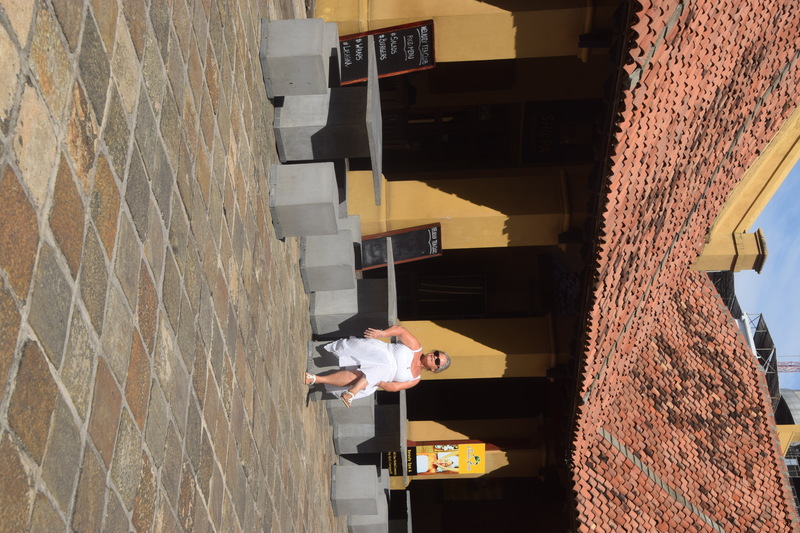 We needed this relax time after being so busy doing the sights…. 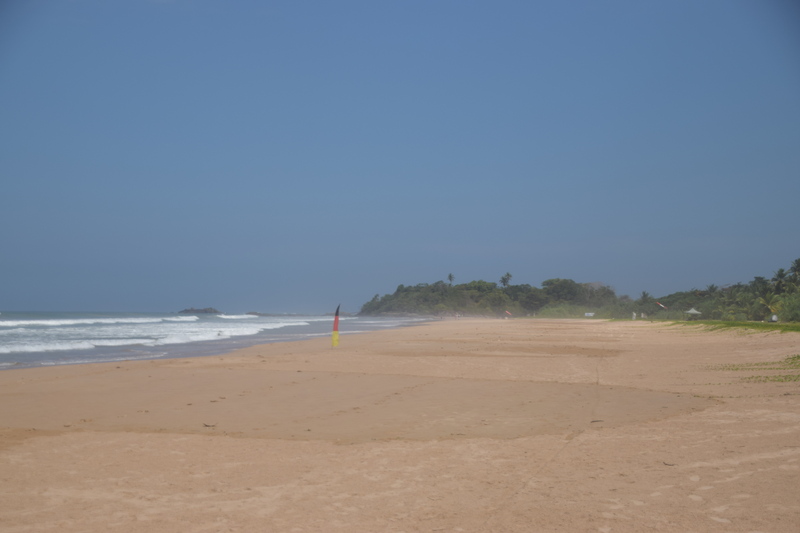 We spent a few hours on the beach x walking along the shore line, getting into the sea and have the waves break over us and just relaxing x we had the beach all to ourselves and there were only some other people walking along the shore line……. after some hours and of course at the height of strong sunshine we decided to return back to our hotel where there was a swimming pool and we could swim a few laps. 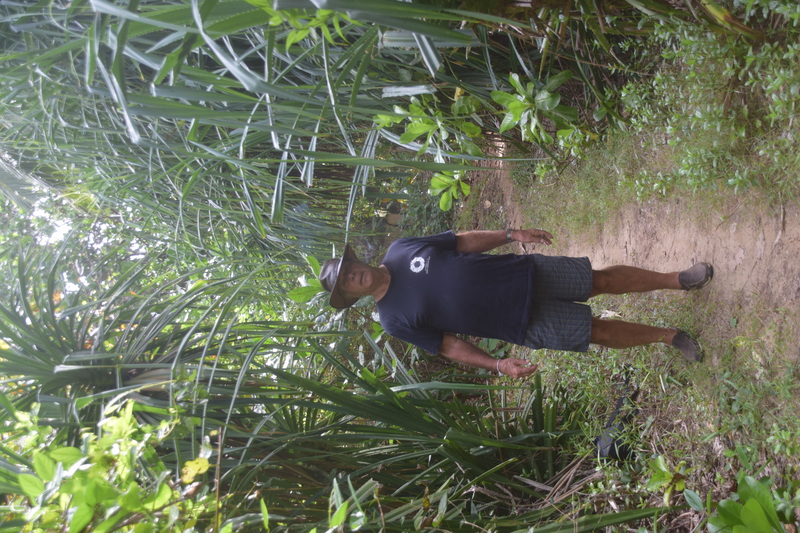 When we crossed the jungle path, Gerry just whistled to get the attention of the boat guys on the other side and immediately a boat came our way to ferry us across the river. Our view from our sun beds on the river side. Without knowing it, the day was coming to a close so we went up to Our room to shower and get ready to go walking around in town and get some dinner. We were pleasantly surprised that when we got to our room, our bed was artistically made up and we had two towel swans surrounded by little flowers sitting on our bed! Well after a superb meal, we decided to take a tuc tuc back to our hotel and as it was dry now we thought we would have a night cap before going back to our room – papaya cocktail for Gerry and pineapple cocktail for me, both made with Sri Lanka’s national drink Araq. 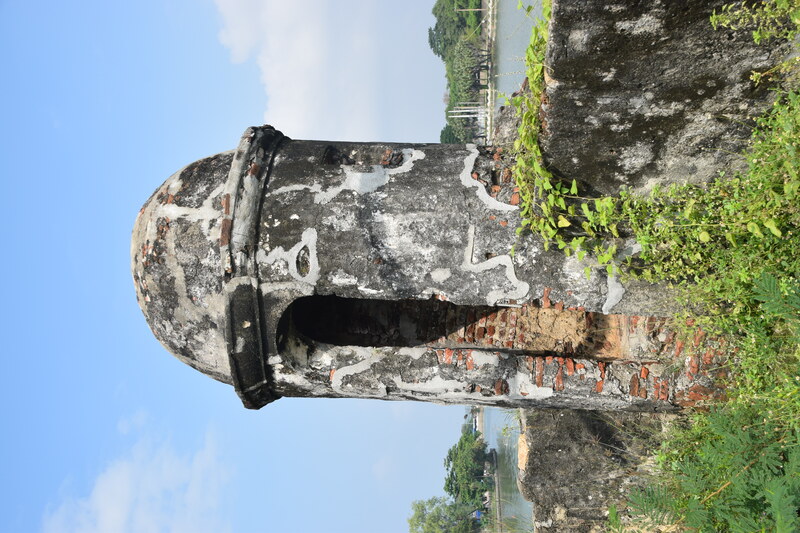 We had a peaceful night at our Secret Garden- while during daytime, the fort is ever so busy with tourists, tuc tucs, restaurants guests and shoppers, the nighttime turned out to be very still. Well our alarm went off at 7 am as Indika was supposed to pick us up at 9am. 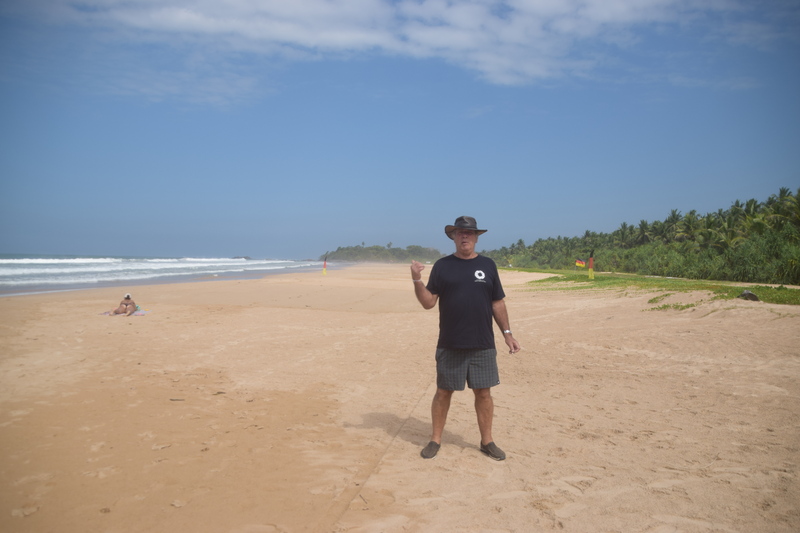 Today we had quite a few activities before we reached our resort at Bentota. 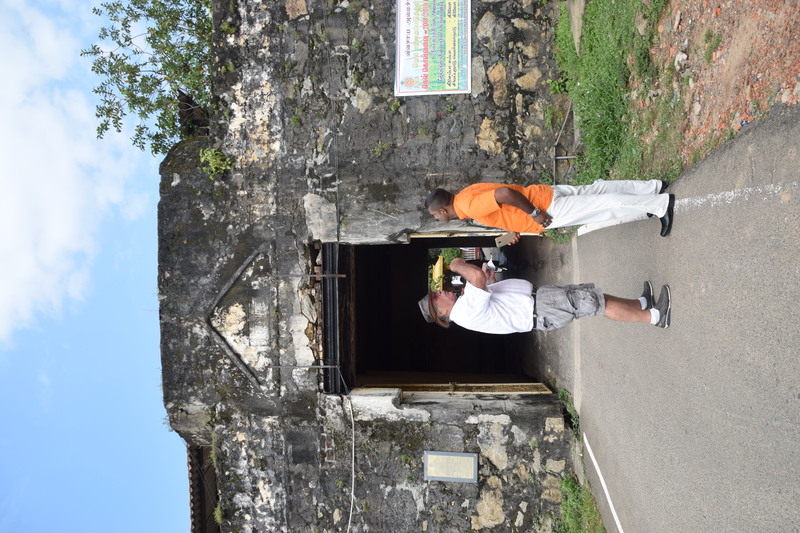 Our first stop was at a Moonstone mine and factory – we had specifically asked Indika that we were interested to see this as the moonstone gem is only mined in Sri Lanka and specifically in this area – Meetiyagoa. 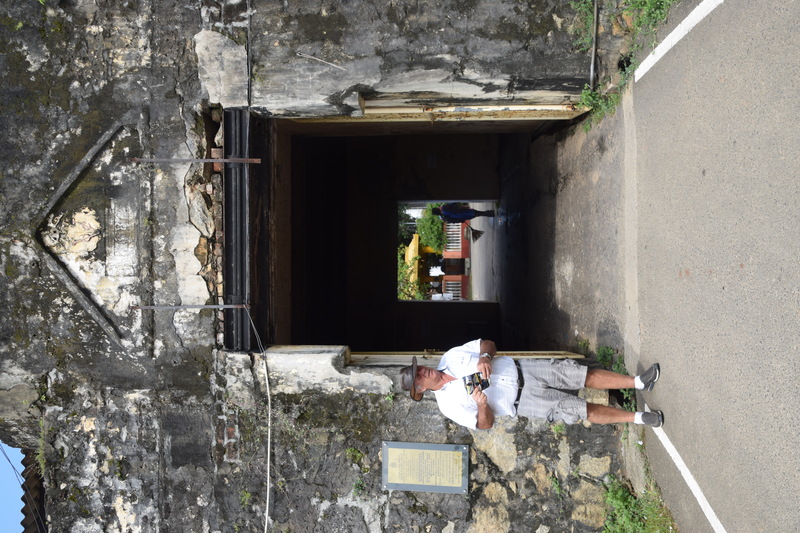 Of course we were shown how a mine works – sand being brought up in coconut baskets and then sifted in water to identify the gems and then taken along to the factory where the gems are polished and then cut into the traditional round, egg or tear drop shaped stones. I wanted to pick some Jewellery for Nicole, Tessa and Martijn; Gerry did the same for his daughters and grandchildren. 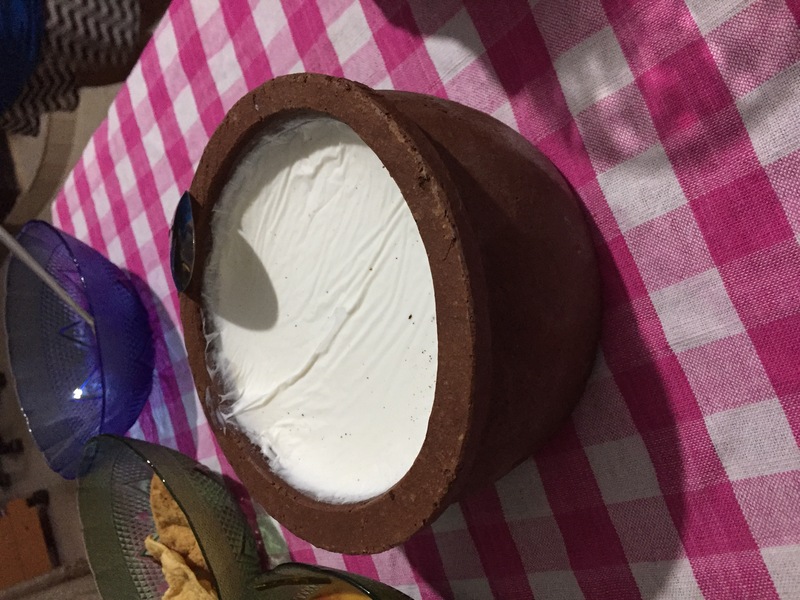 I think this would be a better gift as it’s precious and typical of Sri Lanka – and not bulky to take back home! Also it’s interesting to note the meaning of the moonstone: intuition + dreams+energy. It encourages hope, enhances feminine energies, sensitivity, intuition and psychic abilities. Known to bring strong energies of abundance to one’s life. The moonstone is associated with the crown chakra. The term moonstone was originally coined by the ancient Greeks to describe a particular gemstone that seemed to hold the ethereal light of the moon in solid form. Apparently the process in some mines has been speeded up by using electrical cutting machines but the rest of the work is still handled manually. 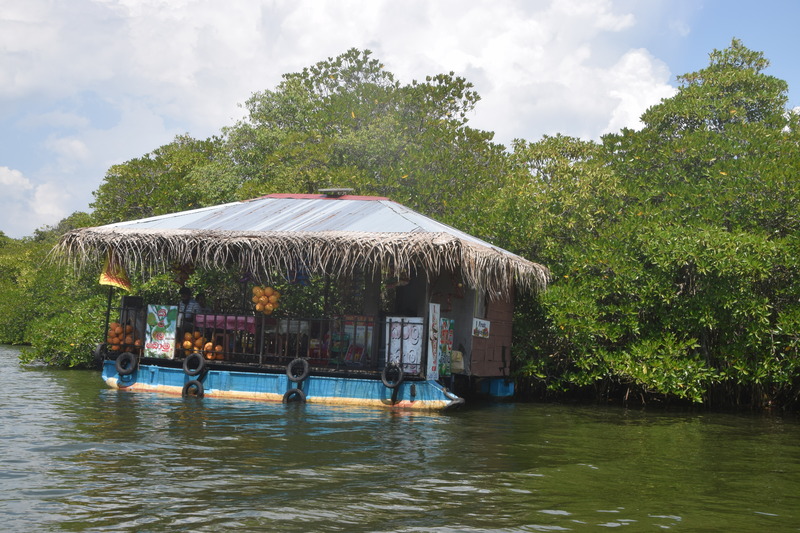 Anyway after negotiating a good price, we came away with our gifts and then drove onto our next activity: a water safari on the River Madu where thick mangroves grow and various birds, crocodiles and other animals live. 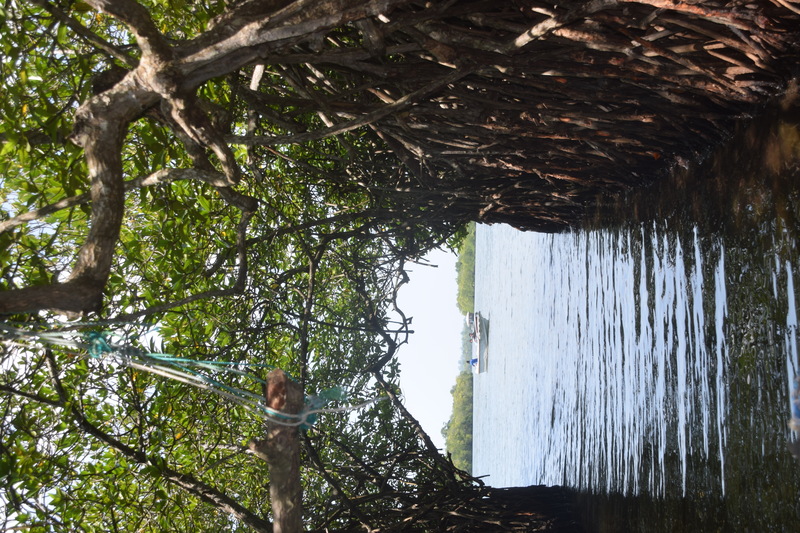 The waters of the Madu River are dotted with about 60 islands – some of which are inhabited and others have either temples but most of them are left to be inhabited by the indigenous birds and beasts….. This was a unique trip and once again we had the boat to ourselves and our young man taking us on this trip was very attentive and courteous. He was happy to take pictures for us and of us. 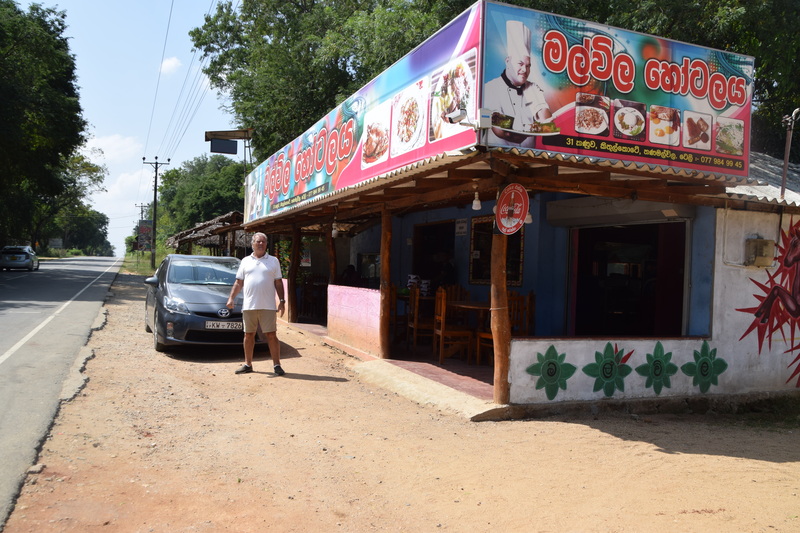 We finally made it to our hotel – Laluna Aryuveda Resort on the River and as we had not eaten all day, Indika was taking us to a special place for a late lunch early dinner, which he promised us would be the best rice and curry in Sri Lanka! Believe it or not we were in bed before 10pm………. At one point there was a lot of movement in the trees close by and I could see a family of black monkeys swinging from one branch to another – they were too quick for me to capture them on my camera! Anyway I continued my walk and climbed up a watch tower. here I could see the sun had just risen above the trees – it was all very peaceful! 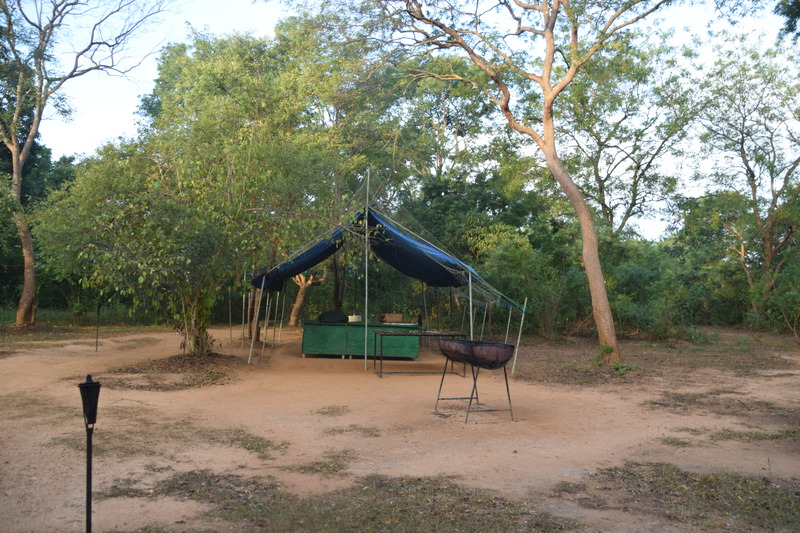 I then made my way to the central part of the campsite where we had had our dinner last night. It was beautifully set up; on the one side there was a long table and this apparently is for a whole group travelling together as we saw them last night at dinner. On the other side there we single tables for the couples who were staying over and included us. 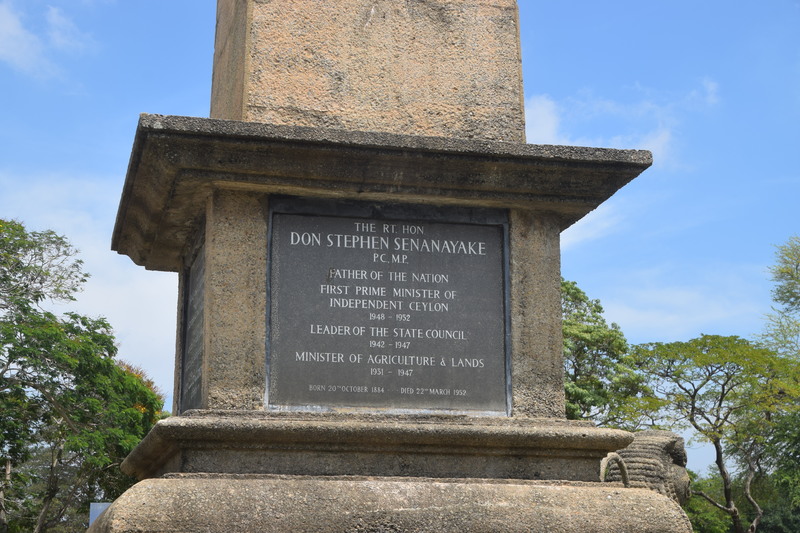 We were having an early breakfast as Indika would be collecting us at 8.30 am for our drive to Galle so I went back to our tent to wake up Gerry. “Tarzan” is awake for another day of adventure! Breakfast was a real delight and as we were early got all the attention we needed. Usha came along just after 8 am and told us that jeep would be taking us back to the entrance on time to meet up with Indika. We had only taken a backpack to the camp so we were quickly ready to be taken to the entrance. Indika was there waiting for us and as usual, he is always happy to see us and greeted us with his big smile! 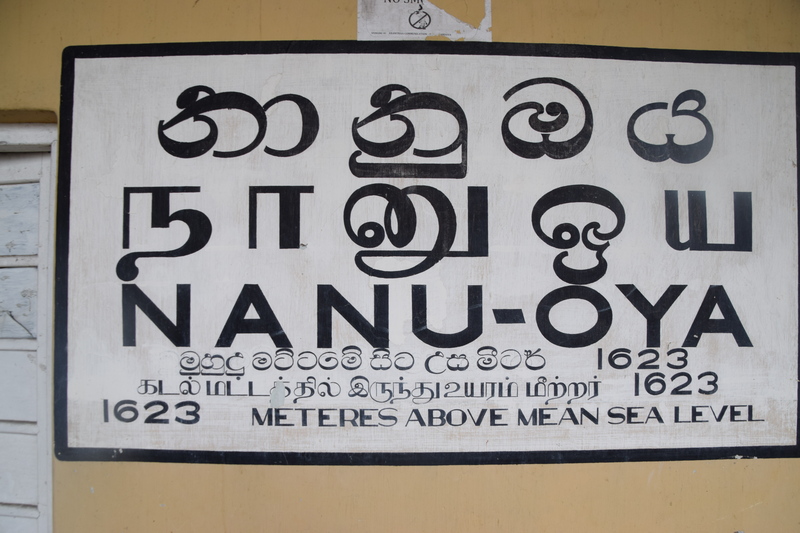 We now would be setting off to Galle but on the way , we made a detour to Ranna in Tangalle. The reason for this was that my niece, Danica, had told me that after the Tsunami, the Maltese Red Cross, led by 3 Gozitan members, had collected enough money from the Maltese people to help reconstruct a fishing village which totally wiped out by the Tsunami in 2004. The Maltese people had given enough money to build 65 houses as well as a Red Cross clinic. What’s most interesting is that each house has a name of a Maltese village or town. 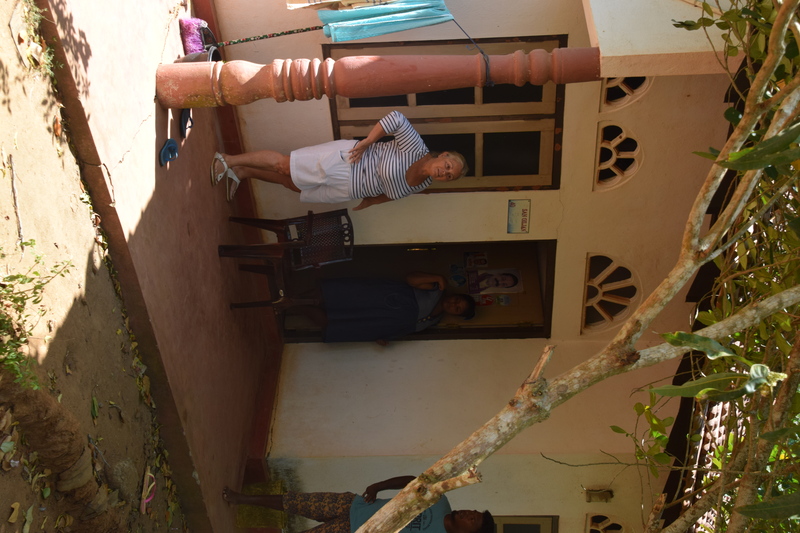 We finally found this village which was built some 3 km away from the sea shore ( the Sri Lankan government prohibits and houses being built on the coastline) and just imagine how emotional I got when I saw the house called Sliema – I looked in through the gate and called out hello and a young woman came out. Indika acted as a translator and I told her I was born in the town which was the name on her house. She to,d me her daughter was born in this house and she asked me to come indoors so that I could see her daughter who was still napping! 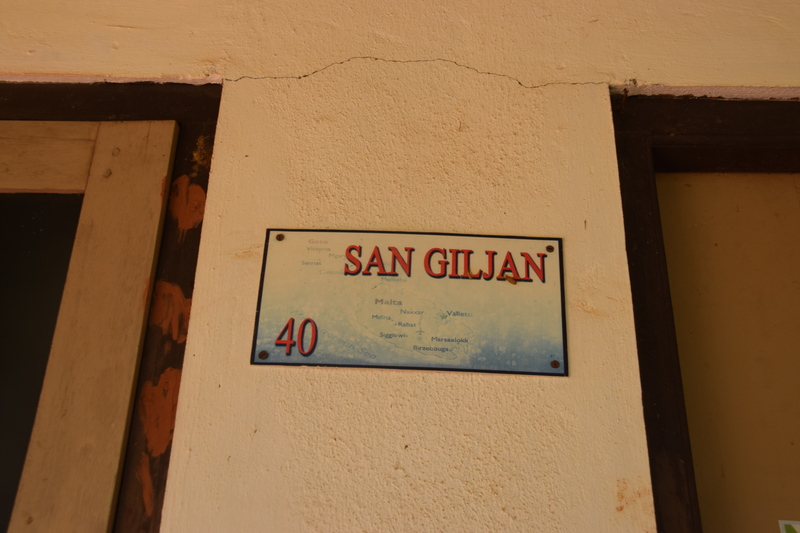 We took some pictures together and then visited other houses including one named San Giljan where I had gone to school. 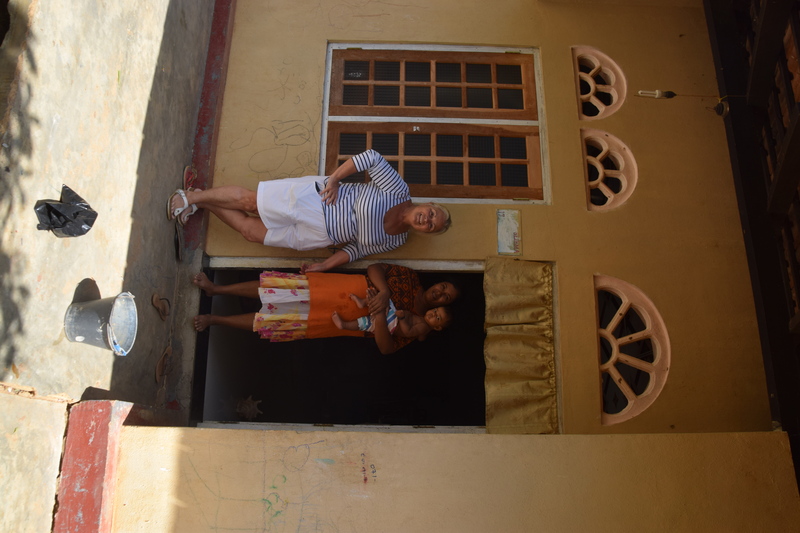 Indika asked me when we left if I were happy that we had found this village and of course I answered yes – it had made me very happy to see this village built with Maltese funds! And I am sure my Maltese friends and family will appreciate that we took the time to visit this Little Malta Village In Ranna, Tengale. 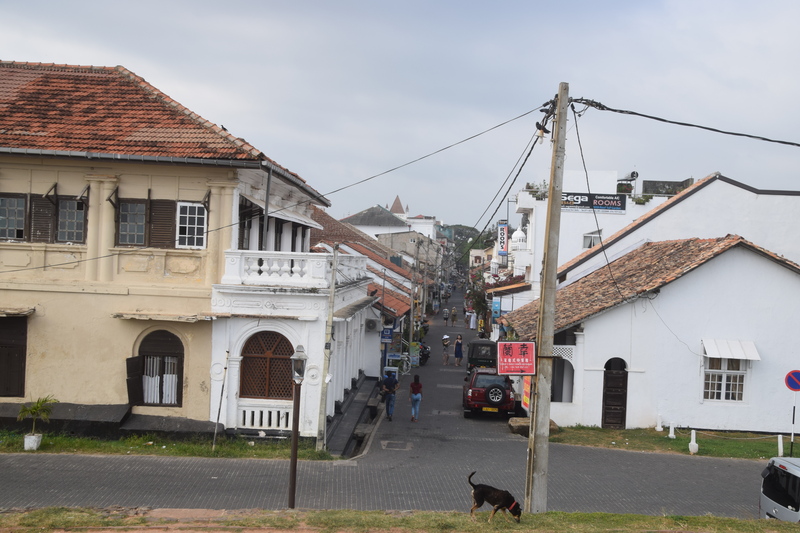 Our hotel in Galle was inside the old fort and Indika had quite some problems driving to this tiny hotel and dropping us with our baggage. Well finally we arrived and checked in to the hotel. 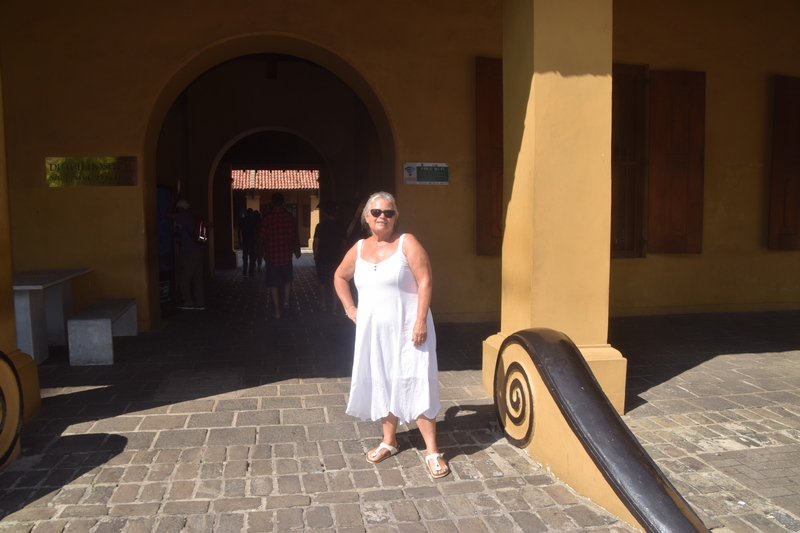 We were spending only one night in Galle so as soon as we had freshened up@ bit we were outdoors again to explore this old Dutch fort – Fort Utrecht! 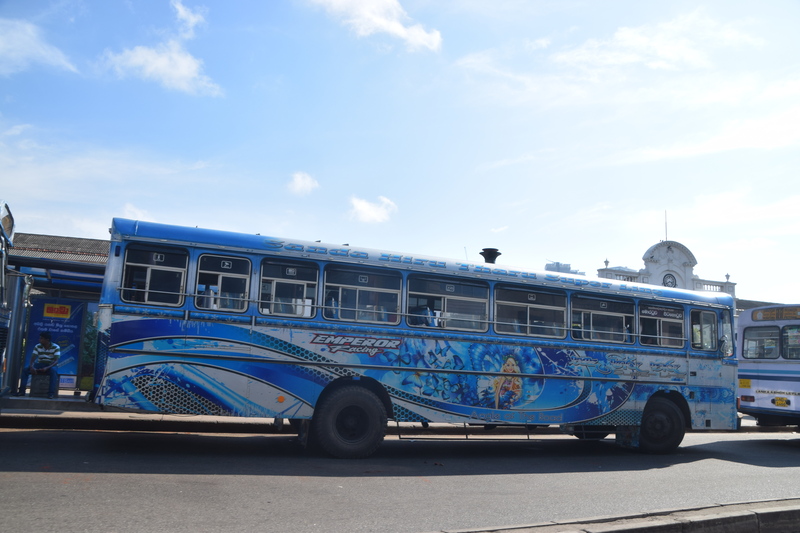 Indika parked his car and took the bus back to his family; a 2hour journey and we would see him tomorrow morning when he would come to pick us up at 9am to continue our trip to Bentota. 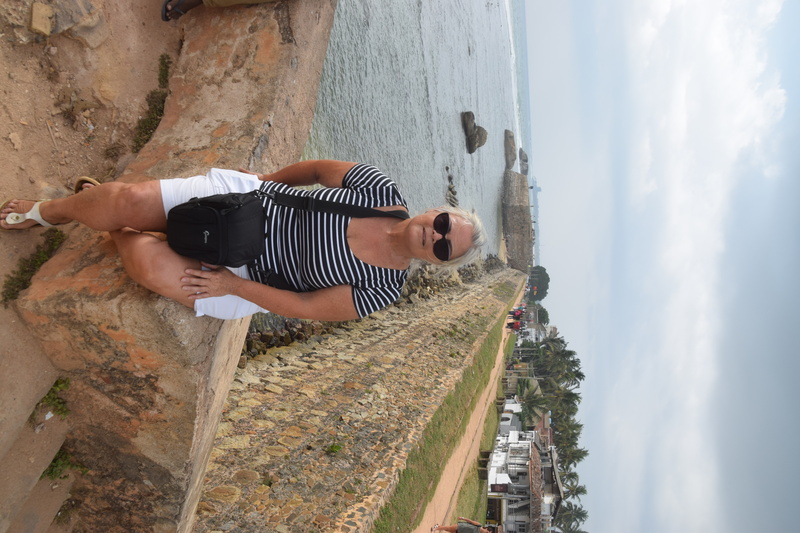 Well we enjoyed our walk around Galle Fort. 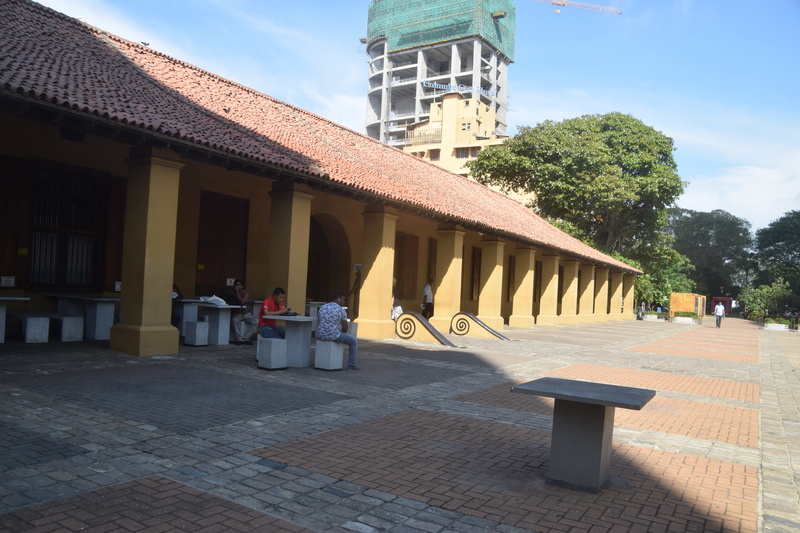 I think they should make this fort only for pedestrians as the streets are too narrow for cars and tuc tucs. Anyway we climbed up on the bastions and walked around a good part of the bastions. The view from here over the sea was magnificent. 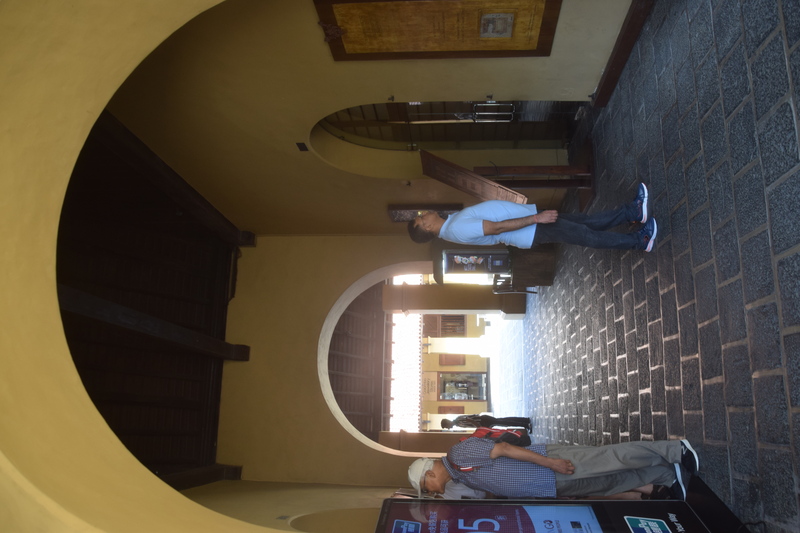 Once we started walking within the fort, we stopped for an ice cream which was just delicious.and for once I also treated myself to an ice cream – pistachio and almond while of course Gerry stick to his vanilla ice cream……. After a couple of hours we were back at our hotel – the Secret Garden Fort + containing only some 12 rooms….. however we could sit outside on the side walk and as it was near cocktail time we treated ourselves to some cocktails – for me it was originally pina colada and Gerry a gin and tonics. However I was told there was no more pineapple so I changed my order to a Mojito. Well my Mojito came but Gerry’s G&T didn’t – so after some time I asked where his cocktail was and I was told that they had to,go and get the Gin – my quick remark was,then they should also,have gotten the pine apple as well…….oh well I had only a few sips before Gerry’s G&T arrived. While we enjoying our drinks, we got talking to a Swedish couple who were on a 5 week trip,to Sri Lanka….. so we were all comparing notes which was good fun…..
After our drinks we went up for a shower and got ourselves ready to go out for dinner; we did not go far as we found a restaurant advertising good seafood so we stopped there and treated ourselves to a St.Valentines dinner. 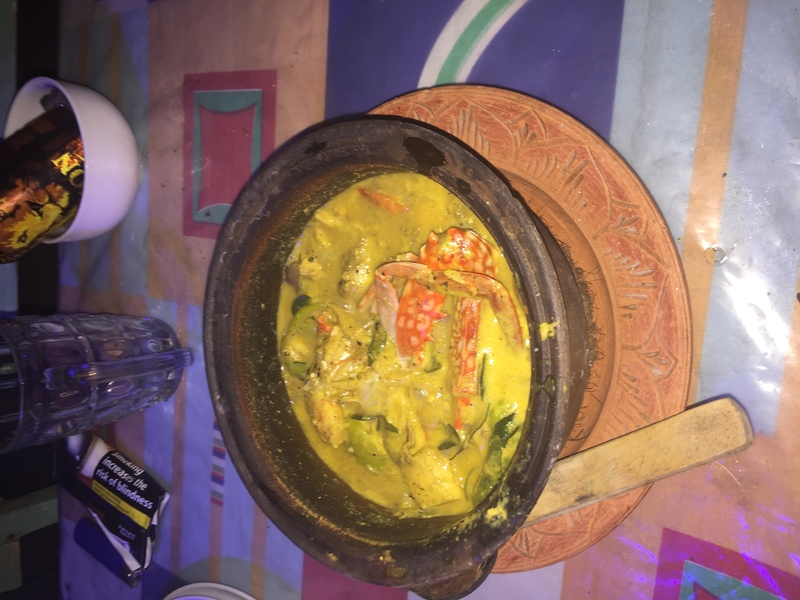 Lobster for me and fresh mullet for Gerry …… it was a great evening and by the time we got back to our Secret Garden,it was time for bed. 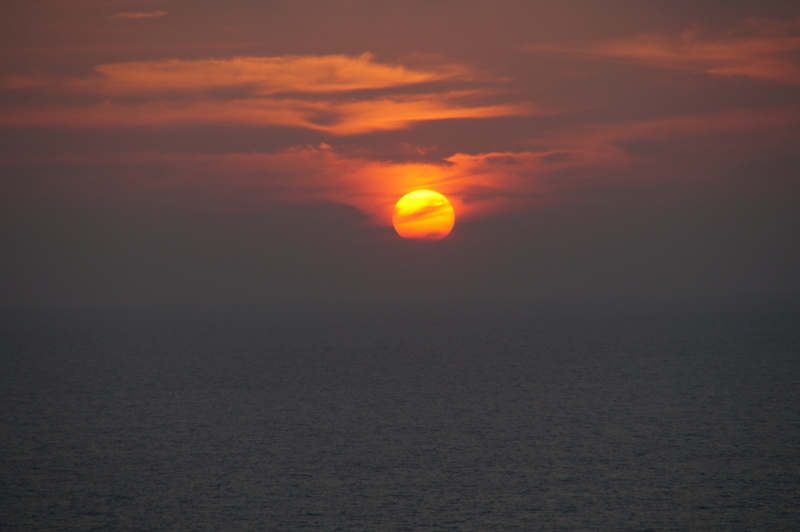 We had to be ready by 9 am tomorrow morning……..
As I had been promised by the Misty Hills Manager, I would be witnessing a superb sunrise from our terrace, I had set my alarm for 6 am! 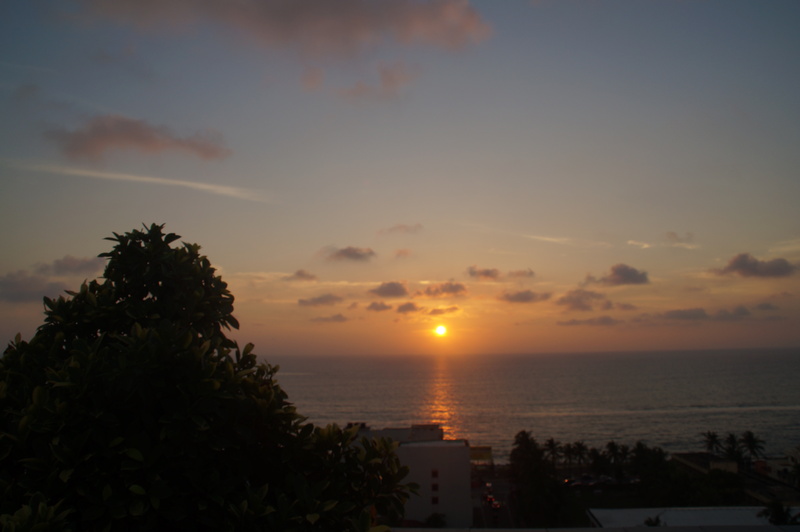 I quietly got out of bed so as not to wake up Gerry and went out on the terrace wit watch a serene dawn breaking open. The valley and hills were covered in mist, hence our hotel appropriately named Misty Hills, however sunrise was more to the left hand side and behind the mountain range. 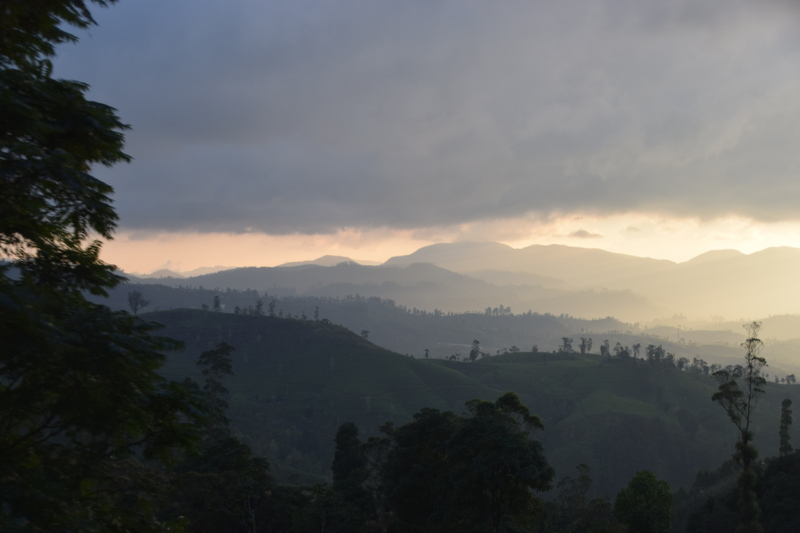 It still was awesome – and there were no cars and trucks yet winding up the steep hill so all I could hear was the birds chirping away, welcoming a new day! After showering and getting our gear together so that we would not need to climb the 90 steps this morning, we went down for breakfast. Indika was already up and about and we would be driving away at 8.30 am so that we should be well on time to get our train tickets from Ella. We were following Indika’s plan he presented to us last night. 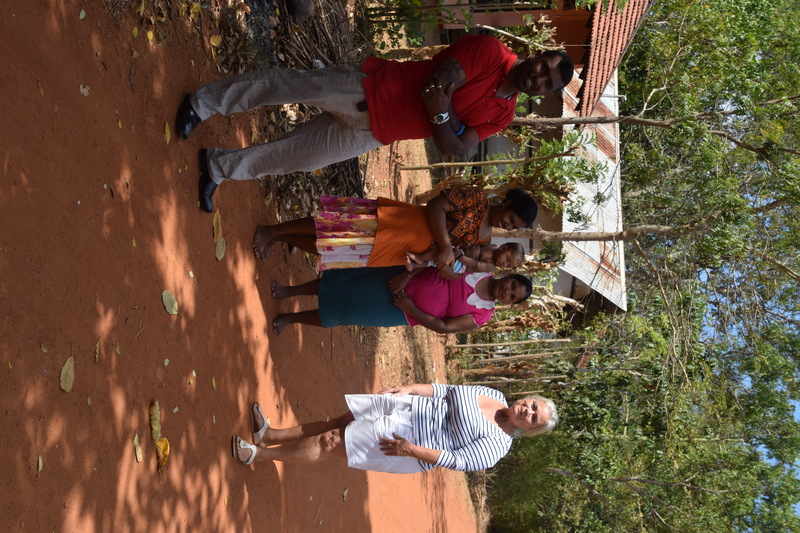 As we are spending two days in Ella we had enough time to retrace our train journey for part of the way so we would be going back to ……….. where he had arranged with a colleague driver we would return by car to Ella. When we arrived at the station, there were loads of people waiting to buy a ticket but the counter wasn’t yet opened. 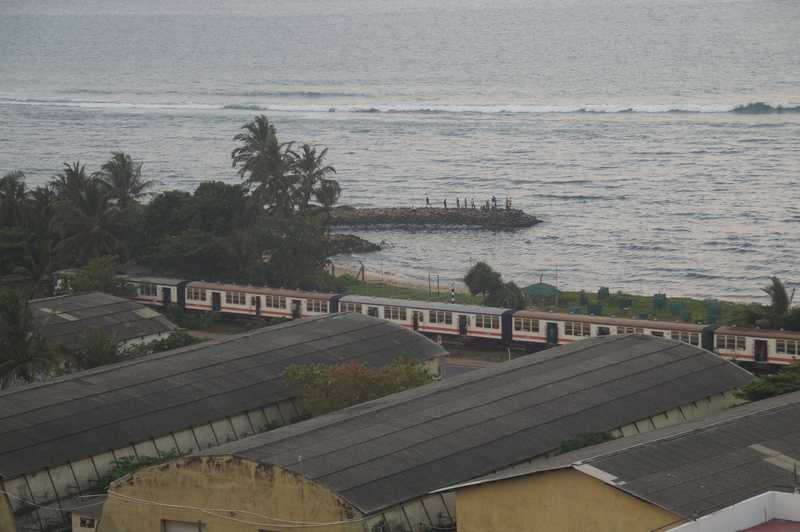 Indika suspected that there would be a rush to get onto the train as this is public transport and used by the tourists for the scenic route. 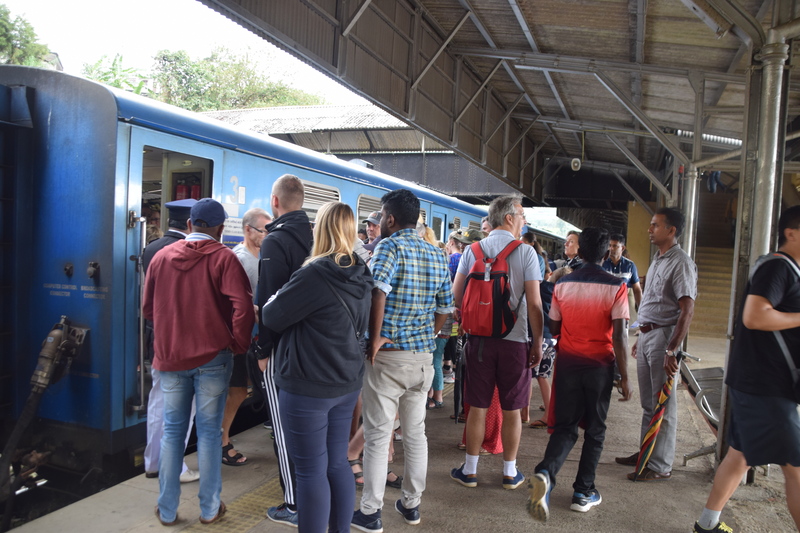 His quick thinking got us out of the queue and he took us to a Tuc-tuc – the whole conversation was of course in Sinhalese but the jest of it was, the tuc tuc driver was to take us to Demodara, one station before Ella so we would get on to the train before the big crowd in Ella. Even though we could not get first class tickets, we did get onto the train and had seats in the second class and that’s thanks to Indika who jumped into the train first and located free seats for us. 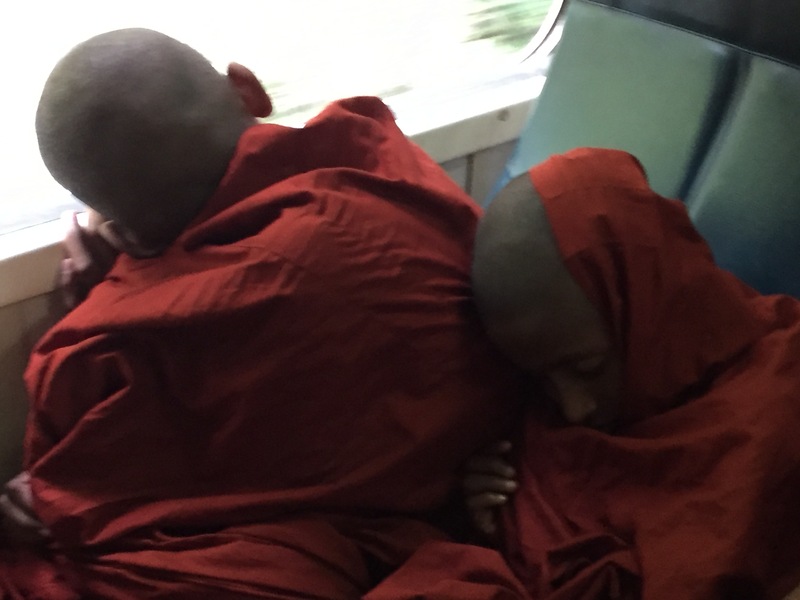 Actually we shared a compartment with Buddhist monks and young boys aspiring to be monks. 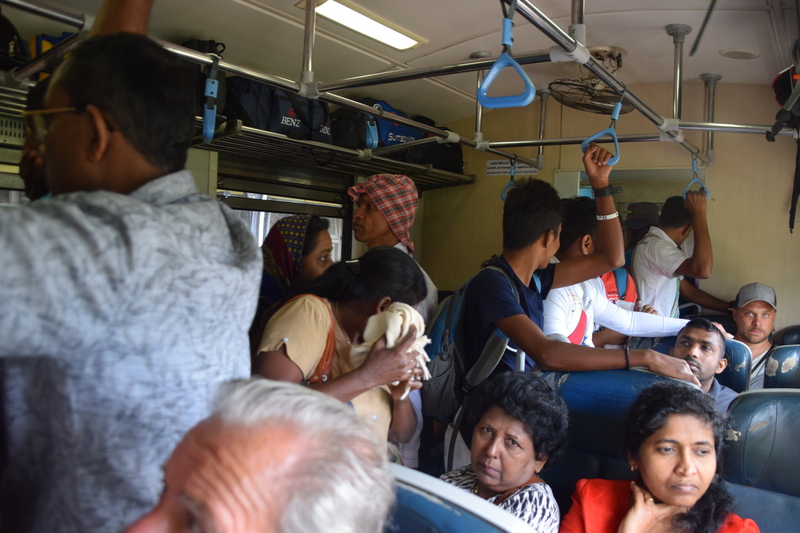 This whole group was travelling to Colombo and they were singing all the way. By the time we reached Ohiya we had seen quite some beautiful scenes and chatted with various locals including the Buddhist monks. 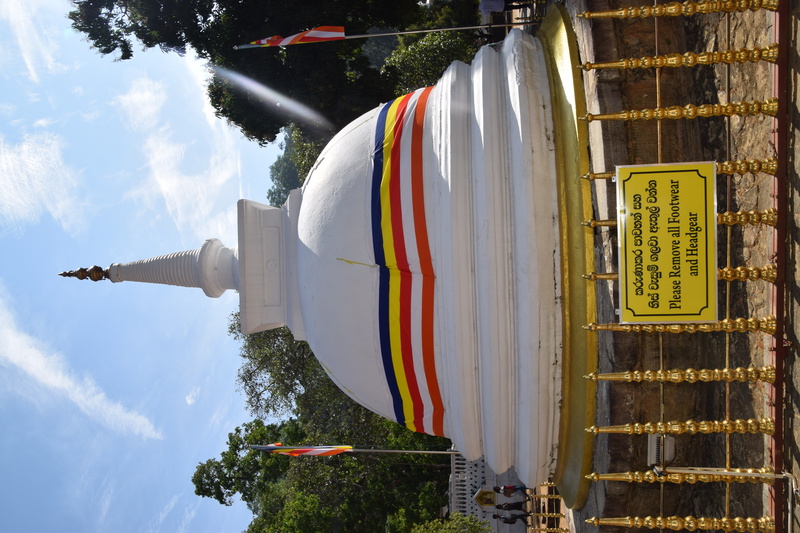 Apparently, the boys were either without parents or they were so poor that they are given up to the monks who would then educate them and would later also become monks! 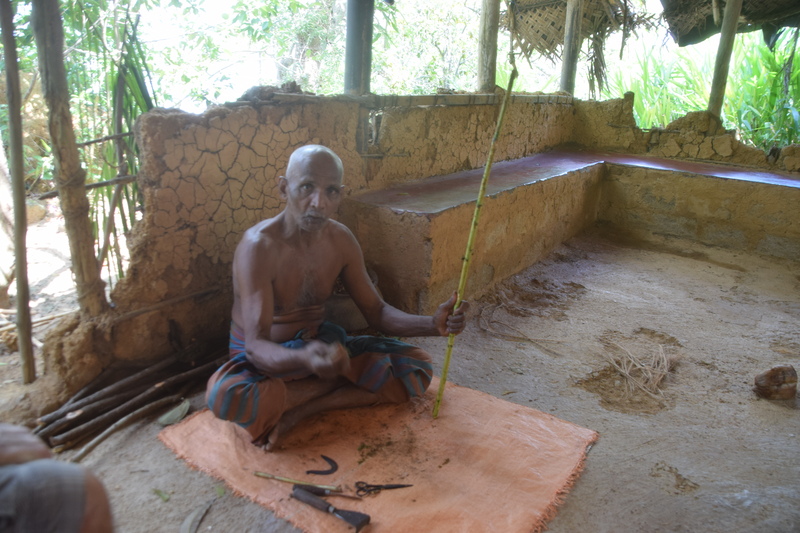 Indika, our driver, enjoying a nap while being driven back to Ella by a colleague friend of his! 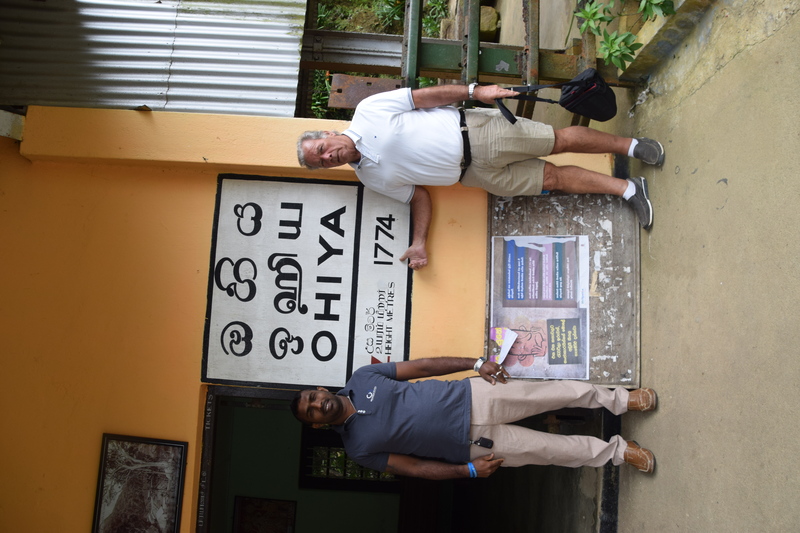 At Ohiya, we were met by Indika’s colleague who had deposited his Chinese clients on the train to Ella. He would then drive to Ella and meet them there and continue the trip, hence an empty car which we could use to take us back to Ella. 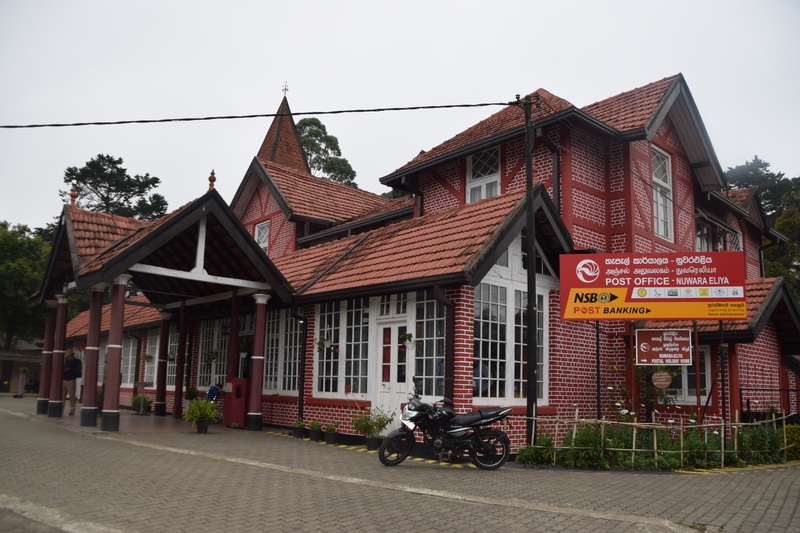 However we first stopped at the “station restaurant “ across the tracks and some coffee and biscuits. Back at Ella, we were on time for lunch and this time we drove to the Mountain Heaven, a hotel with a good restaurant facing the high mountains. We had a table facing the mountain and with a cool breeze blowing. Most of the guests were Chinese or Indian with a small number of Europeans. 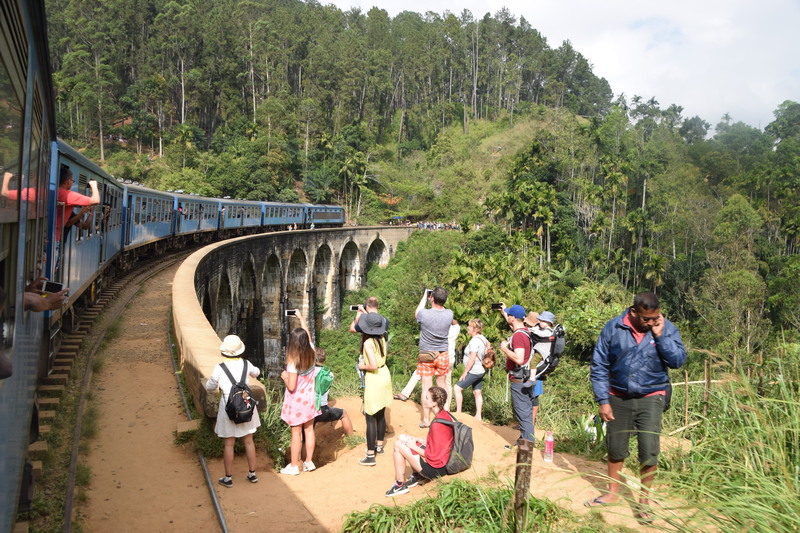 After lunch we left for the 9 Arch bridge; this time we would be able to see how trains go across the bridge – this is a local attraction and there were loads of sightseers waiting for the train – we had seen that this morning when we were travelling over the bridge. 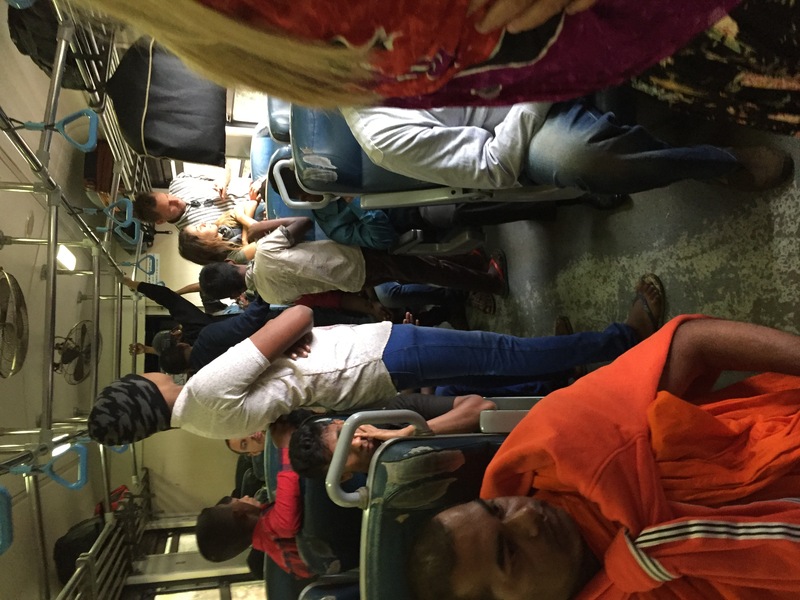 Now we were going to be part of the crowd waiting for the train……. Indika explained that he could not drive his car all the way as the road was bad but we could get a tuc tuc to take us close to the bridge. So off we went in the tuc tuc and at one point we had to go up a very steep and winding hill and we understood that one of us had to get out. Apparently we are too heavy for the tuc tuc??? 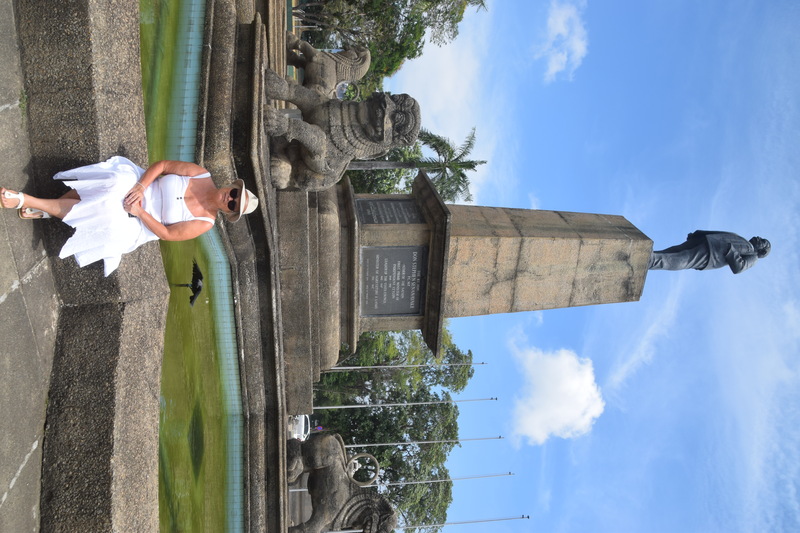 I remained in the tuc tuc and we climbed the hill – of course the driver dropped me at the top of the hill and told me to wait as he turned round and went down the hill to pick Gerry up! We then continued our drive and ended up close to the bridge. Too heavy for the tuc tuc to climb up the hill with both of us – first me then, Gerry! 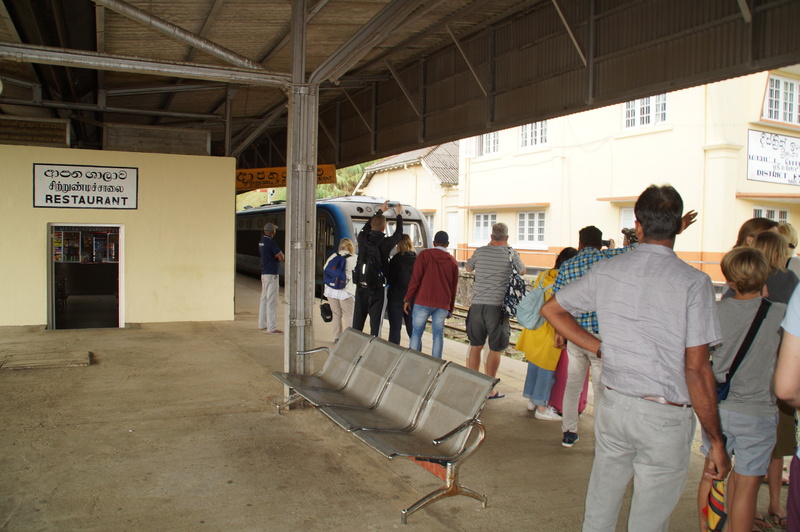 When we arrived at the bridge, there were many people waiting for the train – but we didn’t have to wait too long! 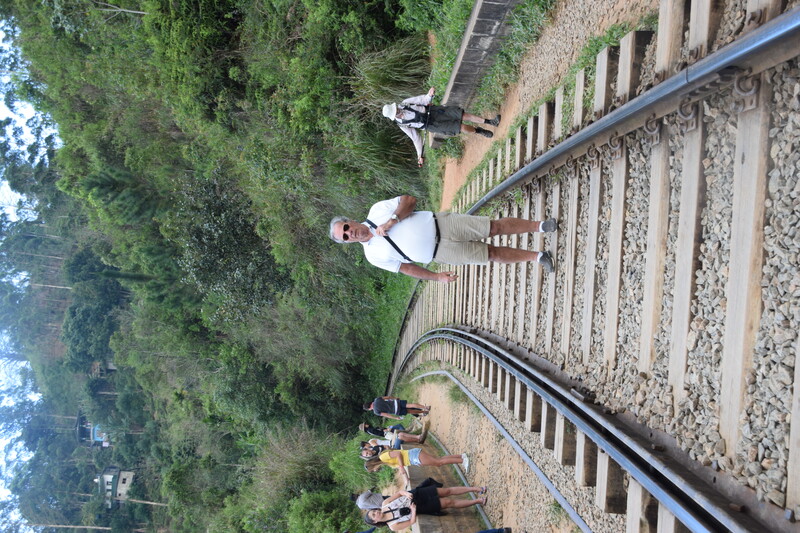 The train came down the track and we could make some splendid pictures……..
What a fantastic sight – waiting for the train to go over the 9 Arch bridge…..
Back with the tuc tuc to meet up with Indika and our next stop was to go and hike up little Adam’s Peak. 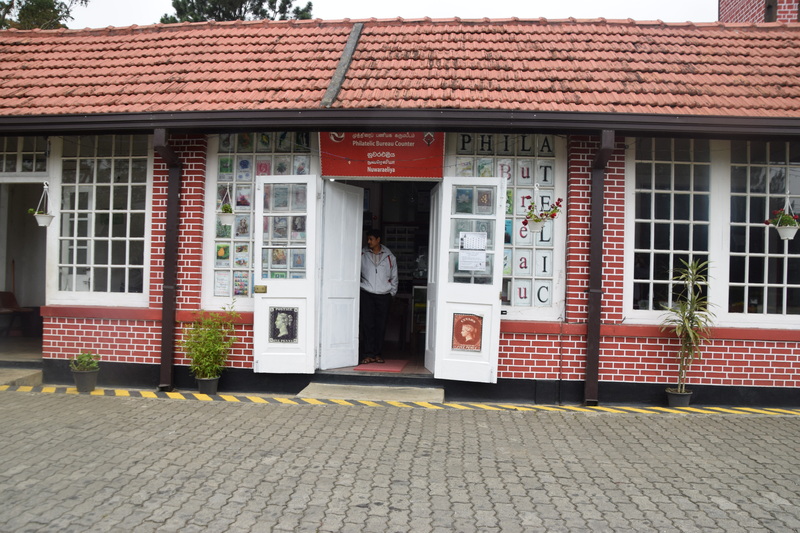 However by the time we got there we were badly in need of using the bathroom and wanted something to drink so we stopped at Cafe 98 which is part of a resort situated opposite Little Adams Peak. 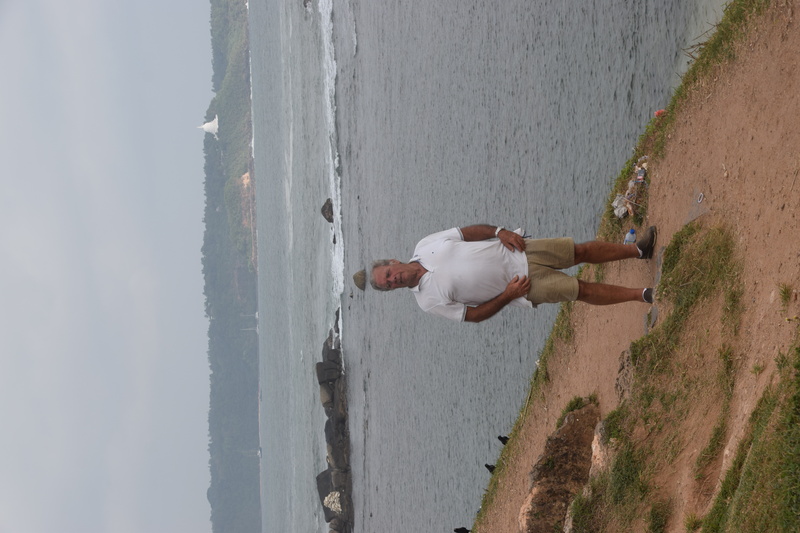 While we sat there enjoying the view and my ginger beer, I was contemplating whether I really wanted to do the climb……. 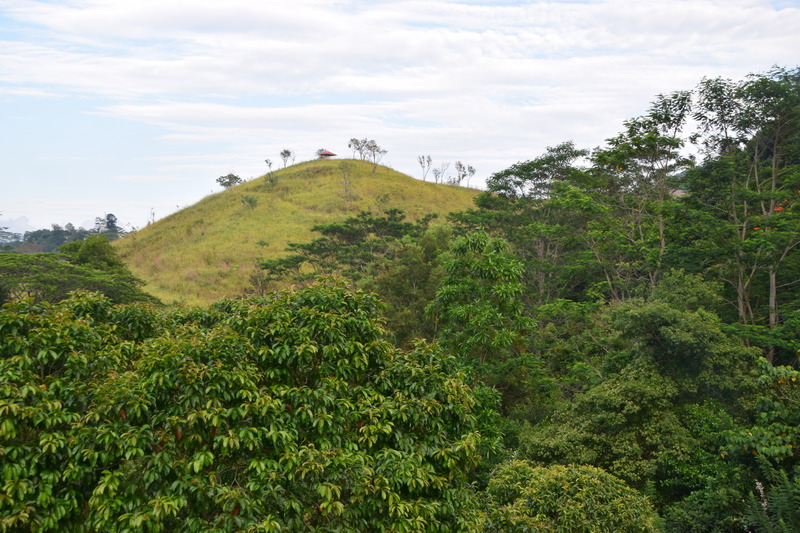 We started walking, however the peak itself can only be reached with steps and when I saw that , I wasn’t prepared to hike up those steps…… I think Indika was disappointed in me…. but I just listened to my body – if it were an uphill climb and no stairs, I would have done it! 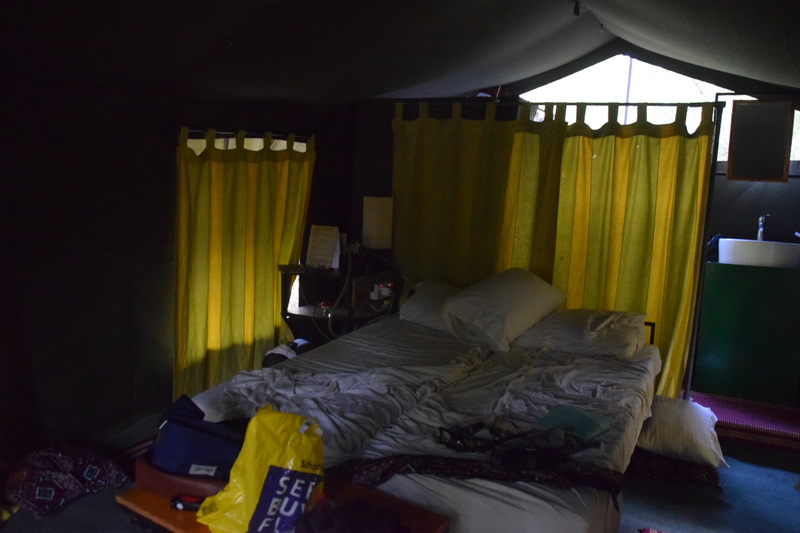 By the time we got back to our Misty Hills, we were both dead tired and decided to have a snack In our room – no way we would be freshening up and go downstairs to the restaurant…….anyway I needed to catch up with my blog before we went to bed….. Tomorrow we will be leaving Ella and driving down to Yala – another highlight of this trip – to visit the national park and sleep over on a campsite ……..
Today we will be having a travelling day and this time it’s going to be by train to Ella – a beautiful small backpacker hub on the southern edge of Sri Lanka’s Hill Country; a must-do place in any Sri Lankan itenarary! 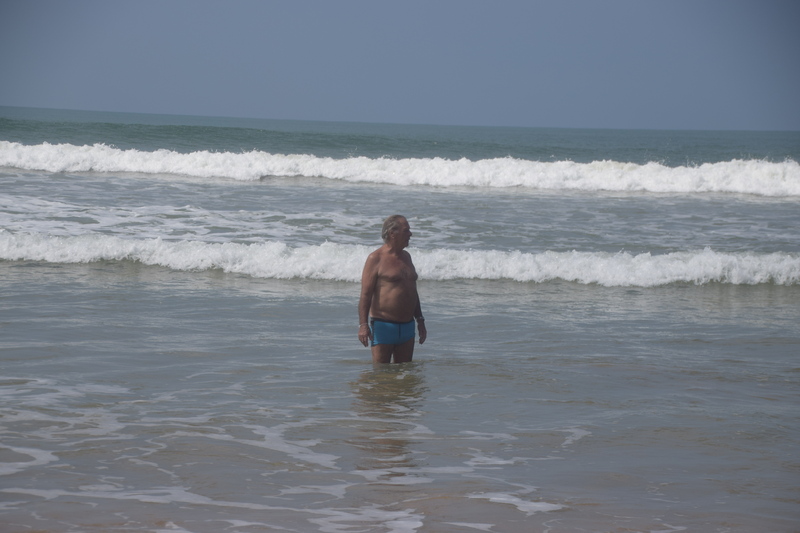 We had a leisure morning at our bungalow and I could update my blog and finish off stuff. Our breakfast was prepared by Ganesh, our house boy who has taken a liking to Gerry. Mind you all the staff we’ve met have been very hospitable. Indika arranged for us to have our check out time extended so that we could drive straight to the station in Ohiya after lunch at the lakeside. It was a strange way how Indika acquired our train tickets – apparently first class tickets can only be bought at the train station 5 days prior to travel date and even then, they are always sold out, however there is a black market circuit and Indika acquired first class tickets for Rp 5.000 Nearly 3 times the original price! 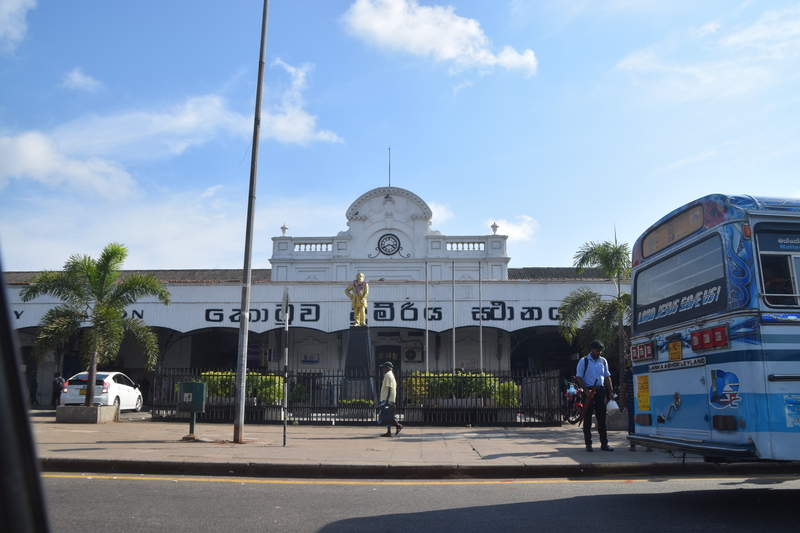 At first I understood that the train was departing at 15.30 but when we had the tickets it was stated 15.55 – as it’s a 3 hour journey, I was worried that we would be arriving in the dark and would miss part of the scenic views we were supposed to see. This morning Gerry was going to have a pedicure – at least Indika was to schedule an appointment at a salon. So off they went, however they returned in no time. 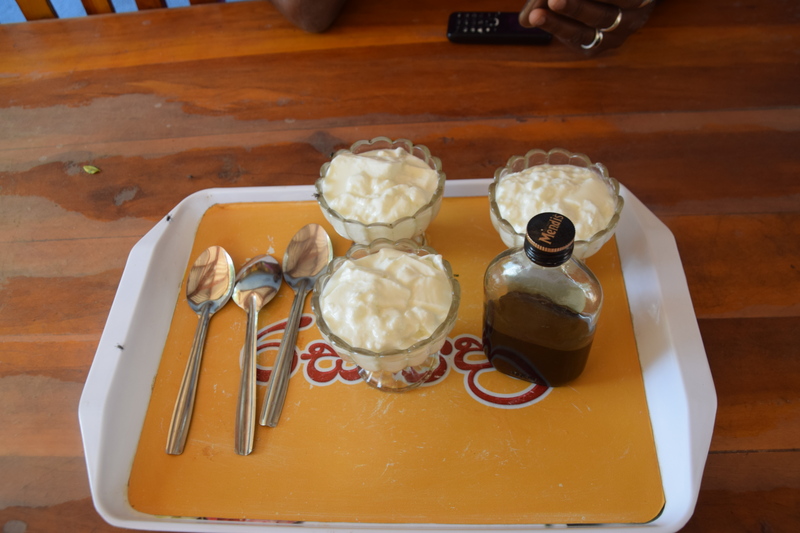 Apparently at the salon, they were told that they only did pedicures for women – so they bought a nail cutter and some cream and when they got back Indika performed the toenail cutting………Incredible what your private chauffeur is prepared to do for you!!! 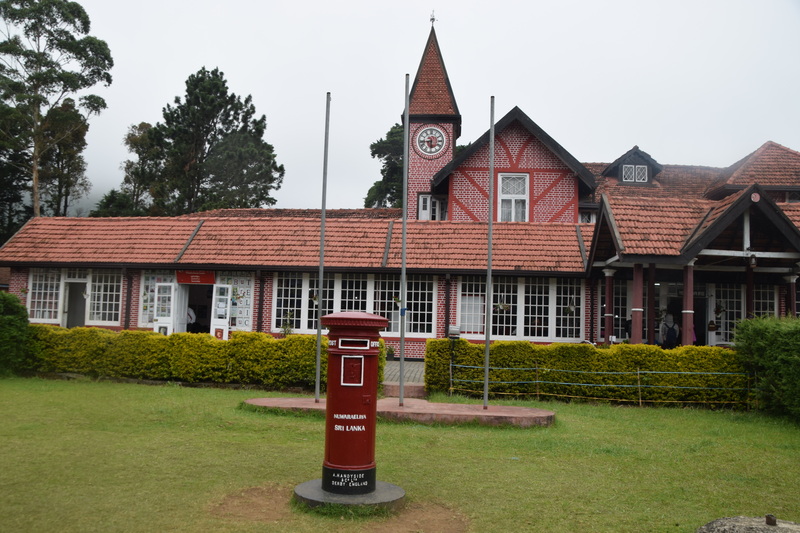 Nuwara Elija, as I mentioned in an earlier blog was a British hill-station back in the colonial days and supposedly the terraced houses, post office and few other buildings were designed the English way, however very little is left over to warrant the name of “Little England”……. 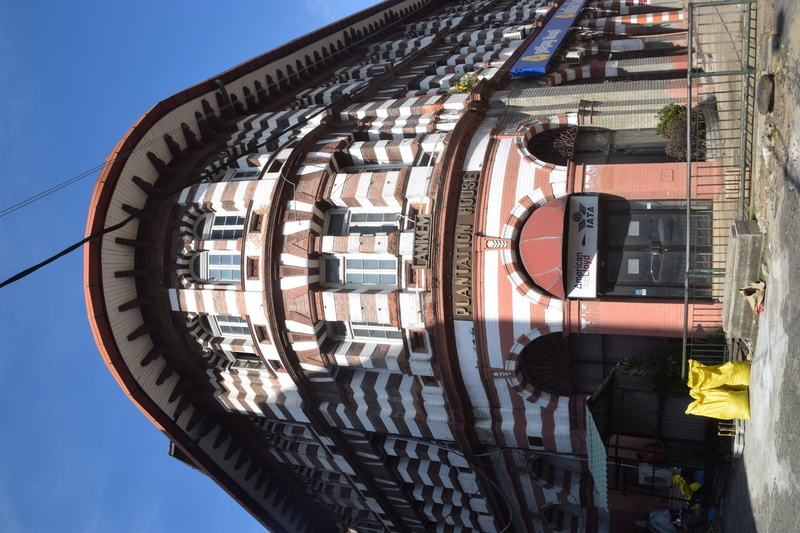 anyway, on our way to have lunch at our usual lakeside spot, Calamander, we stopped by the post office which is still functioning in its old glory and took some pictures of it as well as some of the terraced houses still standing. After lunch we drove to Ohiya where we were well on time for our train. Indika explained where we would have to board for our first class seats and then he left to drive (with our luggage) to Ella. 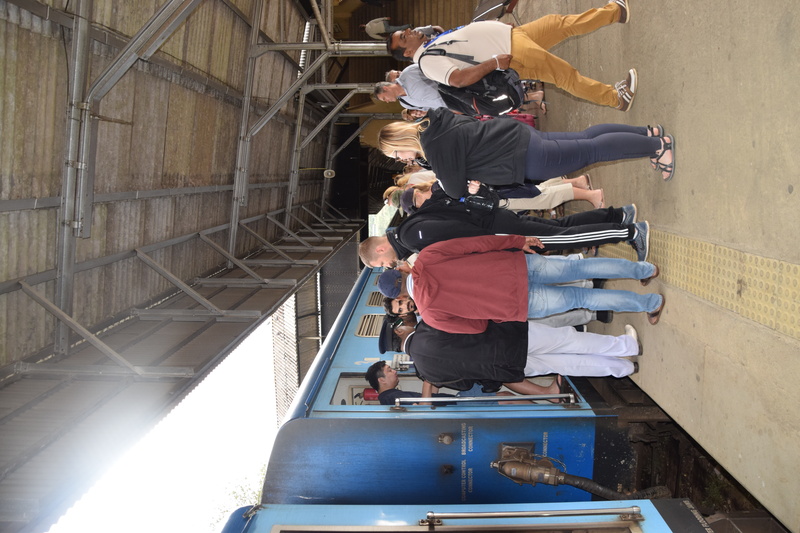 Well our train did not arrive and no signs or information was made available to the passengers so we all had to do our own investigation – it appeared that the train we were waiting for had some defects and was being repaired and hence a delay of one and a half hours……. 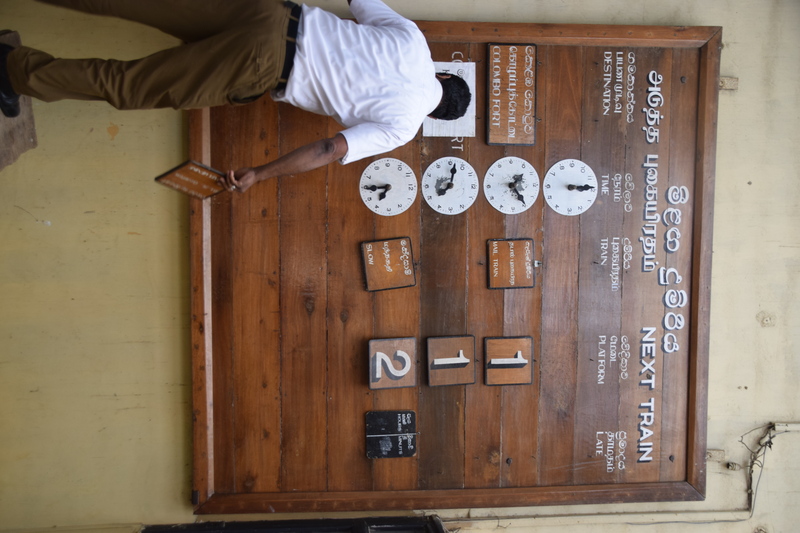 Luckily Gerry saw the station master adjusting the “electronic” timetable on the hallway wall!! By the time the train pulled in at the station it was nearly 6pm. 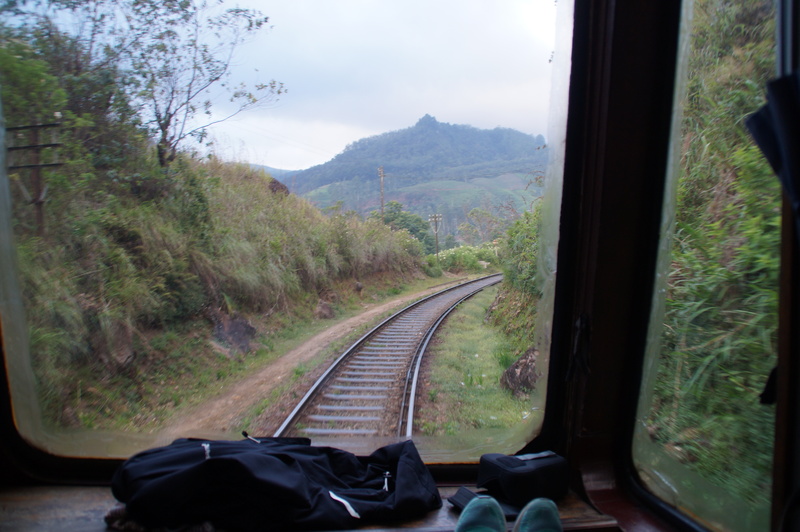 Although we had very good seats in the observation carriage right at the back of the train, within half an hour it was quite dark to observe any of the scenery and by the time we arrived in Ella it was pitch dark! Again Indika was happy to see us, he had been waiting for us for such a long time – well we were dead tired of hanging around all day! It was gone 9 pm when we arrived to our hotel, Misty Hills, and then we needed to climb some 90 steps to our bedroom. The manager told us we had the best room with a fantastic view of Ella Gap and that we could watch the sunrise the following morning. Well after freshening up, we went down for dinner. Indika was there to greet us and in the meantime he had come up with a solution to our grumbling that we had seen nothing on our train journey. 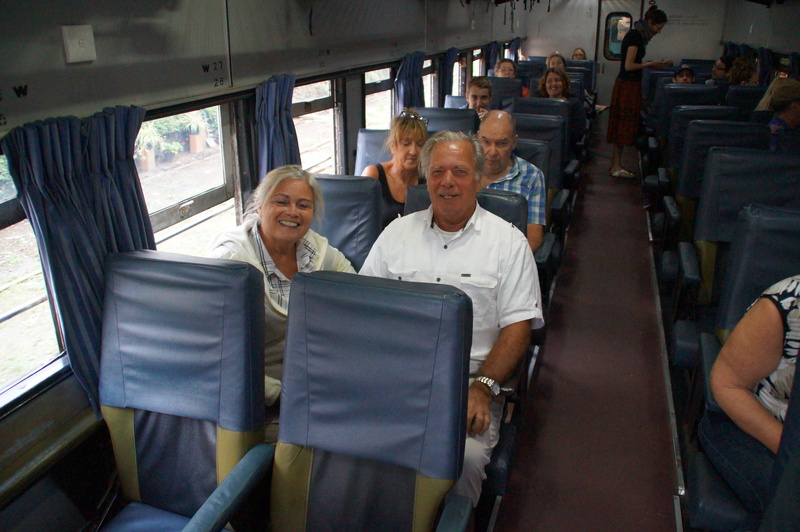 As we are staying two nights in Ella, we could take the train journey tomorrow again but we would not go all the way and step out at Demodora, where a fellow driver had an empty car and had to drive to Ella to pick up his guests from the train as they were doing the same trip as we did (but shorter). I think it was a very good idea and even Gerry agreed with it. What seemed to have been a wasted day, Indika managed to find a good solution! 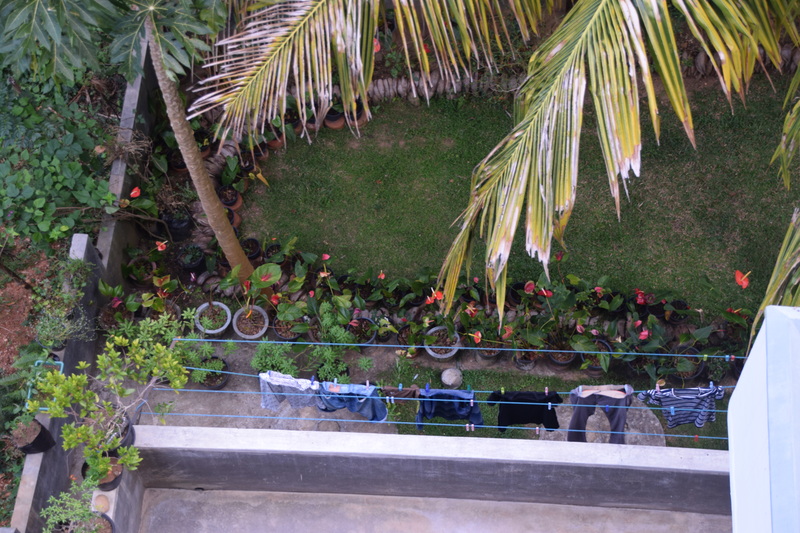 The only thing now for us to do is climb the 90 steps to our bedroom………. 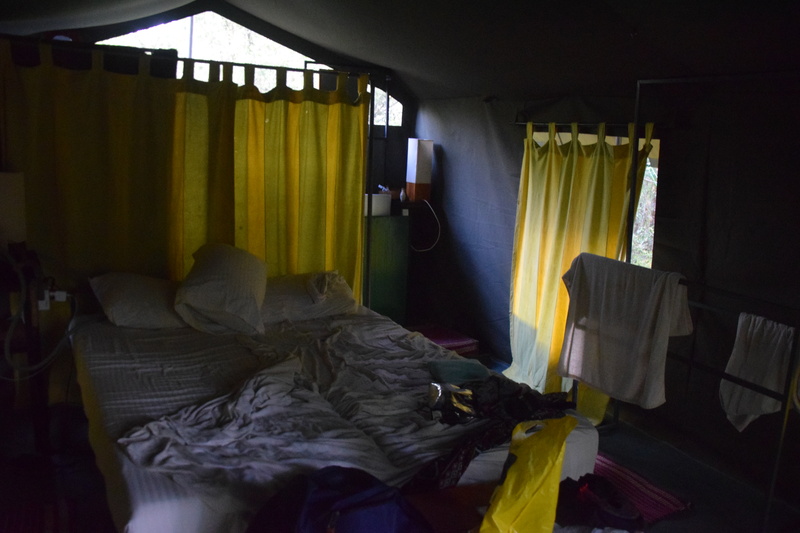 What a beautiful way to wake up – birds chirping in the jungle that surrounds our guesthouse – it had rained at night but now it was dry and the jungle was steaming away. Although we had a peaceful night, it actually did not start off that way – a whole group of new guests turned up late and besides talking and laughing out loud, they even tried to get into our room (obviously by mistake!) anyway they soon settled down and we were all able to have a good night’s rest. Today is a travel day and we were in no particular hurry to leave this guesthouse as its owners are such hospitable people. Anyway at 8 we went down for breakfast and as soon as we arrived in the dining room, we were surprised to see a whole crowd already enjoying breakfast – there must have been at least 8 persons x most of them young but with a few older men in the group. After greeting each other and naturally asking where everyone came from, they replied that they were from Iran – up to now have never met Iranians travelling!!! I immediately asked which one of them had tried to get into our room – of course jokingly – so that made them even more loud….. both Gerry and I thought they were Italian but they were much more noisy! 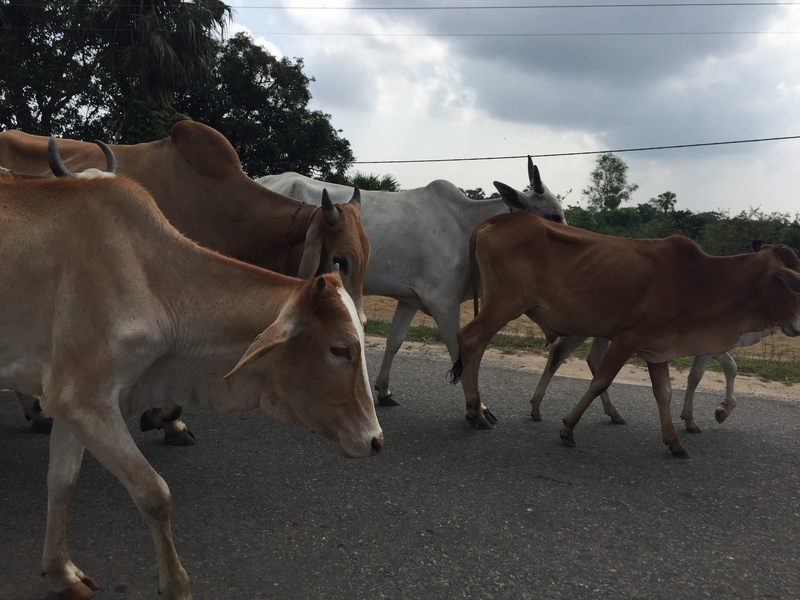 It seemed that they were following the same route as we were so who knows perhaps we would meet them again…. Indika was well on time and the house boy brought down our luggage to be stowed away in the booth and by 9.15 we were on the way. 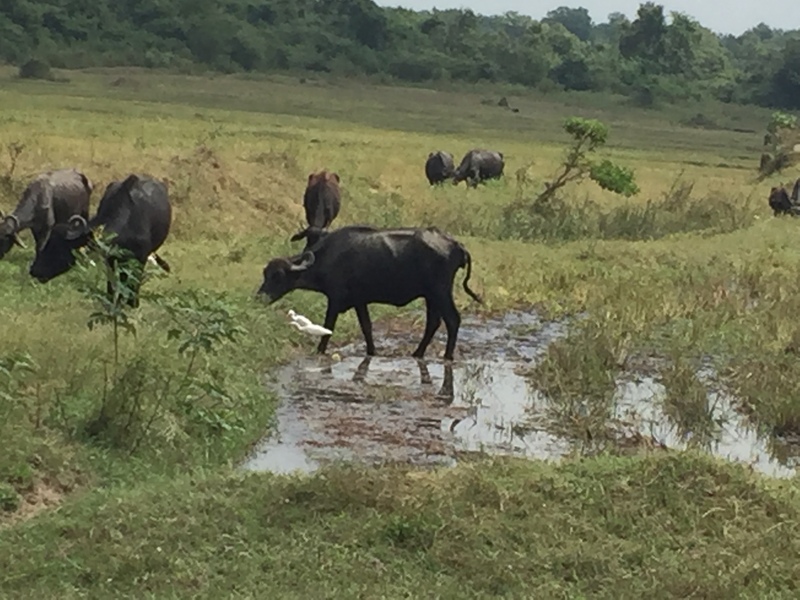 As yesterday we had missed going to the Udawattakele Royal Forest Park, Indika suggested that we do that this morning. 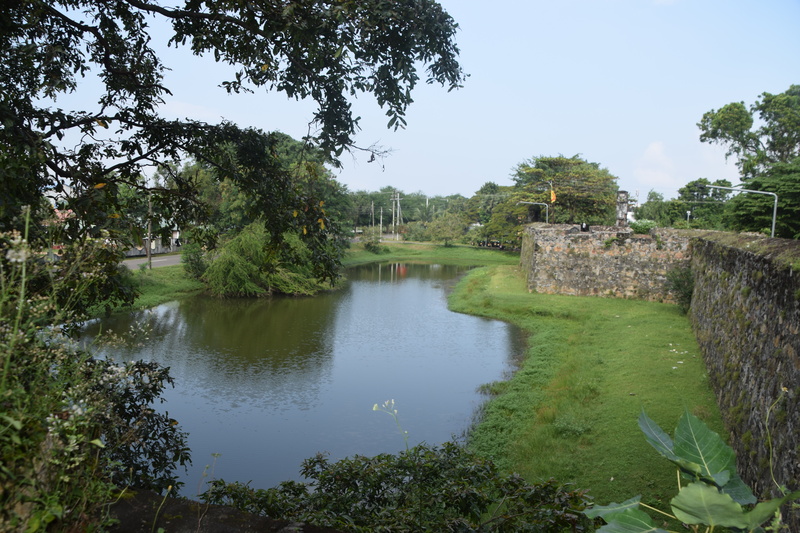 This Forest Park has always been regarded as a part of the Royal palace and the pond at the entrance was known to be where the royal family bathed. We paid our entrance fee and received a map which had the pathways which we could follow. According to the lady who sold us our tickets, the whole walk around the park was some 5.5km and it would take us just over an hour – well to cut a long story short, we managed to get lost! 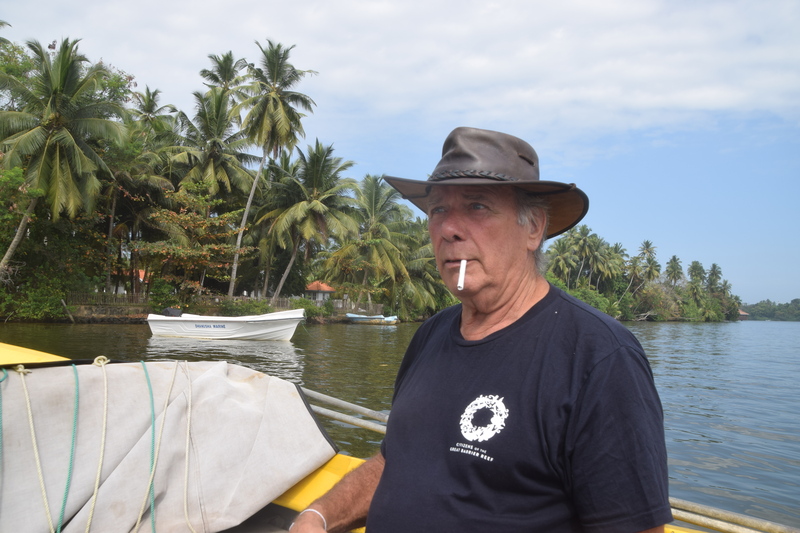 So back in Indika’s car, we said he had to find us somewhere where we could use the restroom, Gerry to have his smoke and have something to drink before continuing our drive towards Nuwara Elija. 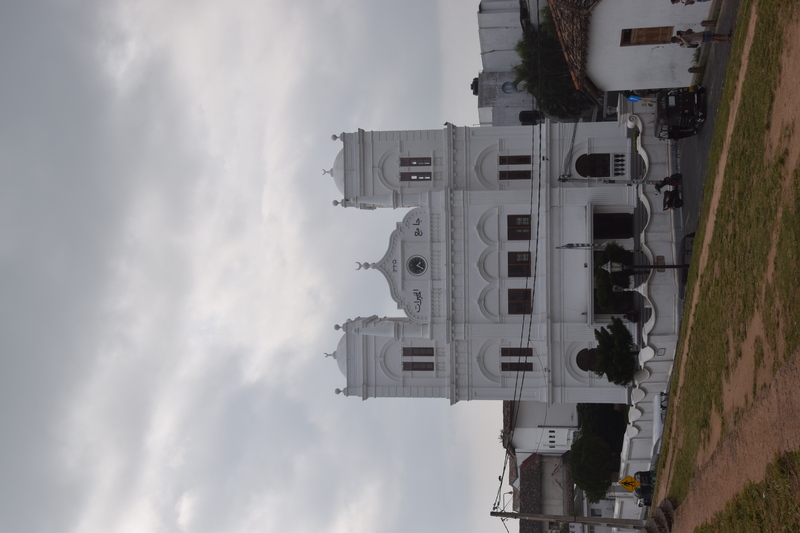 We were lucky that we had good weather when we were lost in the Royal forest as now the clouds were gathering and we were not sure whether we would have a dry drive through the mountain range. 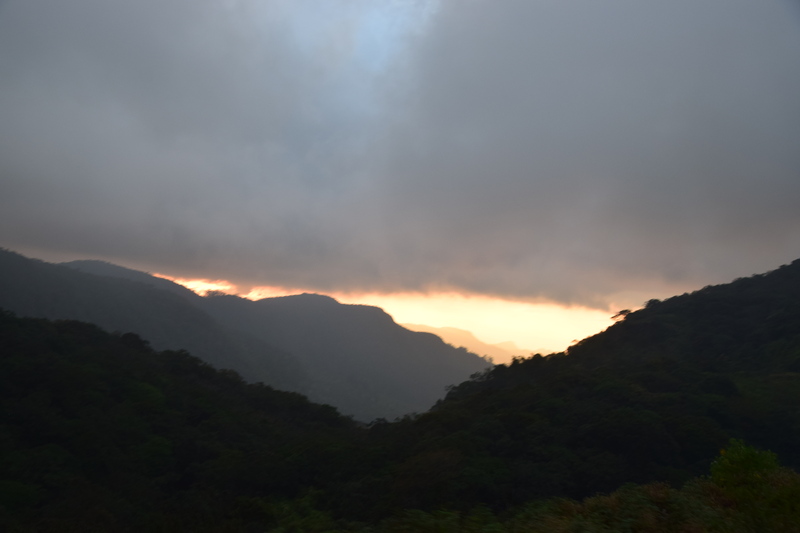 The mountain range we drove through is known as the Knuckles Range which incidentally are now included as one of UNESCO’s World Heritage Sites. Apparently, lots of trekking takes place in this region but always with a guide. 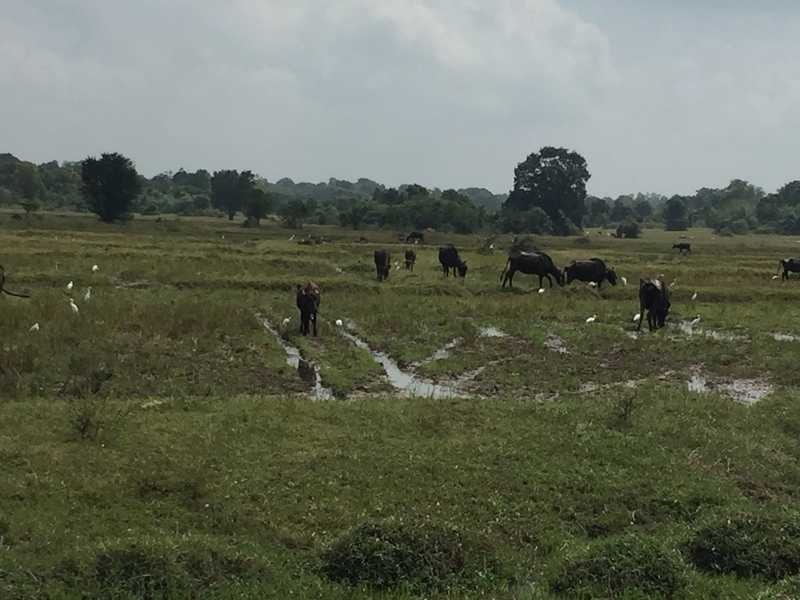 The foothills of the Knuckles Range are dotted with villages and we could see these while driving. 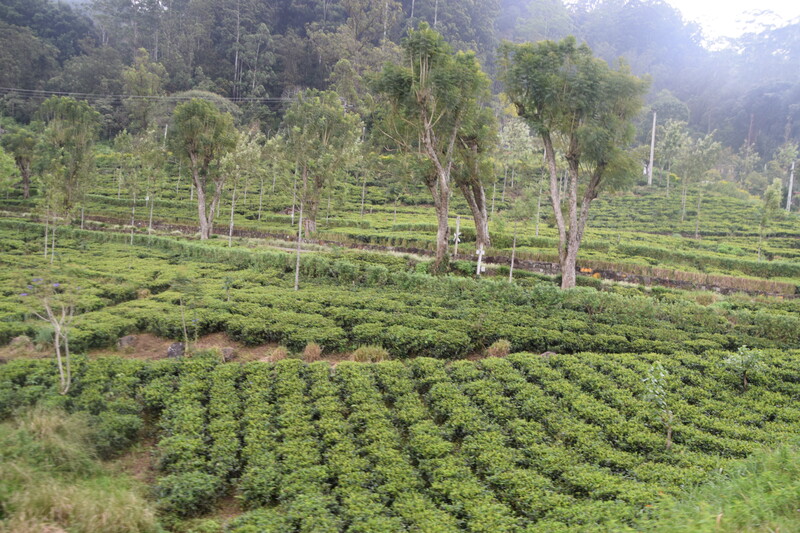 Indika took us to a tea plantation, Glenloch, which was first planted by a Scotsman some 150 years ago and is one of the biggest plantations in Sri Lanka. 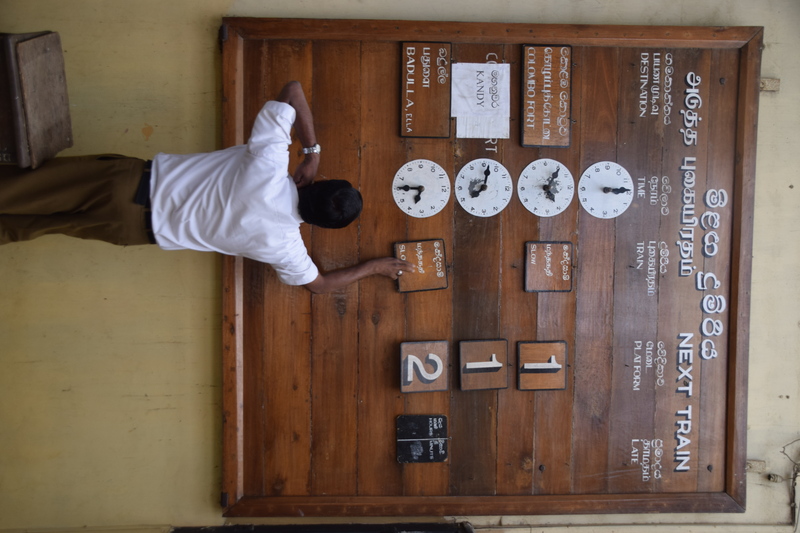 Here we were given a private tour by a lovely lady who explained how the leaves are picked and which are used to make white, green or black tea and how it is dried and fermented and then sent off to Colombo where there is a huge tea market and sold to brands like Lipton, Tetley and Dilam. 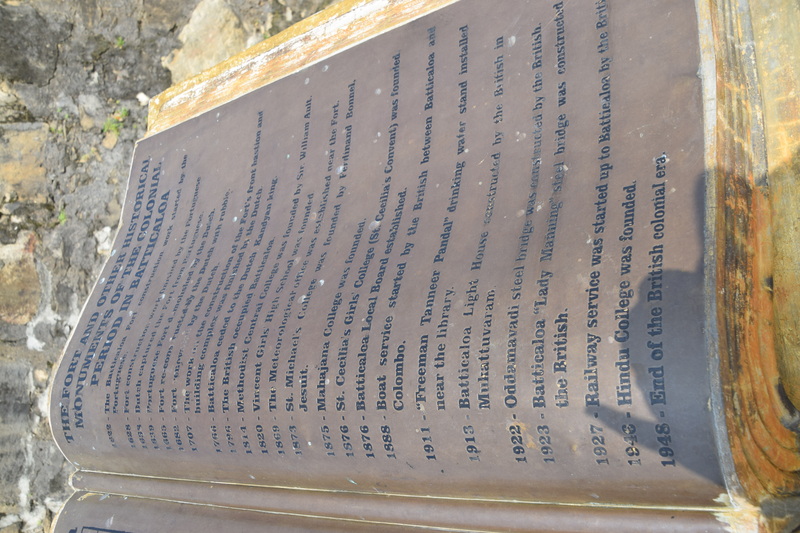 Just a little bit of history on the tea industry in Sri Lanka – apparently the British tea barons back in the colonial days could not get the Singalese to work on the Apparently only 80% remains in Sri Lanka and sold under its own brand name. 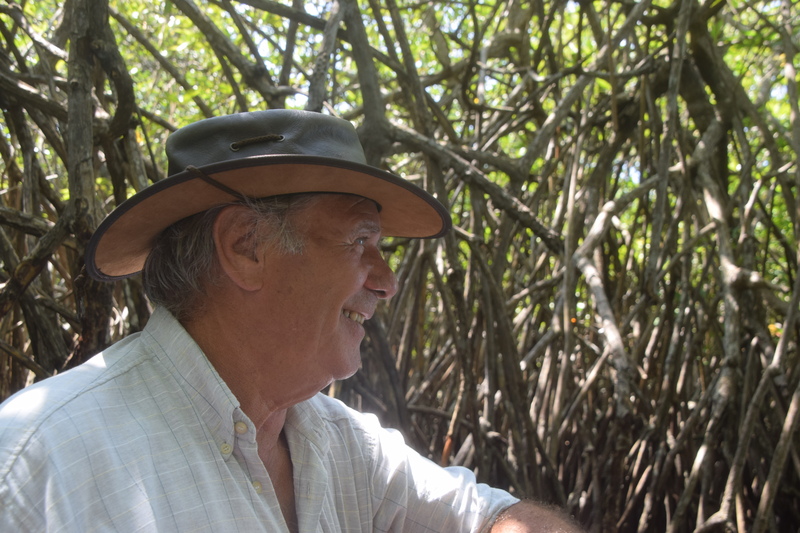 When the tour was over, we had the opportunity to try some of the teas and both Gerry and I came to the conclusion that the white tea has the best taste and aroma – but obviously the most expensive! 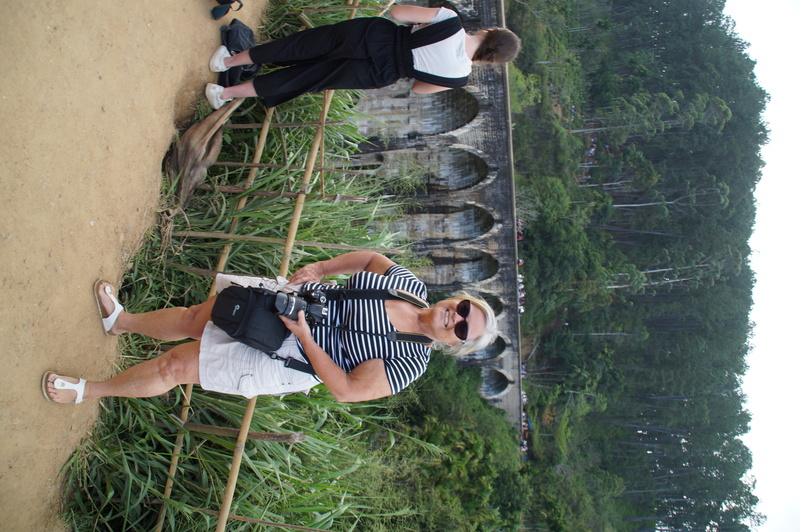 As we had instructions from Gerry’s daughter, Lisette, that should we feel inclined to buy anything for her from Sri Lanka, then we should get her green tea – so while Gerry continued enjoying his cup,of tea (with chocolates), I went to the factory shop to choose some tea to take back home. By the time we got back to the car, it started raining heavily and we saw the mountains just disappearing behind a shroud of low hanging clouds. 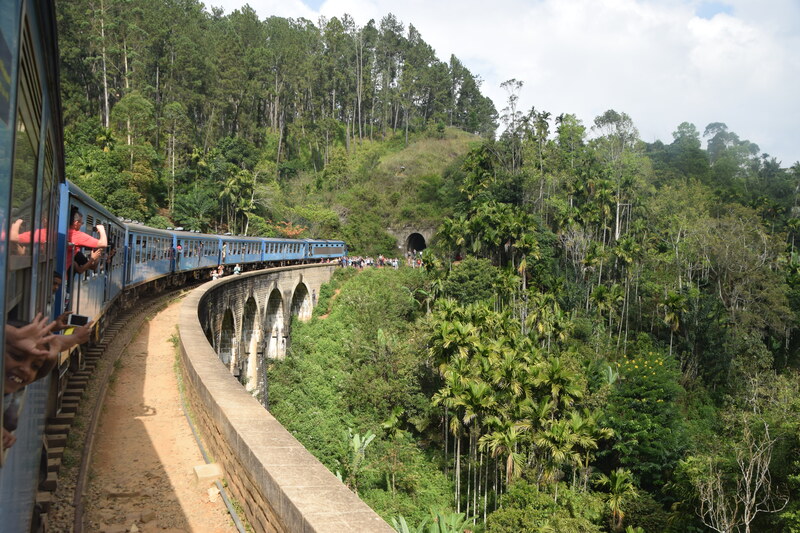 We were on our way to view the various waterfalls in the hills – the Ramboda waterfall. We had a very good view point to,take pictures but we also drove to a hotel for some lunch and where we walked down quite a few steps to admire this waterfall,as it came crashing down. 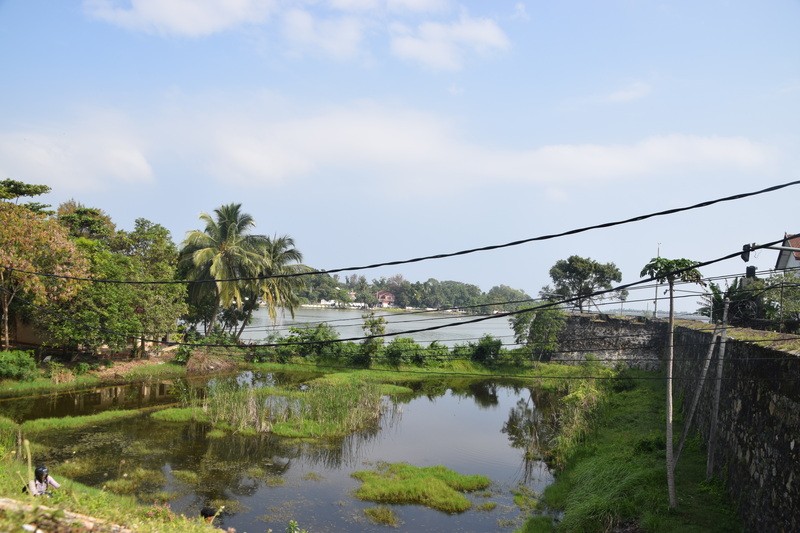 According to Indika, normally there is much more water that the valley would be flooded. Further down in the valley there is a dam to hold all the water. 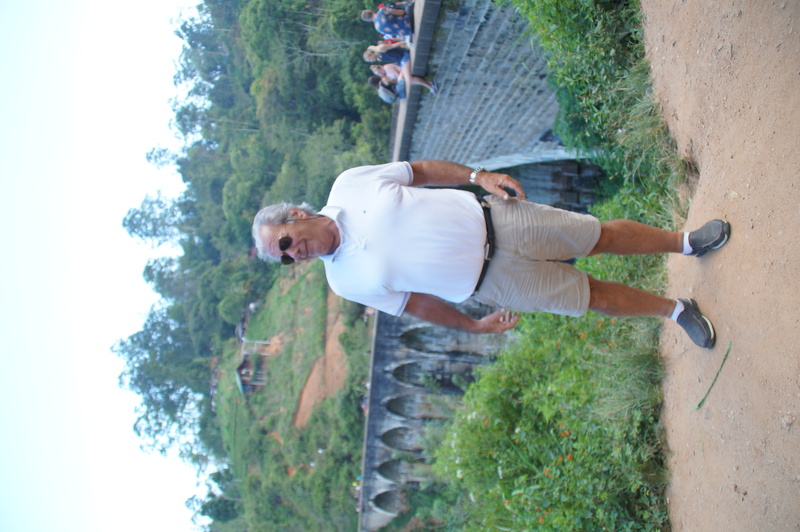 As we walked up from the waterfall, we came across the Iranian group who had stayed in the same guesthouse in Kandy. They greeted us with so much friendliness, however I was keeping my fingers crossed that they would not be staying at the same place we would be staying. 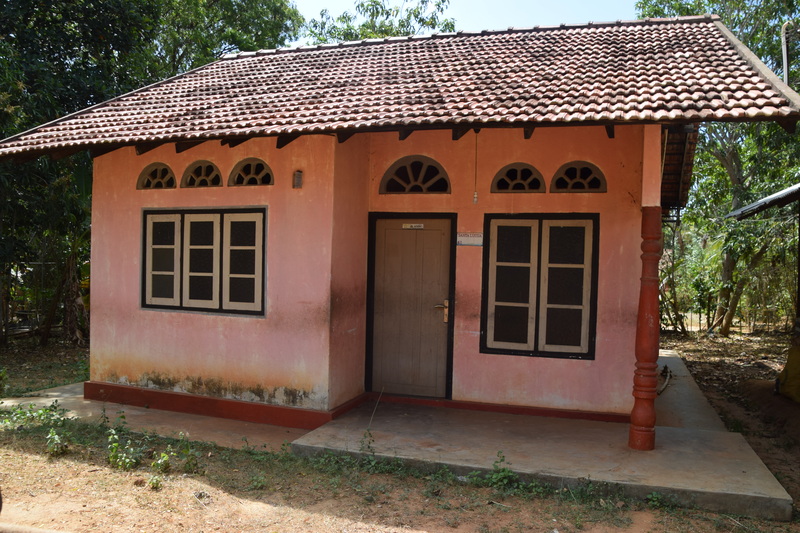 Indika said that the Oasis Bungalow estate only had four bungalows so the Iranian group could not fit in……. By the time we had finished lunch we were having torrential rain. Everyone said that tomorrow will turn out sunny and that this is typical weather of the hill country region. No wonder it is so green and luscious! 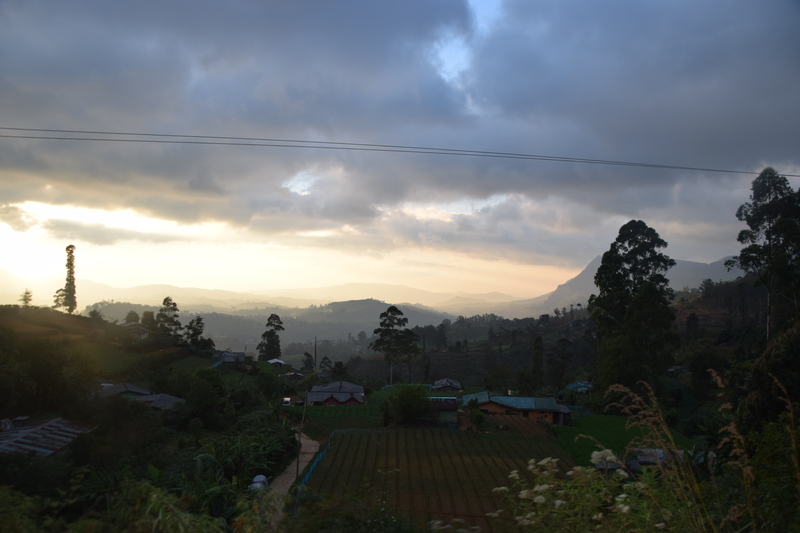 We had another hour’s drive to our next stay and I am sure I would have enjoyed the trip more if it hadn’t rained so much – the hills and tea plantations were all lost behind the clouds….. 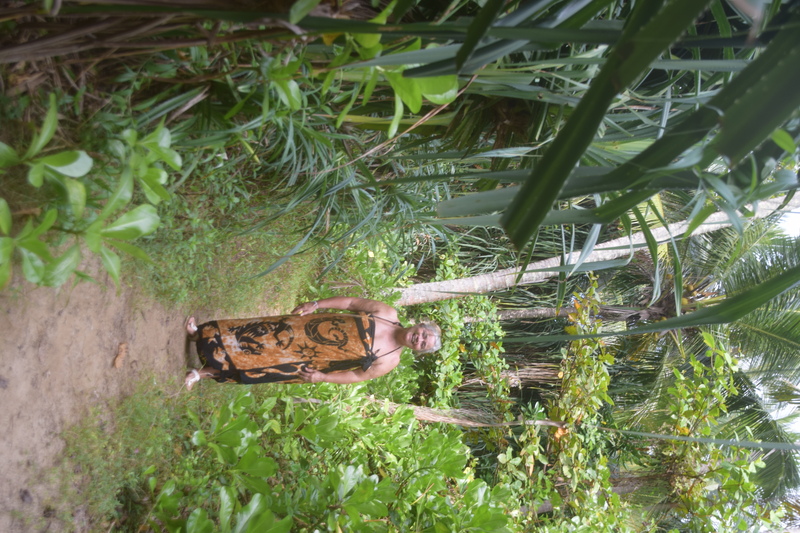 Anyway we finally arrived at our destination Oasis Bungalows at Nuwara Elija – in a torrential rain. 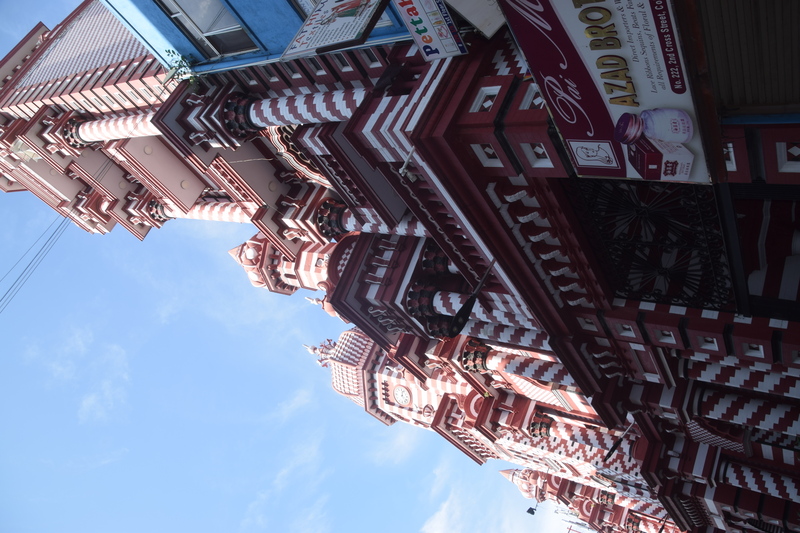 Indika suggested we go for another Aryuveda massage and then dinner and that’s what we did. What was it heavenly to wake up to the sound of different kinds of birds chirping away early in the morning just before sunrise! 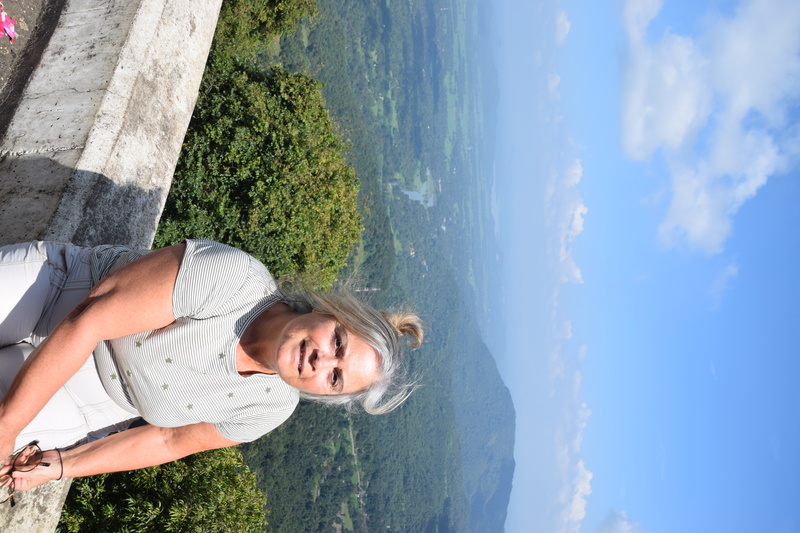 Up in the hills of Kandy, we had a very peaceful and restful night – no sounds of cars or people; just surrounded by green foliage and bird song! 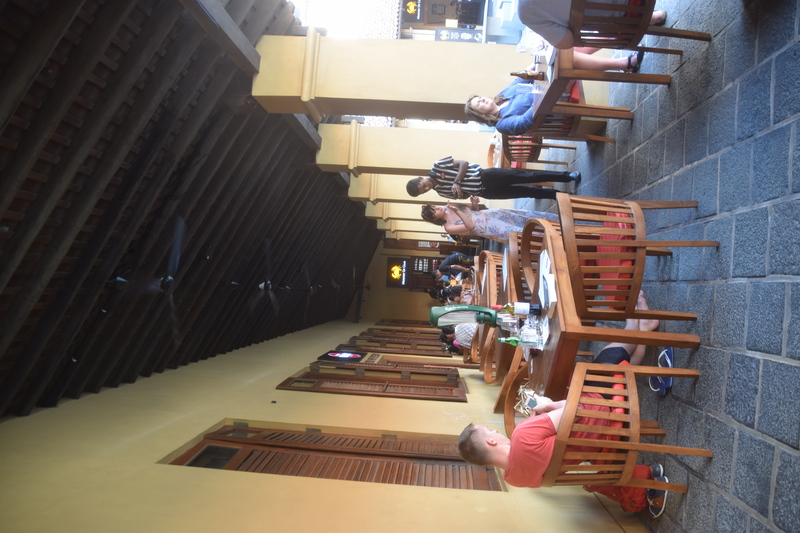 We had requested to have breakfast at 8am as Indika would be collecting us at 9am to go sightseeing in Kandy. 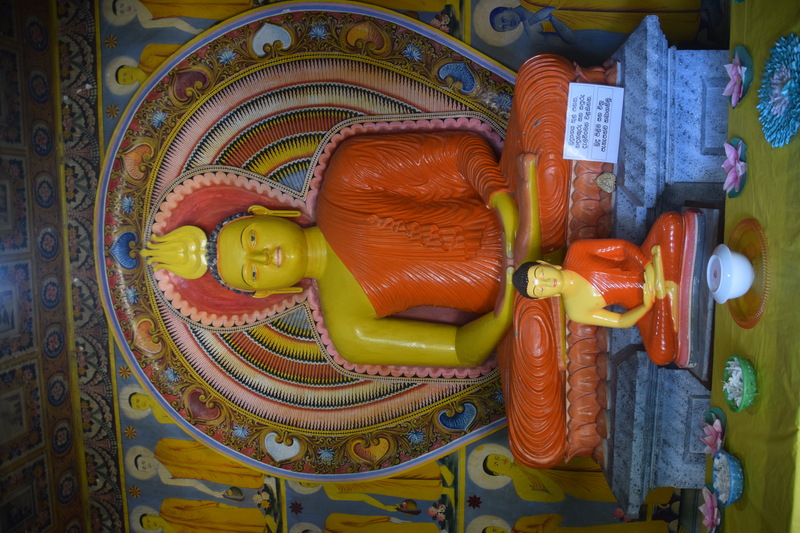 Last night, while sitting with the various guests and the guesthouse owners, we were given some suggestions as to how to spend the day in Kandy: visit the sacred temple of the Buddha tooth relic; go up to the Udawattakelle Sanctuary; spend a few hours at the botanical gardens; take a walk around the lake; attend a traditional dance and fire walking show. Well we only achieved three activities plus an extra one to kill the time before attending the traditional dance. Well breakfast was a feast again as it included the egg hoppe and plain hoppe with an onion and chili pepper chutney and a platter of fresh fruit. We finished our breakfast well on time so that we could leave immediately Indika arrived to collect us. The drive down the narrow hillside road was just as exciting as coming up yesterday afternoon but this time there was more traffic with loads of tuc-tucs carrying uniformed school children. 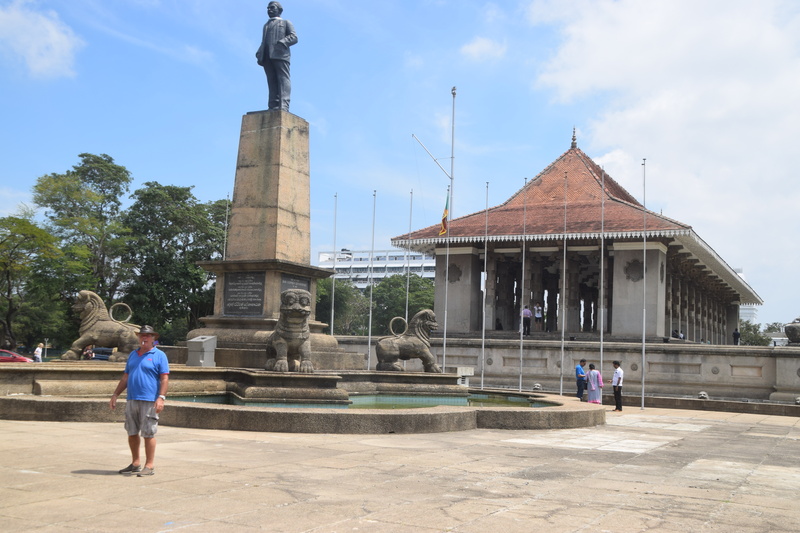 Our first point of interest was the Temple of the Tooth Relic – 425 year old, golden roofed temple houses Sri Lanka’s most important Buddhist relic, a tooth of Buddha which was salvaged by a princess when Buddha’s body was cremated on the funeral pyre back in 483BC and smuggled into Sri Lanka in the 4th Century AD. 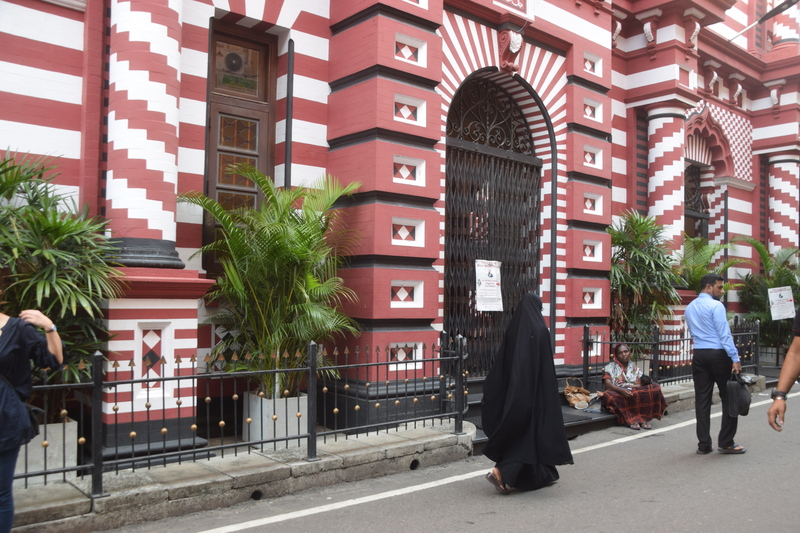 By the the time we arrived at the temple and had engaged a free lance guide, it was time the heavily guarded room housing the tooth relic to open its doors for devotees to worship – however you don’t get to see the tooth but rather a Golden casket that is shaped like a stupa and in which a series of 6 caskets lie within it housing the tooth relic. 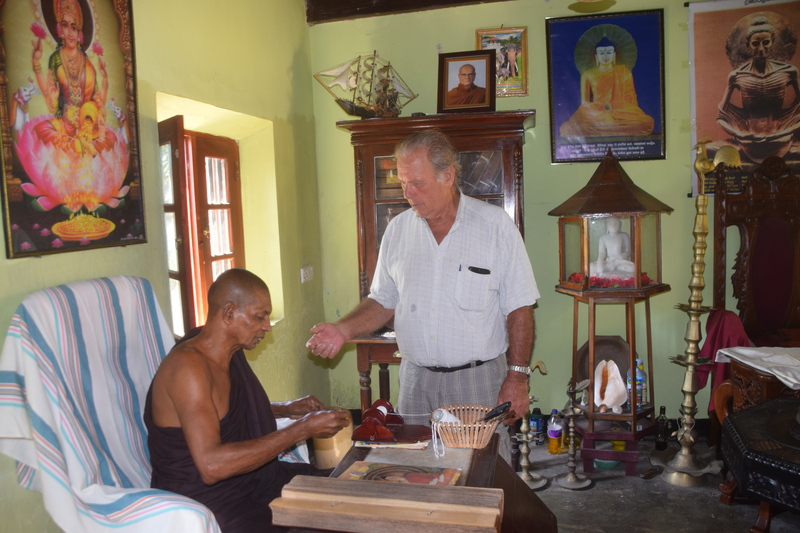 It was so very interesting to see the total devotion shown by the Buddhist devotees. 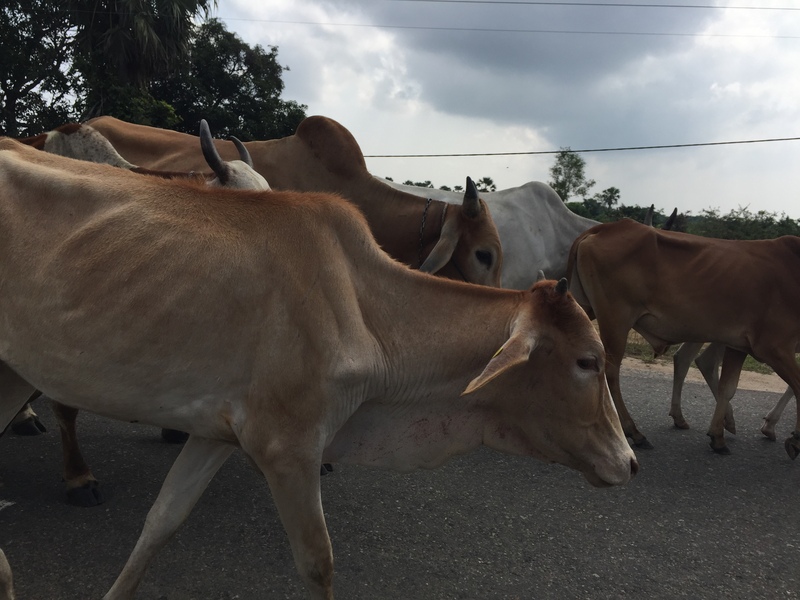 Some had their new born babies with them and this sort of scared me; what if anything happened – those babies could be trampled to death! 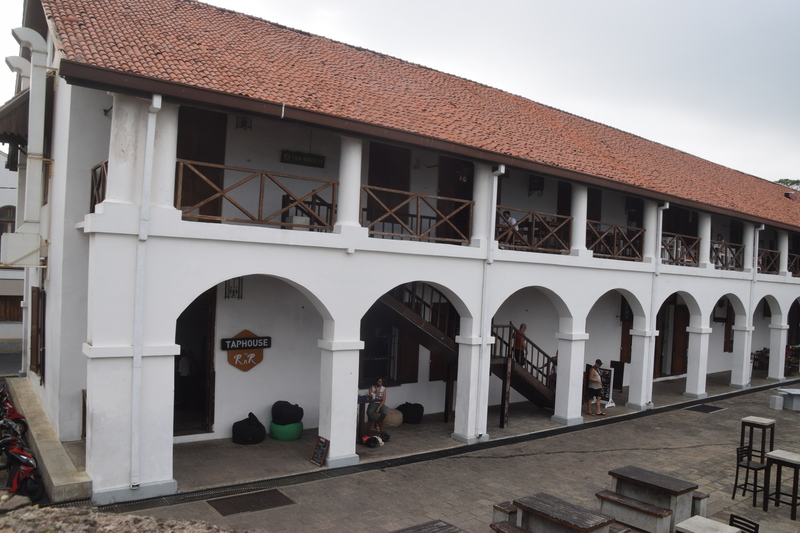 Next, we moved to the Audience Hall which was built in 1783 and wooden pillars support a wooden roof. 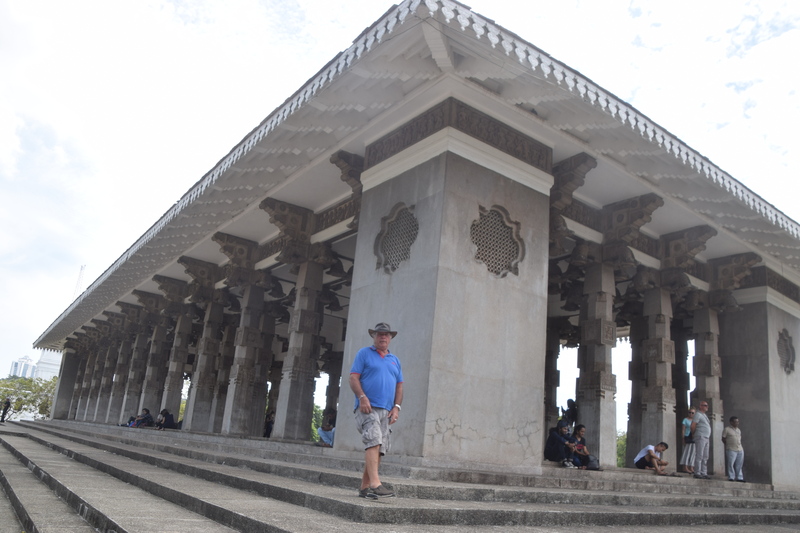 This is part of the Royal Palace which is also situated in the temple complex. 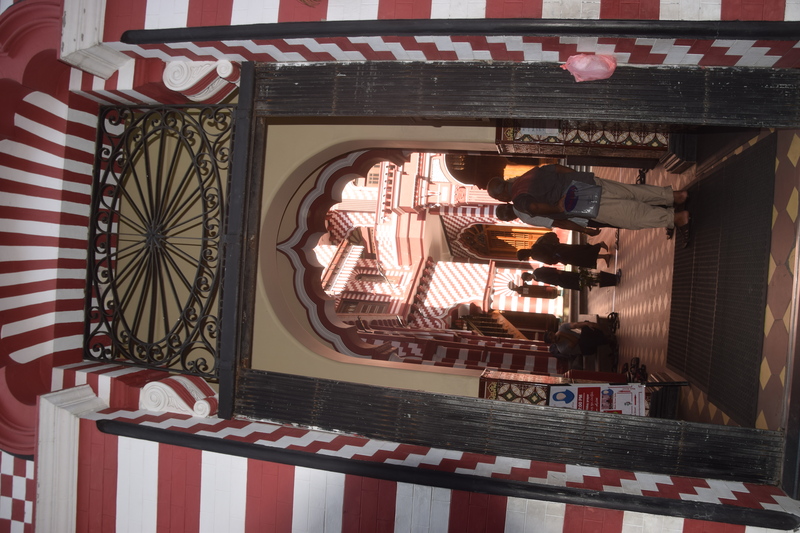 Further, we went into an other area known as Rajah Tusker Hall. 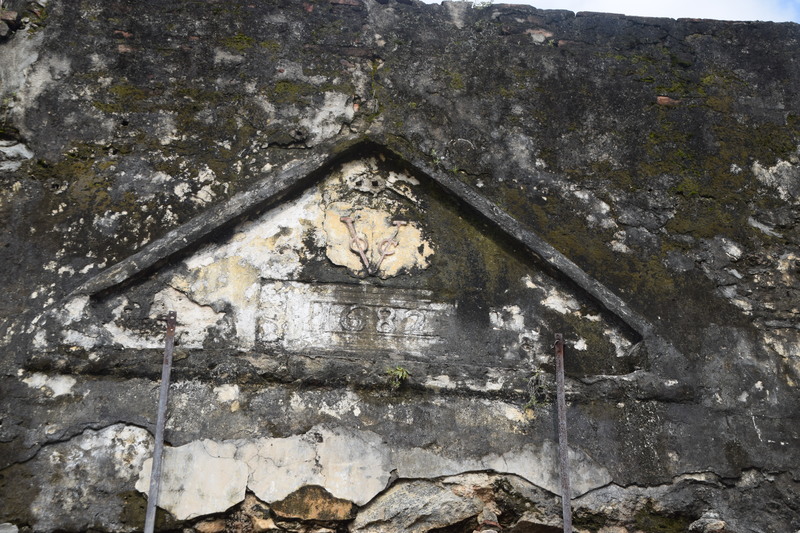 Here we found a stuffed elephant who had served Kandy for 62 years and died in 1988. 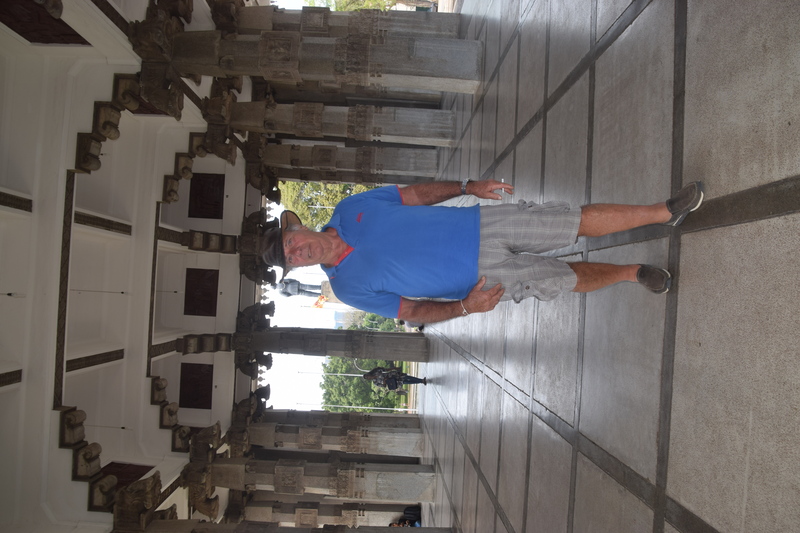 It is incredible how many visitors – both local and foreign come to this temple complex, however one had to stand still for a while when we were told that back in 1998, the temple complex had borne significant damage when the LTTE (Tamil Tigers) detonated a truck bomb on the street opposite the temple. 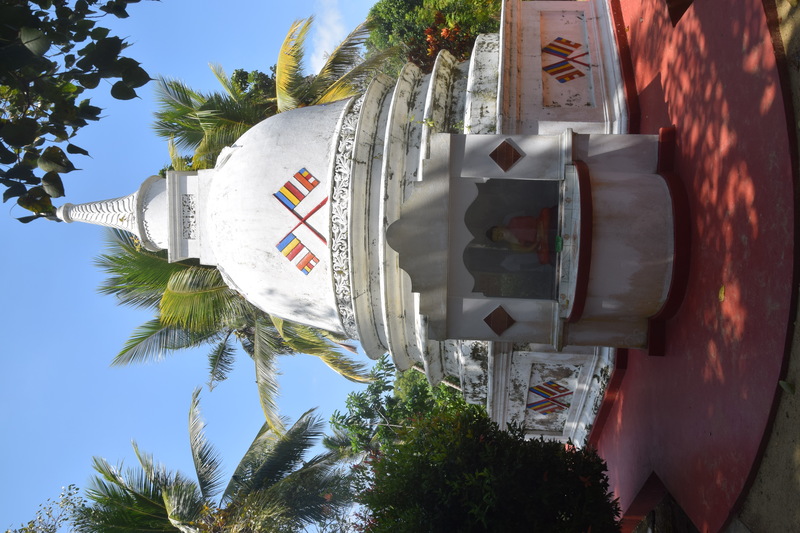 When we left the temple complex, we first had a break and treated ourselves to fresh watermelon juice and then Indika drove us to the Royal Botanical Gardens. 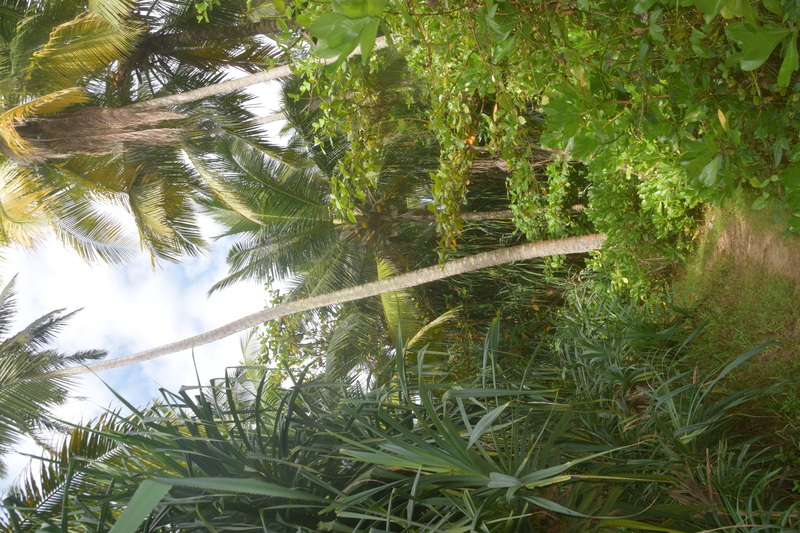 What a serene garden filled with exotic palms, trees and plants. 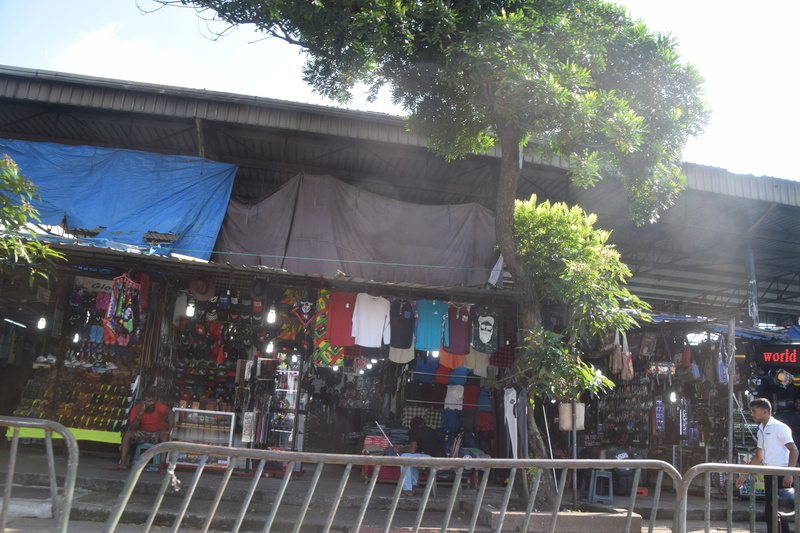 While the entrance is on a busy corner not far from the bus station, once we were inside and had strolled a few hundred meters, we did not here any traffic any more. 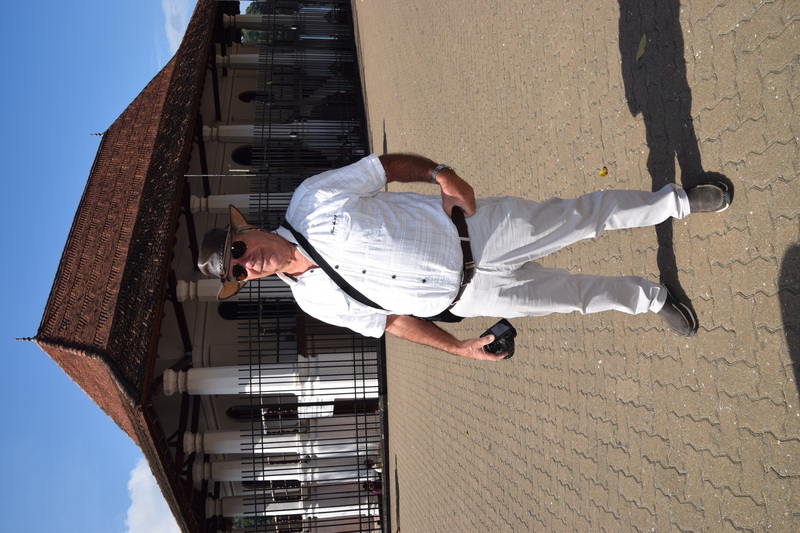 What was very interesting is that we saw so many school children in their neat uniforms and wearing sun hats all walking two by two in a single file – the girls wearing white uniforms and the boys in blue shorts and white shirts. This is a sight I have never seen in the Netherlands…….. Dutch school children are ever so noisy!! At one point, Gerry and I sat down on a bench and when these school kids filed in front of us, they all gave us big smiles and waved to us……..
We must have spent some two and a half hours in this garden and our agreement was that I would call Indika to come and pick us up when we were ready – well I was really annoyed with myself as I had left my phone in my rucksack and that was in Indica’s car; Gerry tried calling my phone but apparently Indica did not react to it. Surprisingly enough, he must have had the same thought as he came to look for us round the same time we left the gardens……. 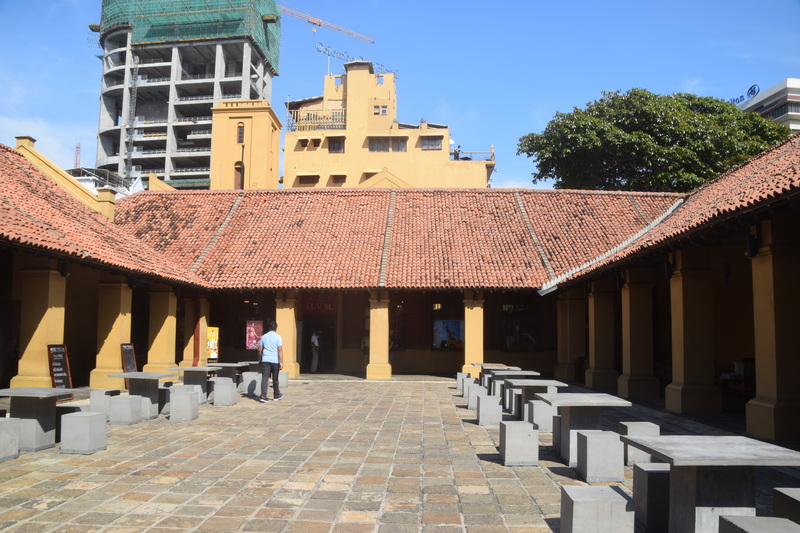 Next on our “to do” list was to attend a Sri Lankan Culture Show but as we were somewhat early, Indika tookus to a Gem Factory opposite the culture show premises. 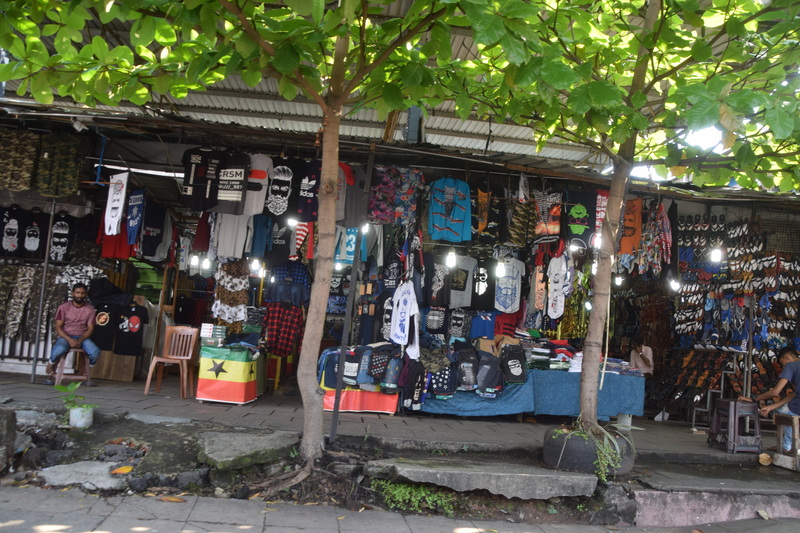 In all my travelling, I know that when one is taken to such premises, you are expected to buy something (that happened to me the other day when we visited a wood carving factory and shop). 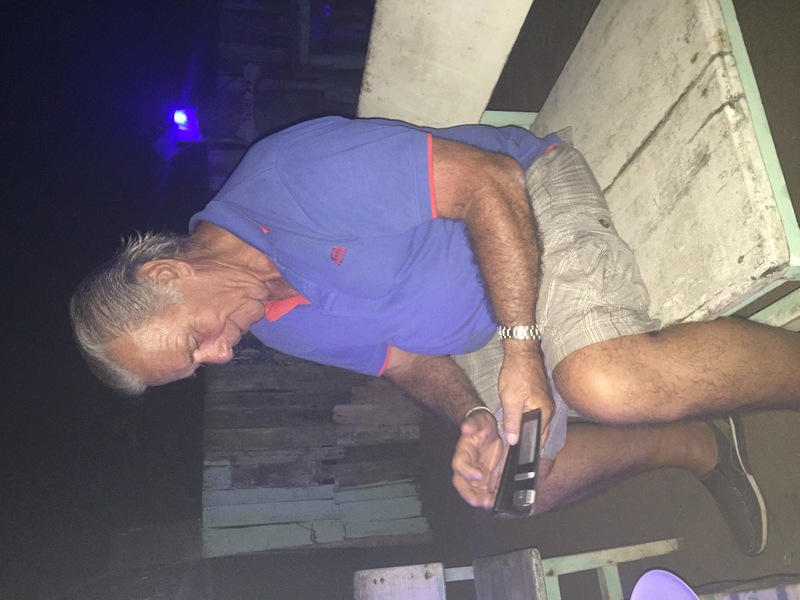 Anyway it was interesting to see a documentary film of how precious stones and gems were mined in Sri Lanka and I must say it was a hazardous way of discovering these gems – be it sapphires, moonstones, rubies and other stones. Then of course you are led into the shop and straight away if you show an interest in any particular piece of Jewellery, it is removed from the show case and the price calculated for you in any currency you want…… well I played the game – I showed interest in a blue sapphire ring with diamonds which I thought would match my ear rings which I had bought back in Dubai. Well even with the discount, I wasn’t buying this ring and immediately I saw the attendant’s disappointment………. well we left the premises and crossed the road to go to our Culture Show – we still had time so we had a drink on the terrace. Indica had acquired really good seats for us In the front row and once the show began, we were mesmerised with the music and dance. 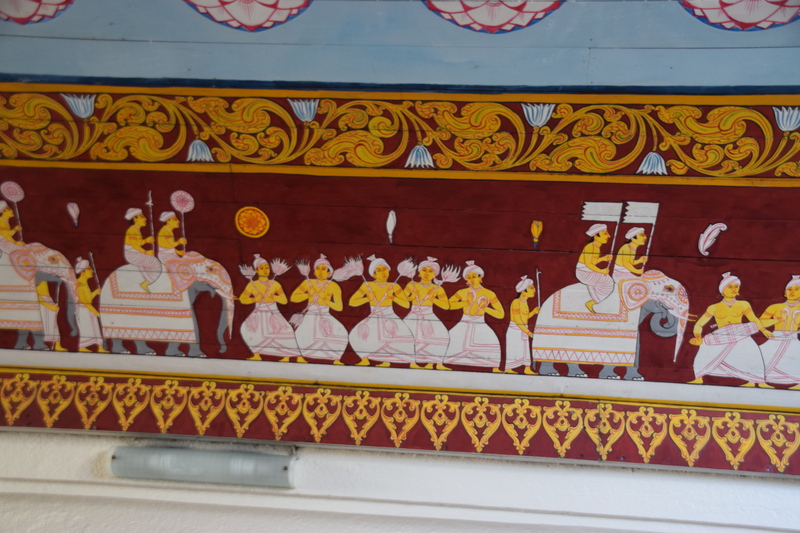 The playing of drums, flute and tambourines was the background to intricate dancing movements. And finally the “moment supreme” was when we had to go out onto the balcony to watch fire eating and fire walking. All in all a very entertaining part if the evening. 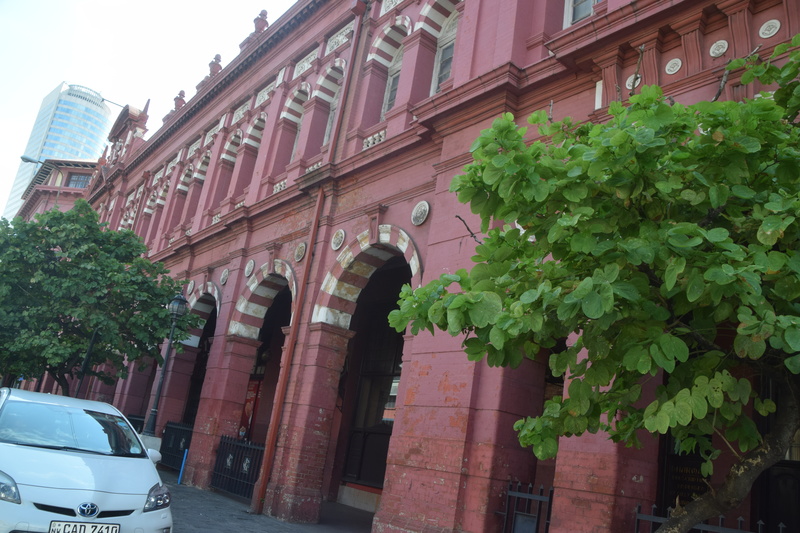 Drums and flute – it was like we were in a trance! Walking on coals and swallowing flames…. By the time the show was over, we were quite ravenous as we had not had any lunch but rather snacked on fruit and fresh fruit juices. 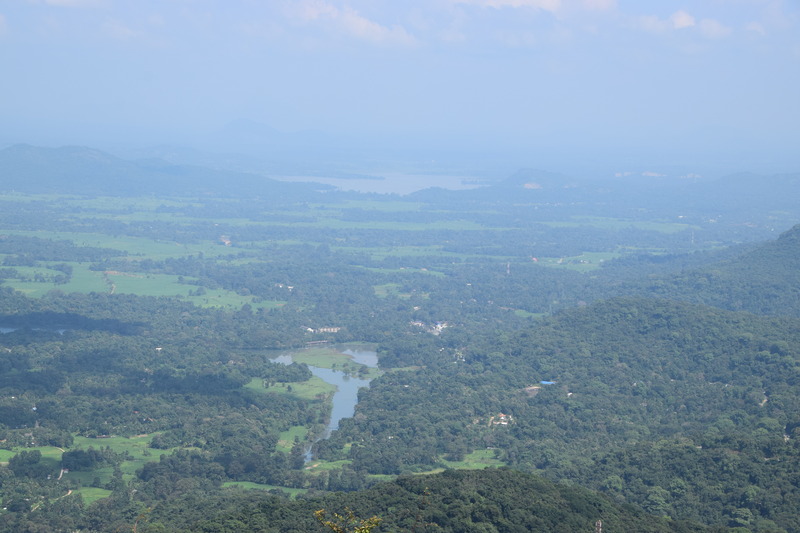 Indica had made a reservation for us at a hill top restaurant, Senani, overlooking Kandy Lake and the city centre. This was truly magnificent especially as it was our last night in Kandy. 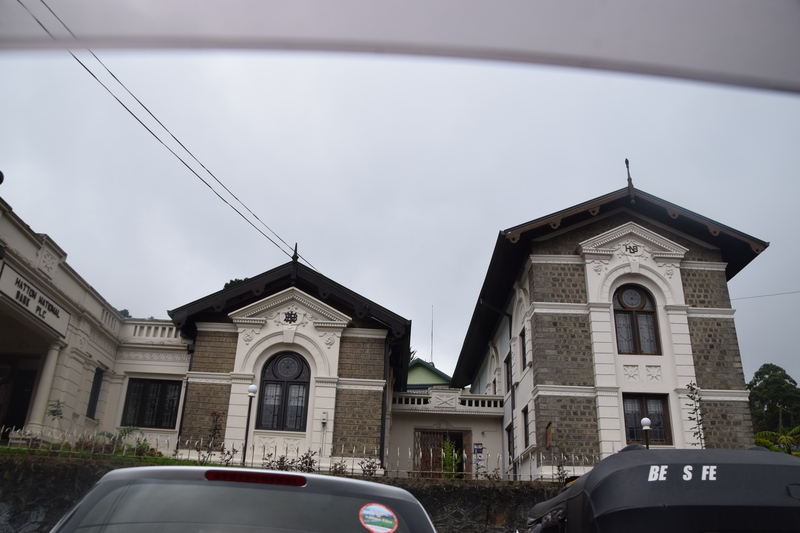 By the time we drove back to our guesthouse, it had started drizzling so you can imagine I was glad to be back home as I did t fancy the winding narrow uphill road in total darkness and rain. 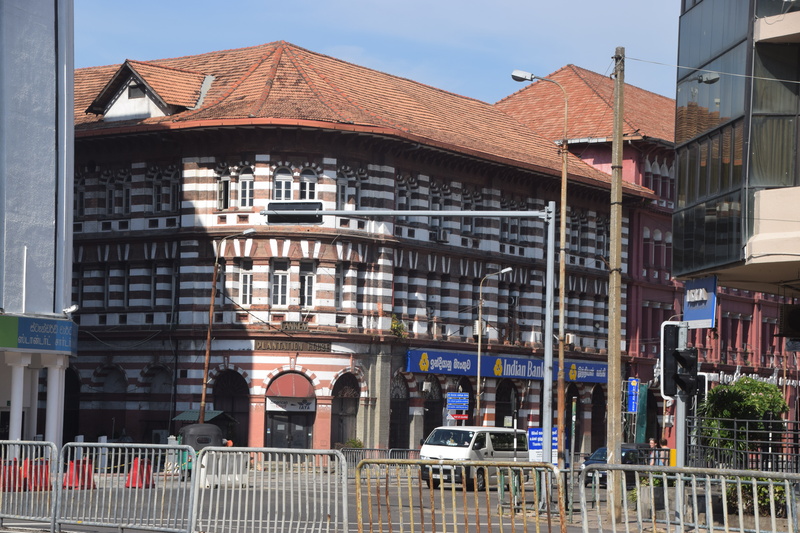 Tomorrow we will be leaving our guesthouse and will be driving to Nuwara Elija, also referred to Little England as during the colonial days, the British used to come up to this hill station, leaving the stickiness and heat of Colombo and Kandy behind them for a few summer months! 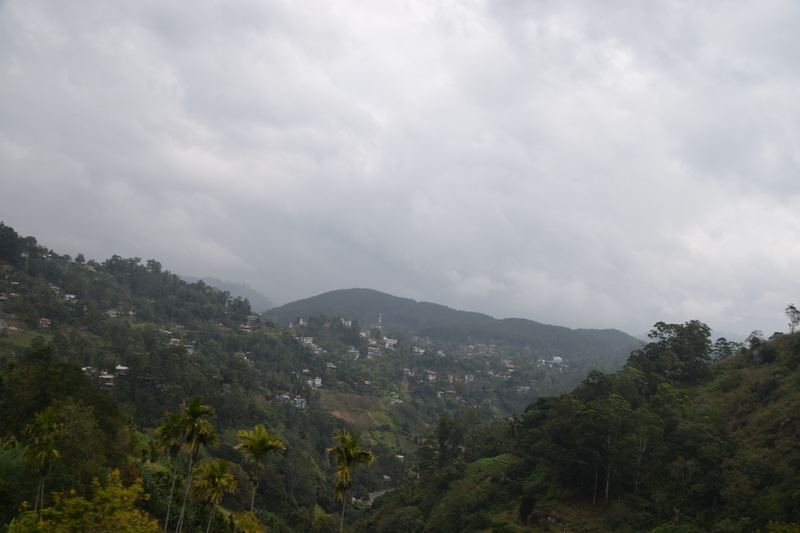 This was a really strenuous day spent driving only to end in an oasis up above the city of Kandy. 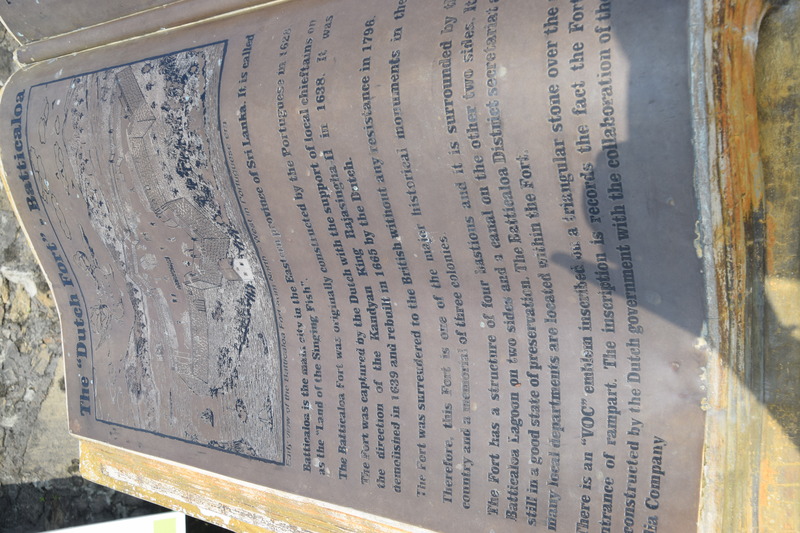 Originally we had planned to go back to Sigiriya to have a last attempt at climbing the boulder rock but then we found out that 36 km further south from Pasikuda, there was an original Dutch Fort dating back to the VOC age. 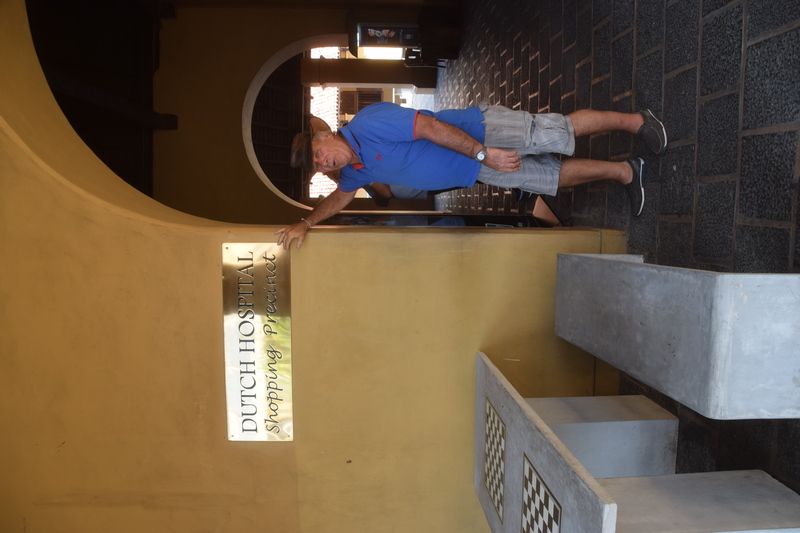 For those not familiar, the VOC or the Dutch East India Trading Company was one of the first companies in the world back in the 16-17th centuries set up with shareholders participation’s. 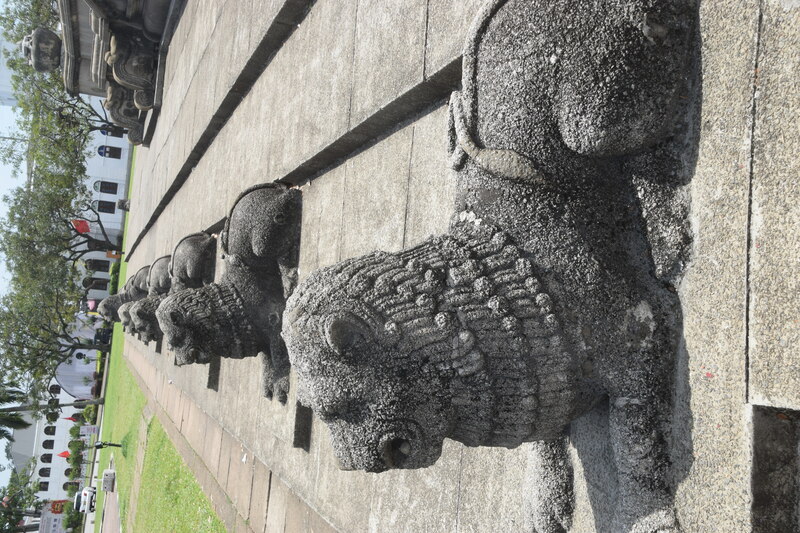 This company set up trading posts all the way to Indonesia and Japan and hence also in Sri Lanka. 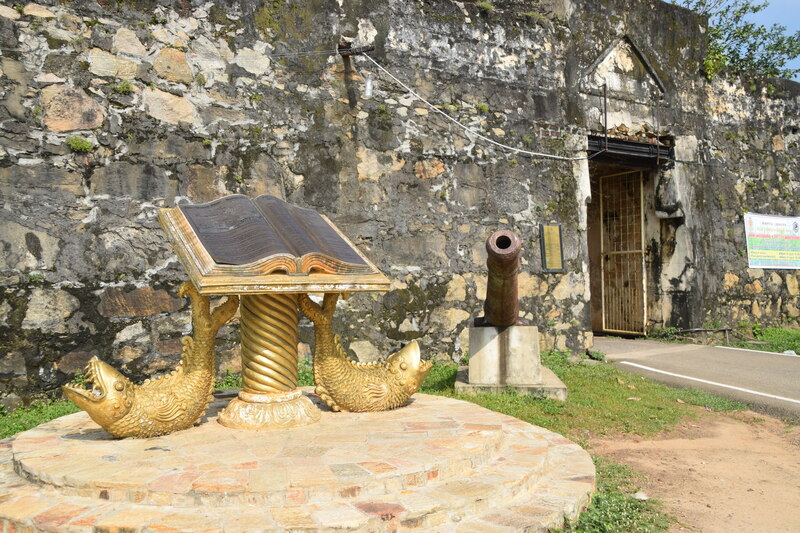 Actually this specific Fort was first built by the Portuguese in 1628 and 10 years later taken over by the Dutch. 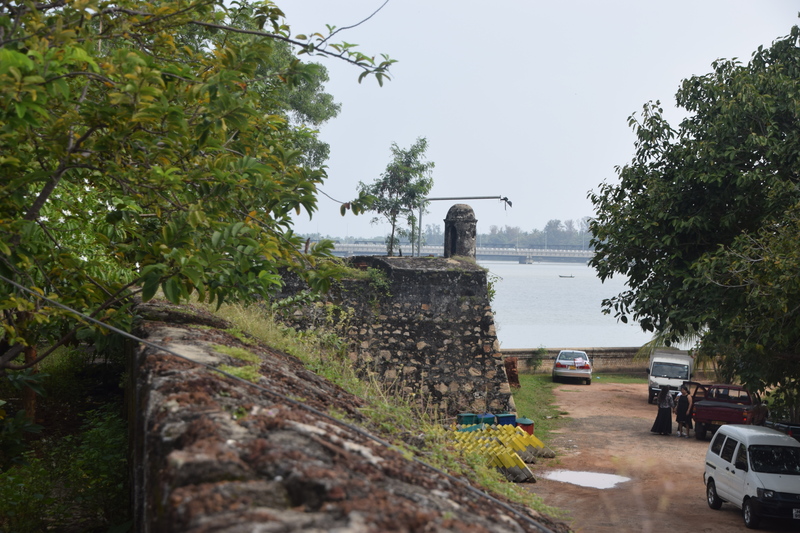 Within the fort, there are administrative buildings still being used, however the outer bastions of the fort are sadly crumbling away. 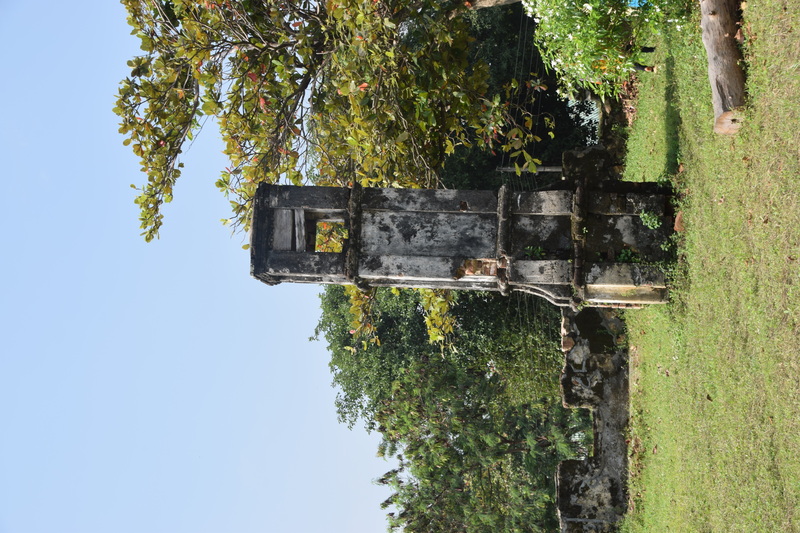 We did see a cannon dating back to the British rule in Sri Lanka and a ruined bell tower. 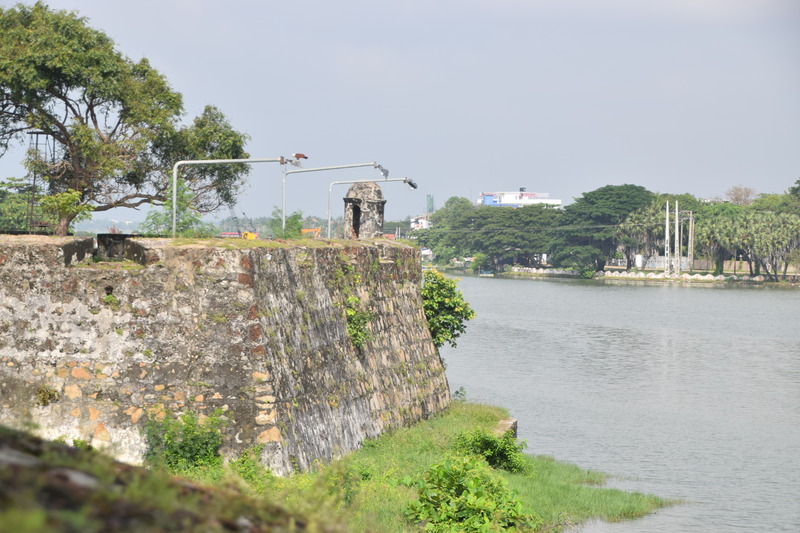 None the less, the view from on top of the fort across the lagoon is magnificent. After taking some pictures we were ready to resume our drive. 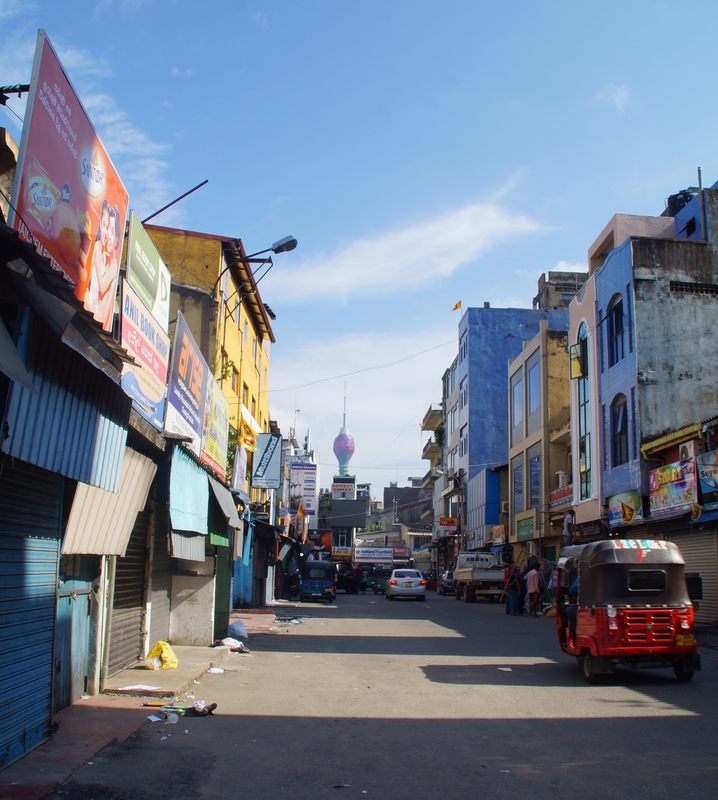 Indika had the choice either to go back to our starting point and pick up a good road to Kandy or take the road which was more direct, however part of which was in a bad state. We chose to take the latter……. 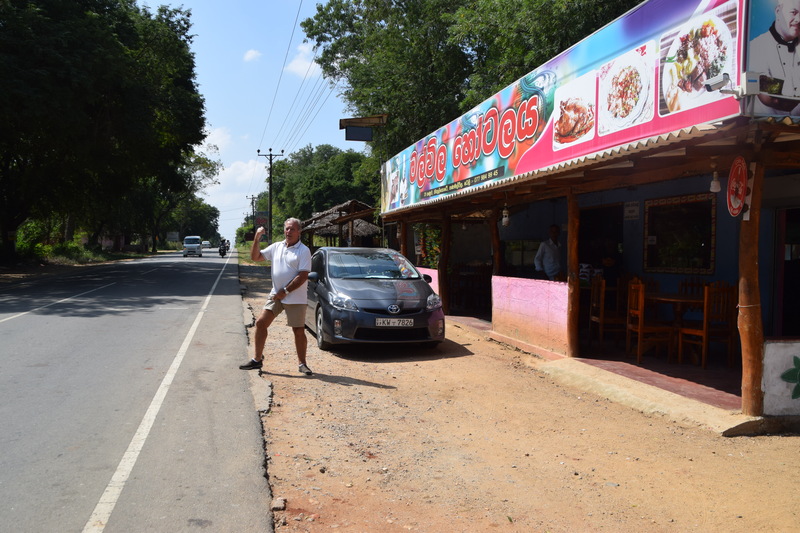 After about 80km of really bad road, which incidentally,is being repaired and widened, we stopped to stretch our legs and some refreshment at a wayside (government project) restaurant manned by women only and selling local snacks. 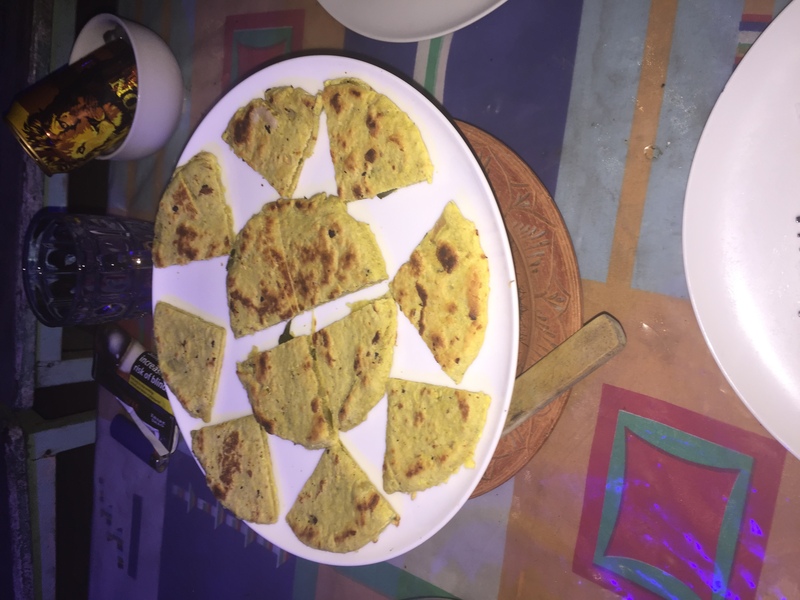 We were served our herbal roti with coconut and pepper Sambal on a banana leaf in a wicker basket. Every woman had her own cooking unit so we had to go to another unit to order our fresh papaya juice. No napkins but a sink with running water to wash your hands after snacking. And this is the first time ever on this trip and in a long,long time since I’ve been travelling that I had to use a hole in the ground in the toilet …….. all was clean and well maintained and when I came out the woman looking after the restrooms just said one word to me with her big smile – money – ain’t showed me the palm of her hand – there she had written 50 rupees! Well, I thought, back home if I use the restroom at a fuel station, I normally pay €0,50 but then of course we have proper western toilets there; that’s the difference! 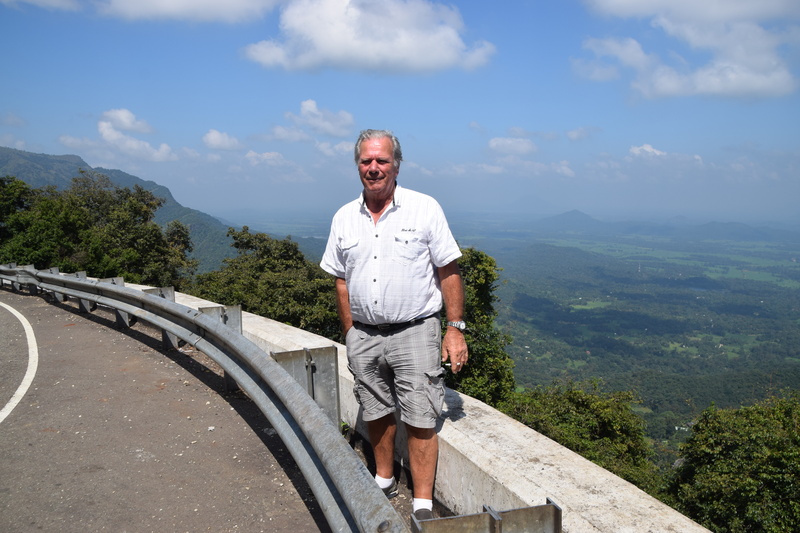 Back on the road again, we were soon on another good road leading us to Kandy – we had taken some 2.5 hours to drive 85km and we still have some 100km to get to Sri Lanka’s previous capital city. 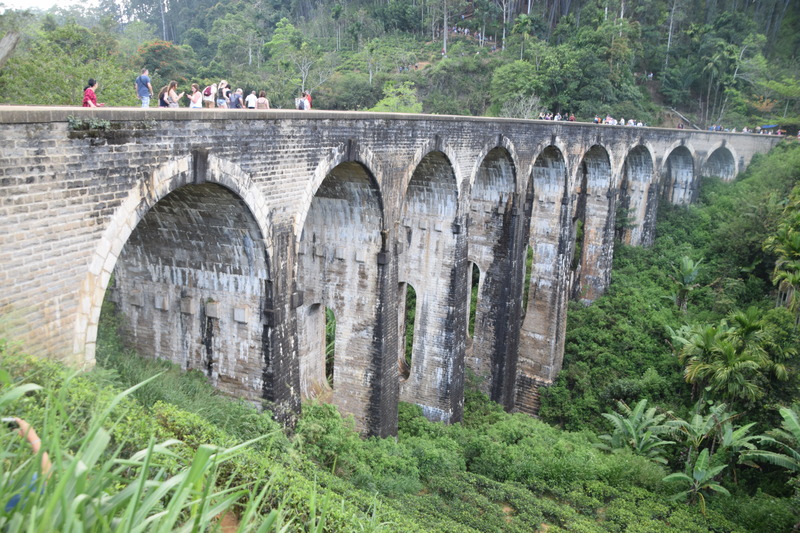 According to Indika, it should not take us more than 3 hours to get to Kandy. This part of the drive was quite interesting as we then were driving through the mountain range – it was uphill, downhill, hairpin bends and at one time we came to a signpost saying that we would be driving along 18 hairpin bends as we climbed upwards and the view was even more breathtaking with each bend in the road. 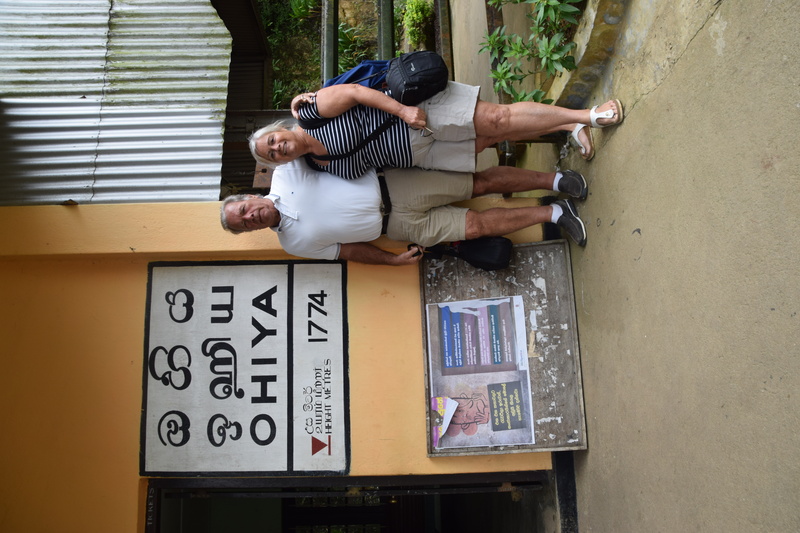 Soon we saw the sign that Kandy was only 10km away…… great we would soon be reaching our next stop at Haranthi House which was situated in the hills just on the outskirts of Kandy. We stopped on the way to admire the view. 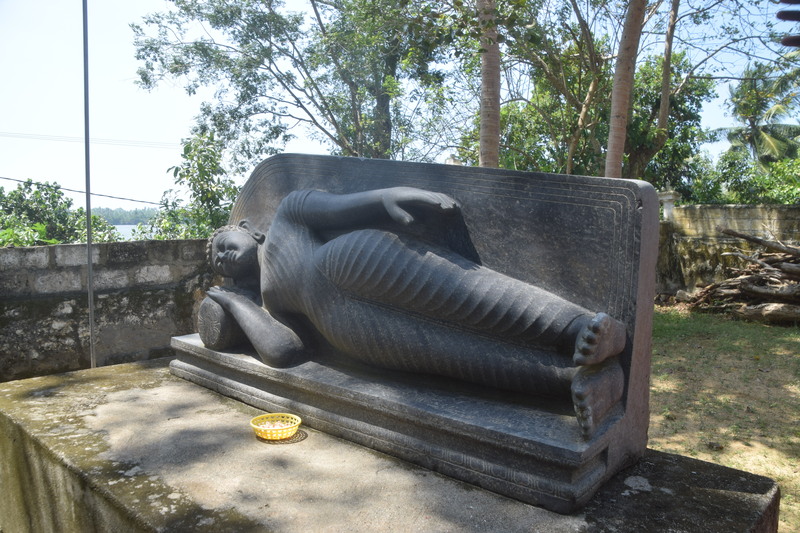 As we were quite high in the hills, we had Kandy lying at our feet – the lake being the center point with a statue of Buddha high up on the left hand side. The last few kilometers were exhausting – we were all tired and Google maps seemed to have sent us to the wrong direction – we ended up by the Kandy hospital…… Indika phoned up the guest house and the last couple of kilometers we were guided by the guesthouse owner as we were going up a winding narrow road….. and finally there was Haranthi House. 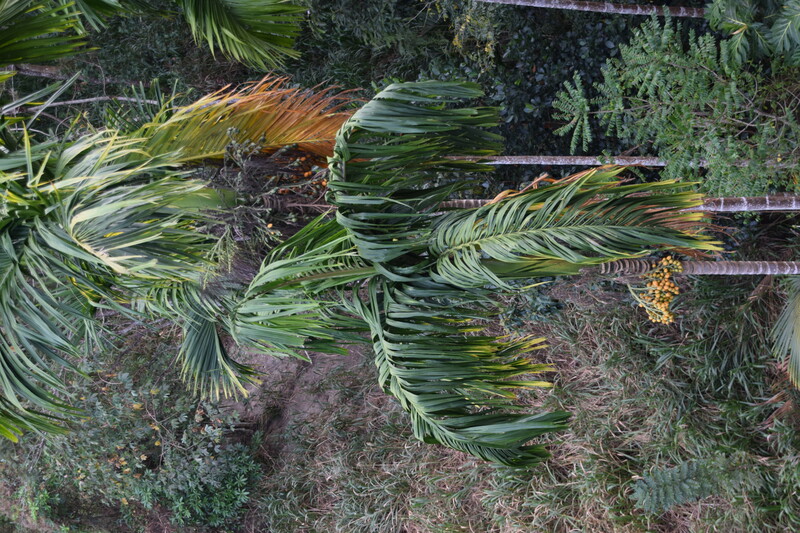 We were welcomed by the host and his wife with a glass of fresh mango juice and we were shown to our room which had a magnificent view over the hilltops covered in palm trees – it was an oasis of peace and tranquility. Indika left to get to his own overnight place and we were going to have dinner at the guesthouse. We had dinner with two other couples staying at the guesthouse. One couple was from Italy and another younger couple from Denmark. We all chatted together and shared our experiences and gave each other tips as what to see and do. By 10.30 pm we had to call it a day and went up to our room – we were both dead tired and needed our well earned sleep. 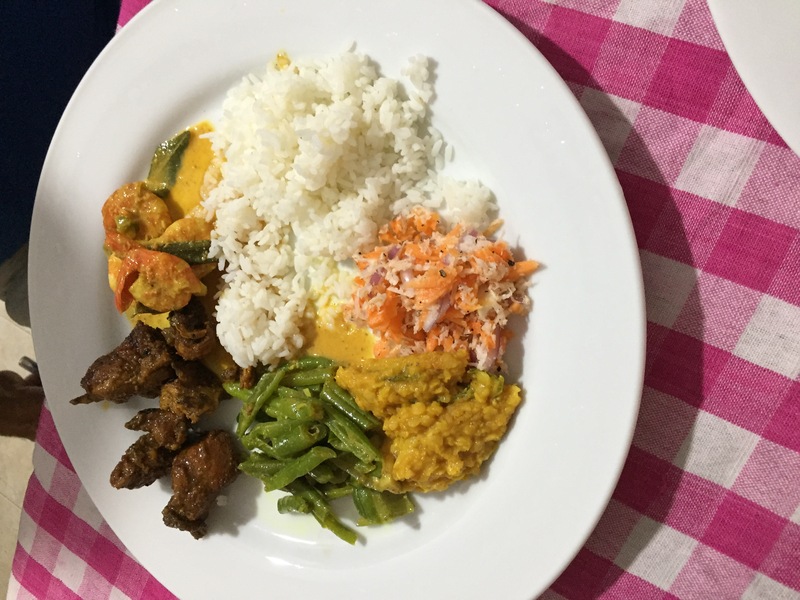 Our dinner:Sri Lankan rice and curry – very tasty! We won’t be having any uninvited guests in our bed tonight! 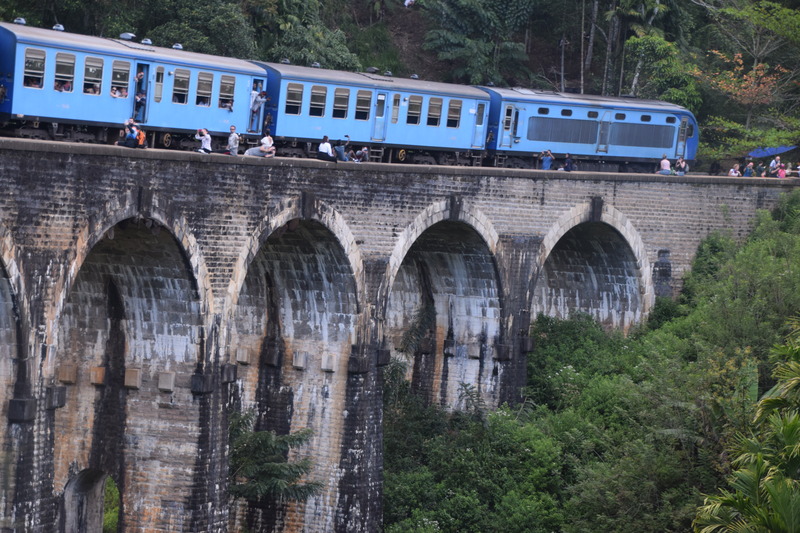 Tomorrow Indika will be picking us up for our tour of Kandy!